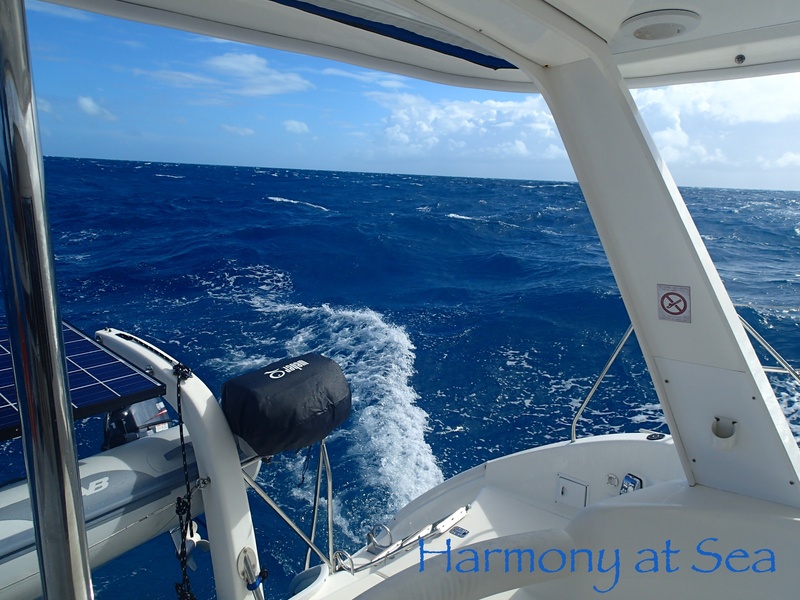 Harmony at Sea | The Adventure begins! A couple of mornings ago we awoke with a nasty electrical storm over us. Being on the water lightning is not something we like or enjoy, especially if it strikes right beside us like it did this morning. Wylie immediately began to check the electronics to see if everything was working. Unfortunately the wind instrument that provides wind speed and direction had stopped working. 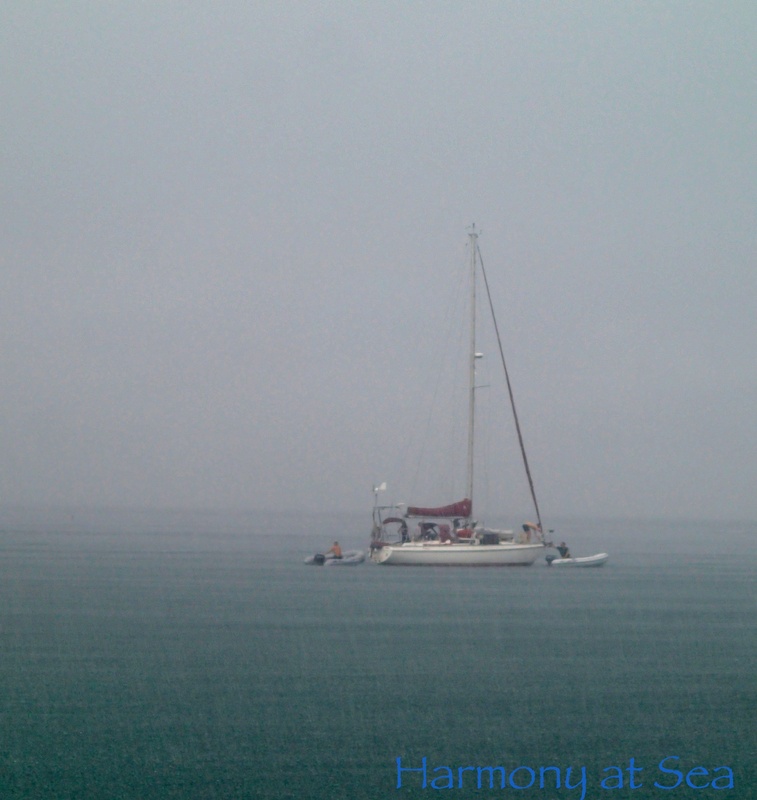 Our friends from One Love are anchored next to us and we learned from them later in the day their wind instruments were also not working. 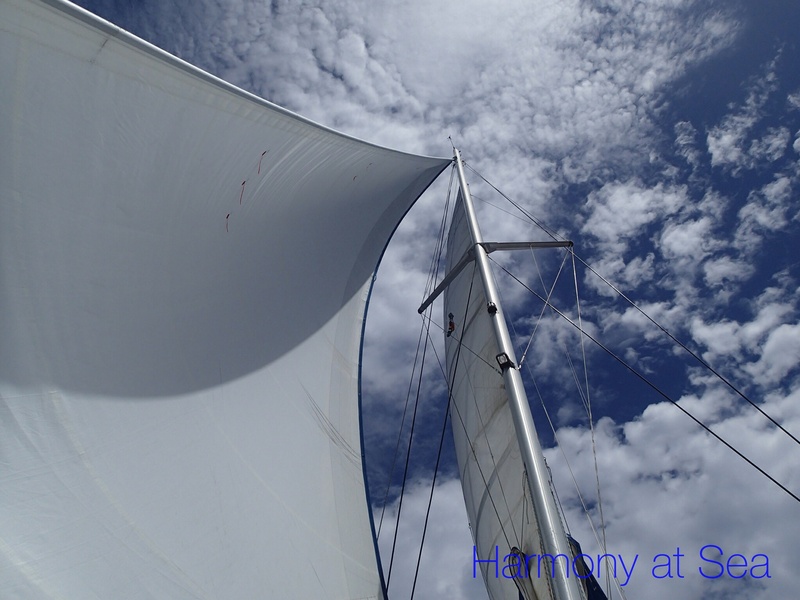 Wind instruments have two basic parts: a display at the helm and a transducer which is installed at the masthead. We didn’t know which one was not working. 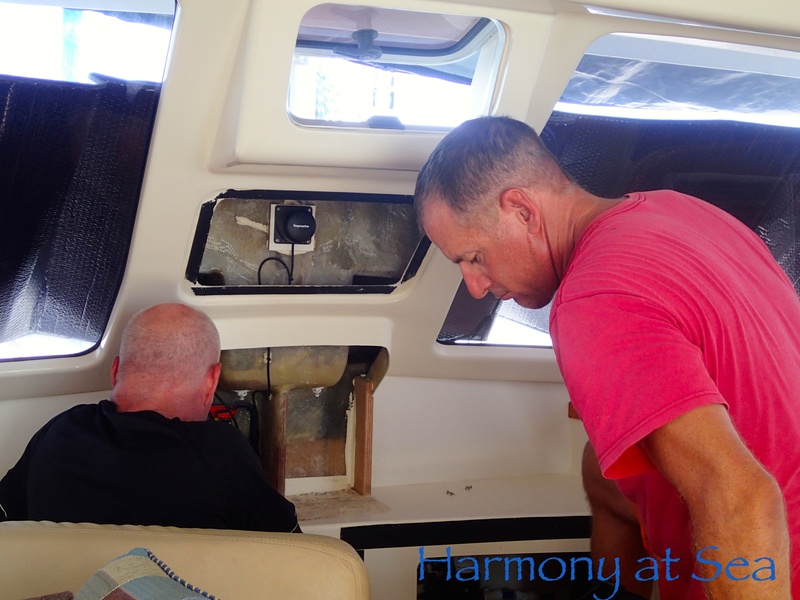 Mike from One Love did a quick round of troubleshooting on his boat and ours and was able to determine that both had broken in the exact opposite way. 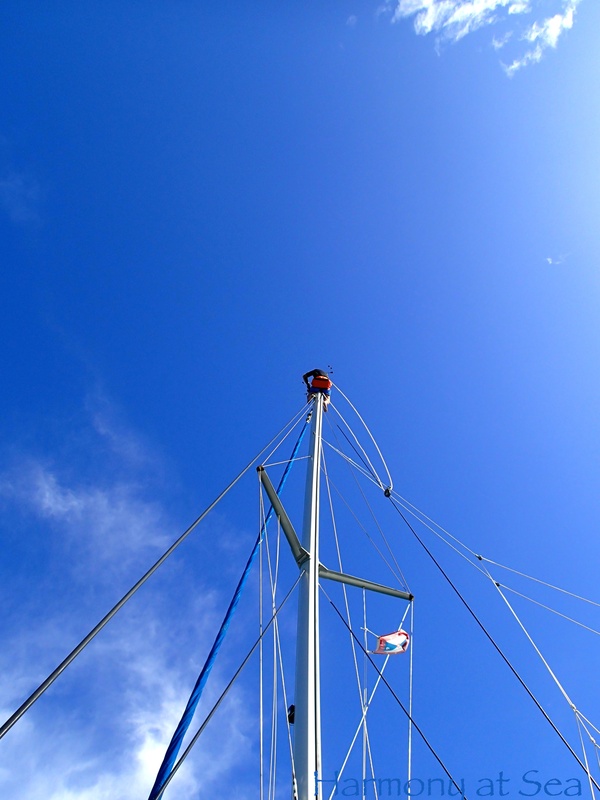 One Love’s problem was the helm display and ours was the transducer at the top of the mast. A very weird coincidence! Additional details are available at Mike’s blog Zero to Cruising Budget marine didn’t have just a display, or a single transducer in stock. They did have the complete wind instrument package containing the parts needed by both us and One Love. We decided to buy the entire package so One Love could get the display they needed and we could get the Transducer. 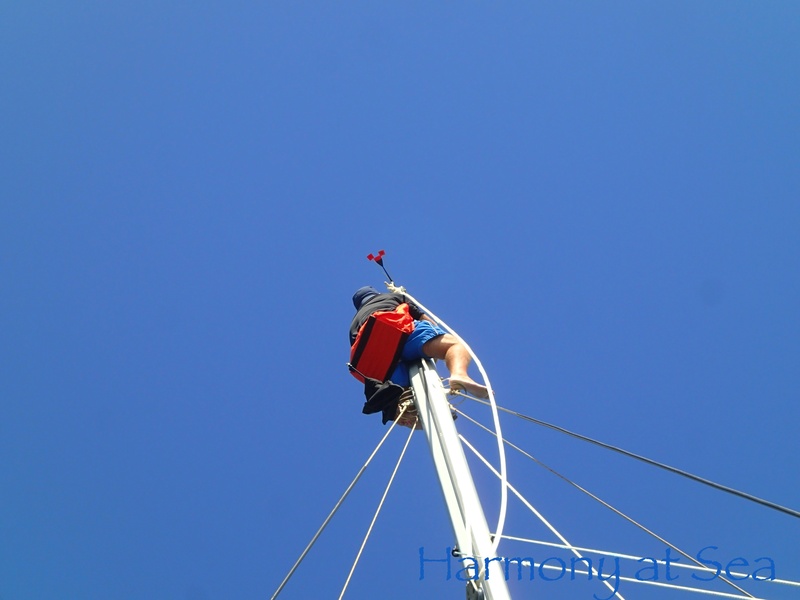 With help from Mike and Rebecca, and a borrowed bosuns chair from Jeff on Truant III Wylie was able to go to the top of the mast and replace the damaged transducer. 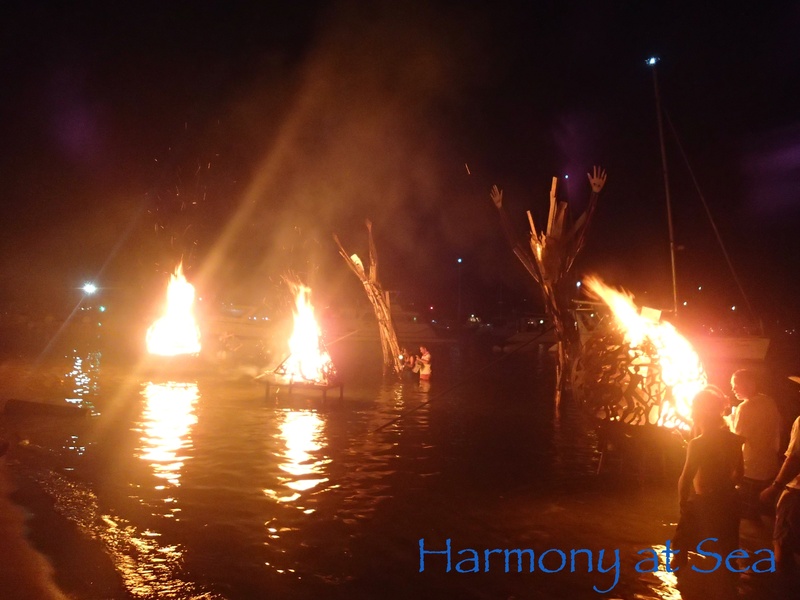 Thankfully all went well and both Harmony and One love once again have fully functioning wind instruments. It is a relaxing weekend, not too many activities planned, and the perfect time to get in front of my computer. Thanks to my friends Sue and Mal from http://www.suemalkoolkat.wordpress.com I have homework to do. 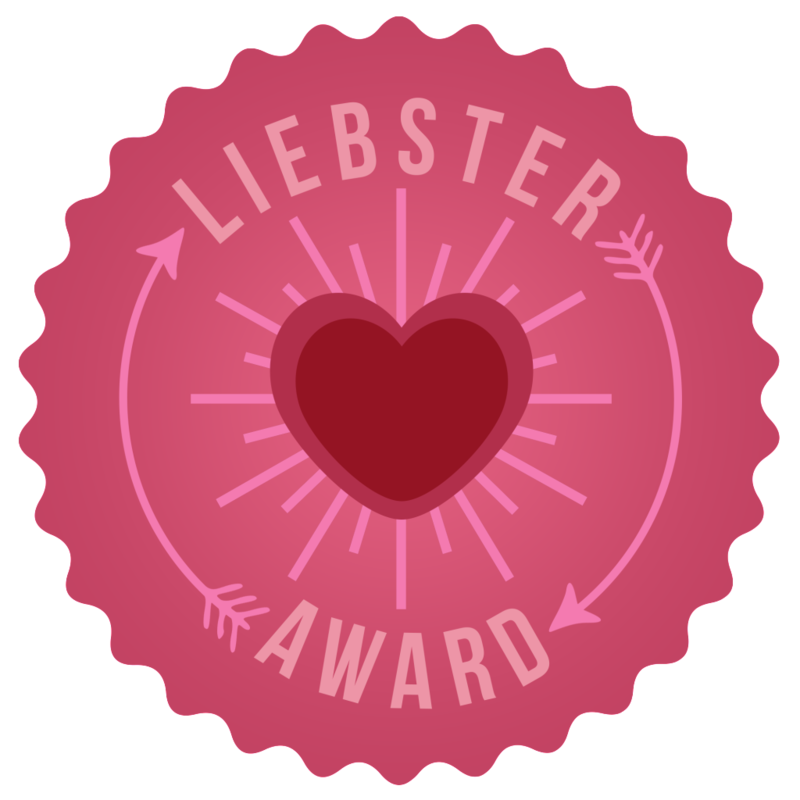 They nominated our blog for the Liebster Award, so I have several questions to answer. The Leibster Award is the bloggers version of a chain letter. Each blogger answers 10 questions created by a previous blogger and then create 10 questions of their own to send to 10 other bloggers. If the nominated bloggers choose to participate they answer my questions, come up with their own, and send them on to ten others, and so it goes!!! The award is normally given to new bloggers (like us), and I just could not say no, I had to take the challenge and have some fun with it together with my hubby. I’m curious as to what his answers to the questions will be. 3) Nominate 10 up-and-coming blogs and provide them 10 questions to answer. 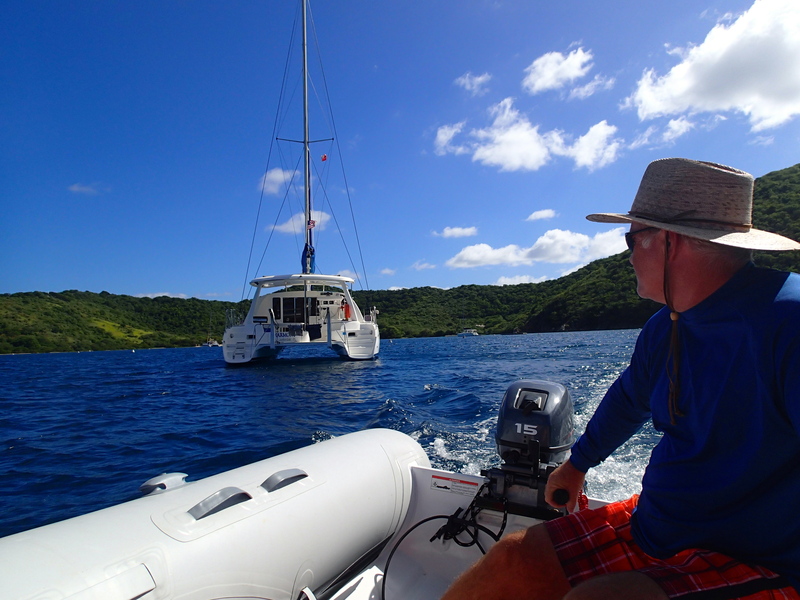 What is that special something about your boat you love? Maggie: I love having the galley up, I can enjoy cooking, or doing dishes at the same time I socialize with everybody outside. 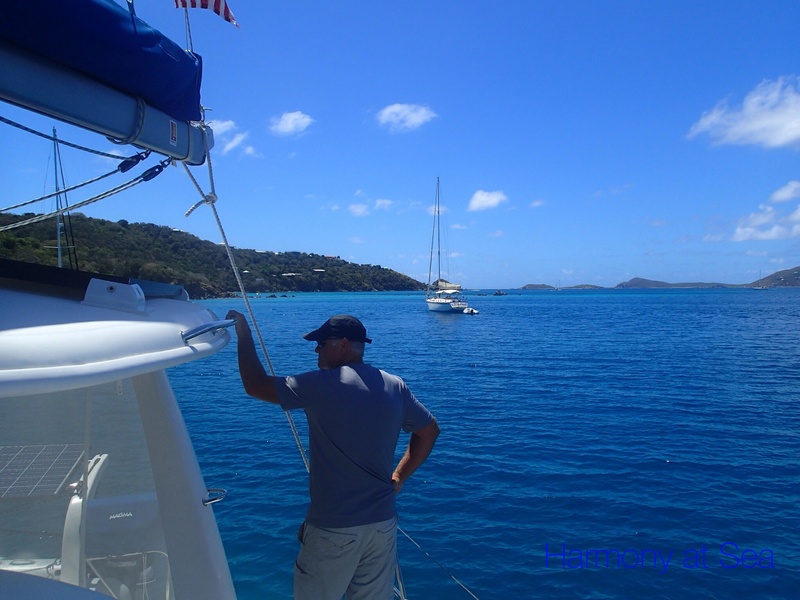 What is the hardest part for you living 24/7 on the boat? Wylie: Forgetting the ketchup. 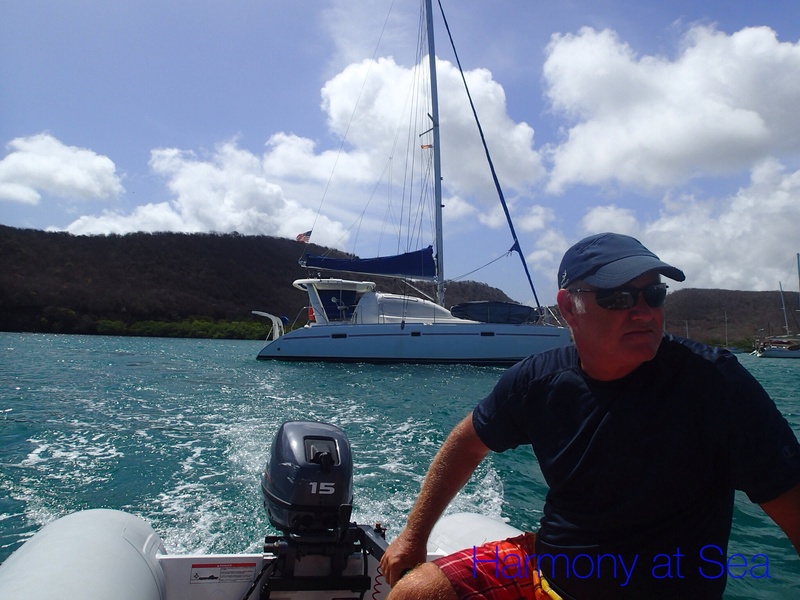 Or anything else for that matter that is followed by a long dinghy ride to the nearest marina with a dinghy dock leading to a road that leads to the place of purchase which is just over the next hill for the forgotten item…. that unfortunately they are out of. Maggie: Hardest? Mmhhh not using high heels ha ha..ok ok being serious, I think for me it’s not being able to take long showers. I do not like to have to get in and out fast. We have a water maker but I still have to be reasonable with the amount of water I use. 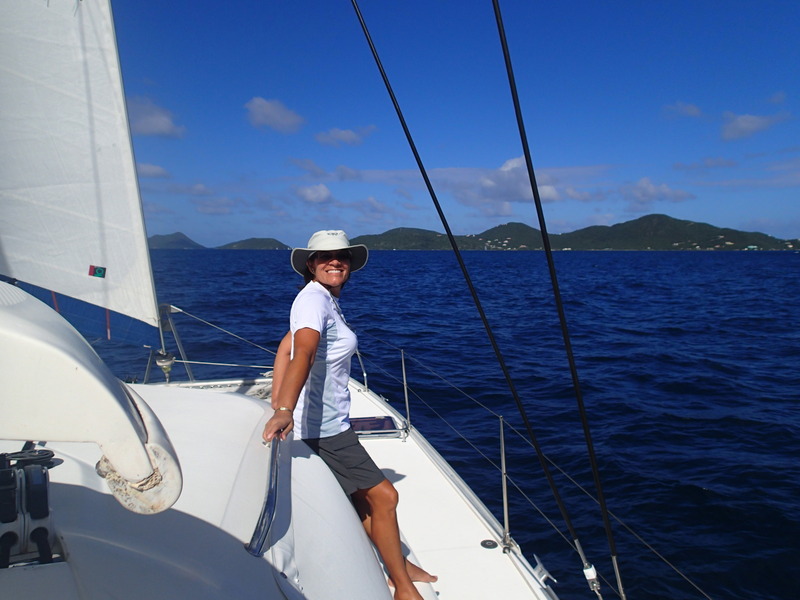 What helped you decide to take up this cruising lifestyle? Maggie: For me it was Wylie. This was his dream and he wanted me to follow him so he took his time telling me all about it, reading blogs to me, having me read some blogs. We talked about the pro and cons of the lifestyle. We studied together so I could pass the ASA tests. 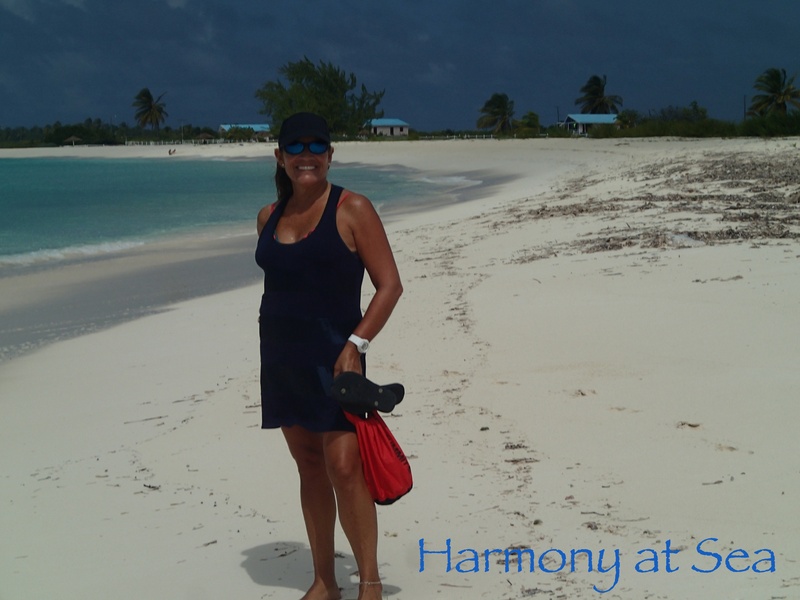 We chartered a boat in Abacos to make sure it was something I would enjoy. He did a great job convincing me and I love living aboard!! Wylie: Too many Jimmy Buffet records. Honestly I really do not know where or why the thought of the lifestyle came to me, but for as long as I can remember I have known it was something I was going to do. 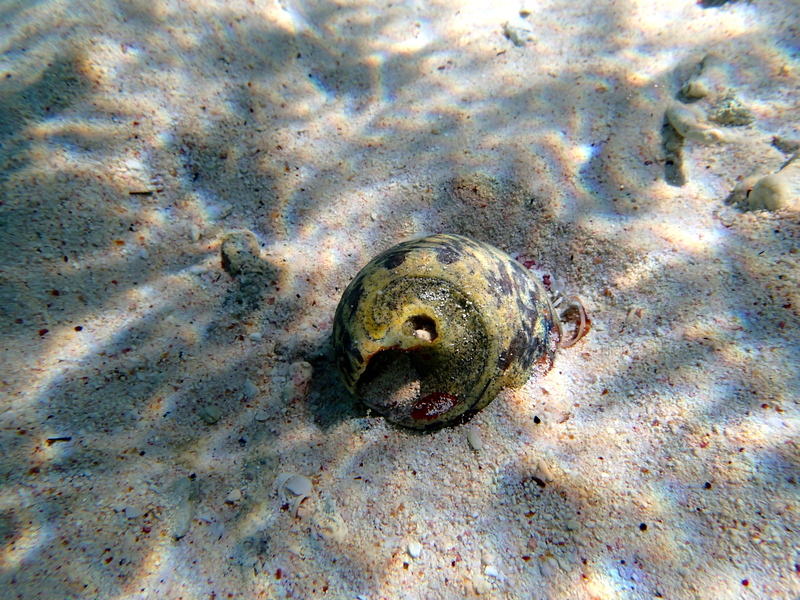 If you could offer some pearls of wisdom to newbie cruisers, what would it be? Maggie: “pearls of wisdom” I like the expression 🙂 ..Be patient, there are moments in this lifestyle that you will need to be. There are going to be a lot of changes that you will need to adapt to. 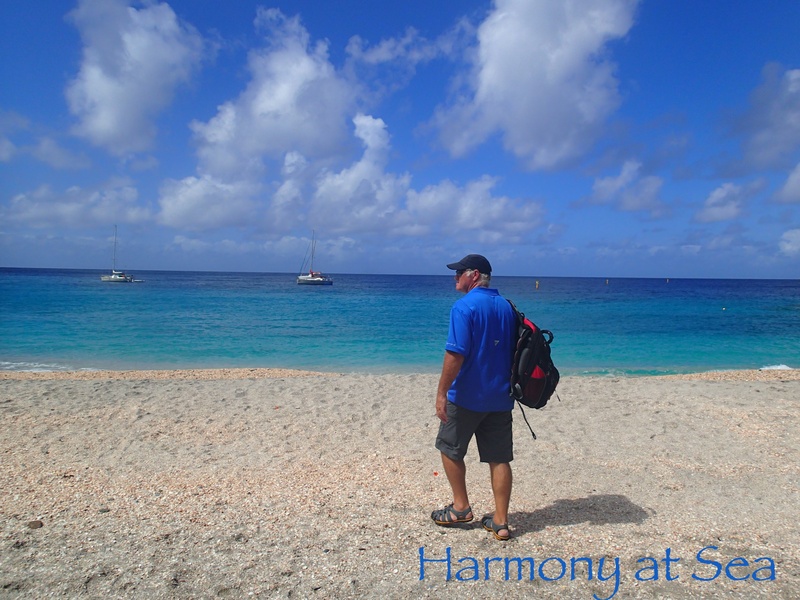 One by one, take your time and you will enjoy all this lifestyle has to offer. 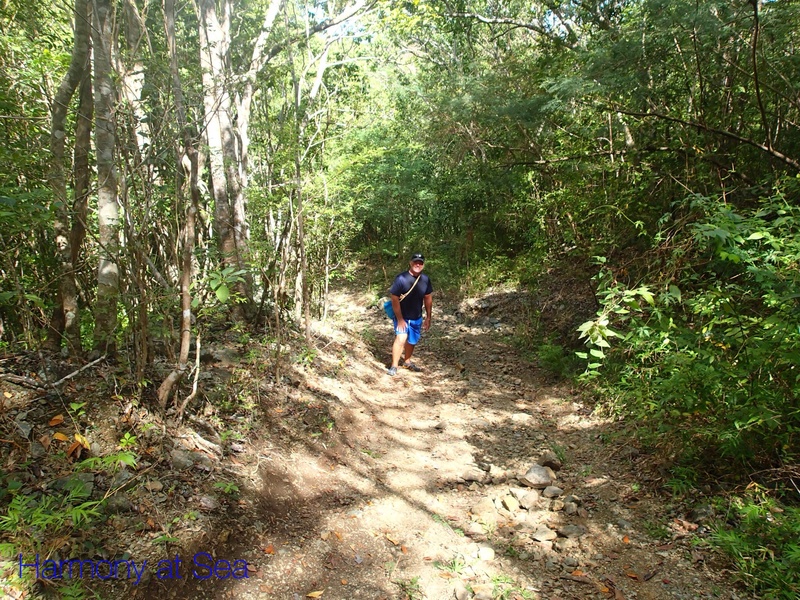 Wylie: Bring two pairs of running shoes. One old pair for the hashes, or a new pair if you like drinking beer from a shoe, and one pair for the long walk to the store to get the ketchup you forgot. There may be times when the lifestyle is more difficult than you thought it would be, roll with the punches. There will be times when its more fun than you can imagine. 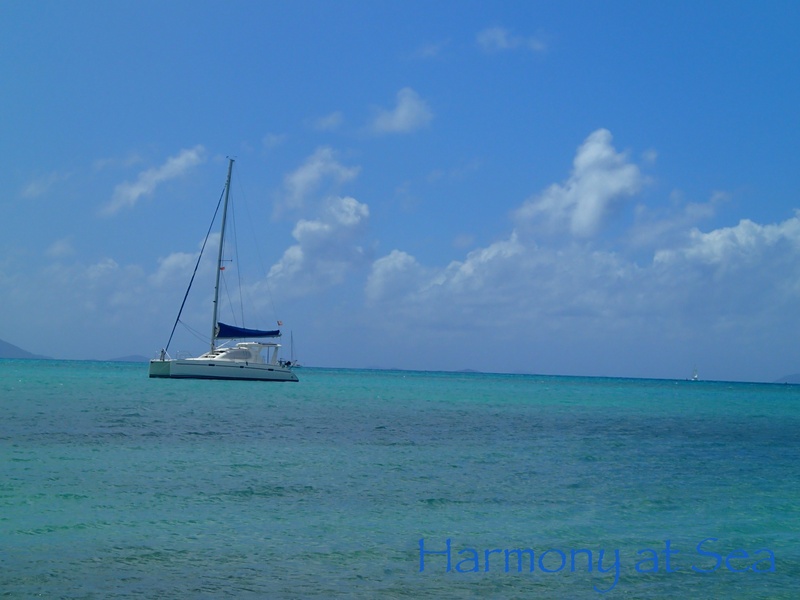 If money was no object and you could make a change to your boat, what would it be? What is something new that has surprised you about your partner since you commenced this lifestyle? Maggie: how innovative/creative he can be. 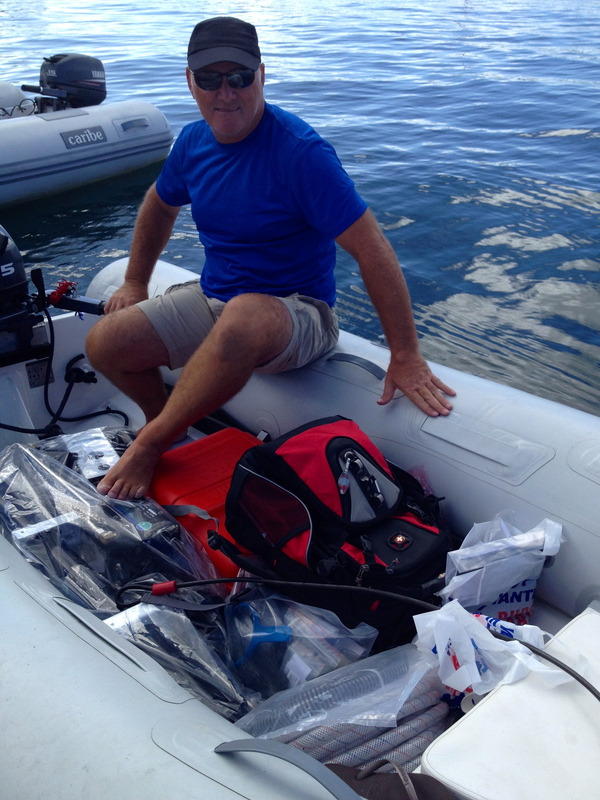 I knew he was handy, but he surprises me every time when he finds a solution to a problem on the boat. 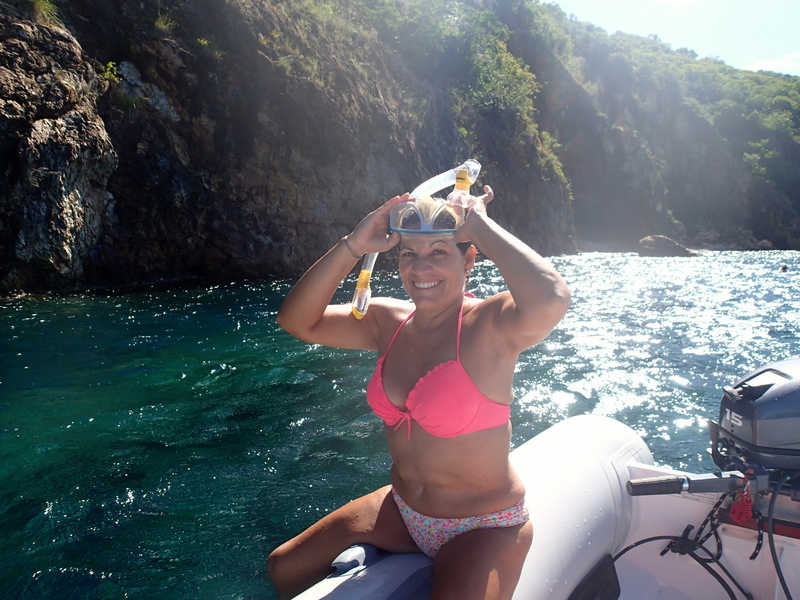 Wylie: How much she has fallen in love with snorkeling. 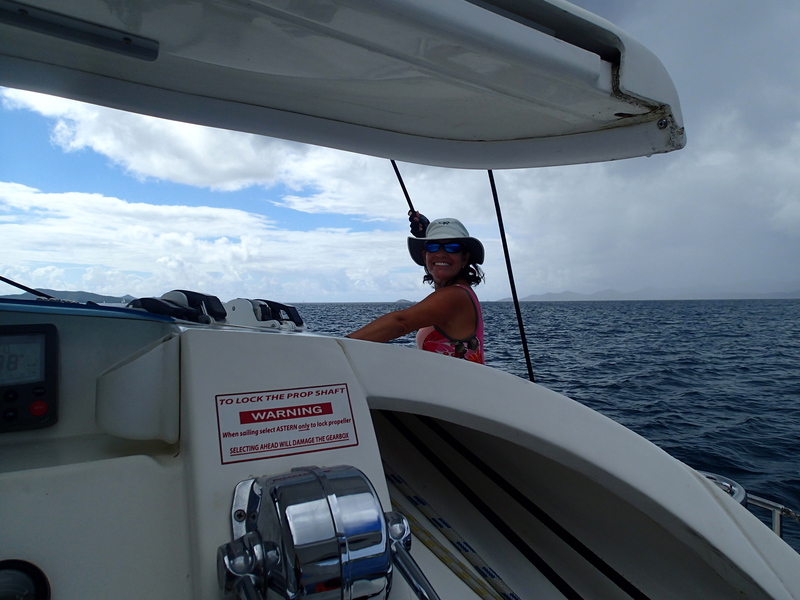 I sometimes need the boat hook to get her back on the boat. Has your initial estimate of how long you’ll be cruising altered since you first started? Wylie: Not at all. 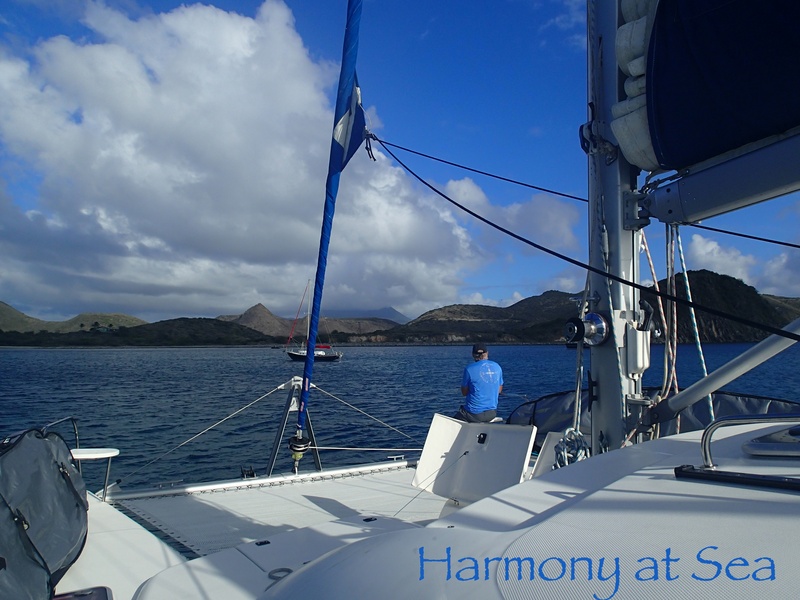 I said from the day we purchased HARMONY We will do this until we feel like moving on to our next adventure, no time limits. 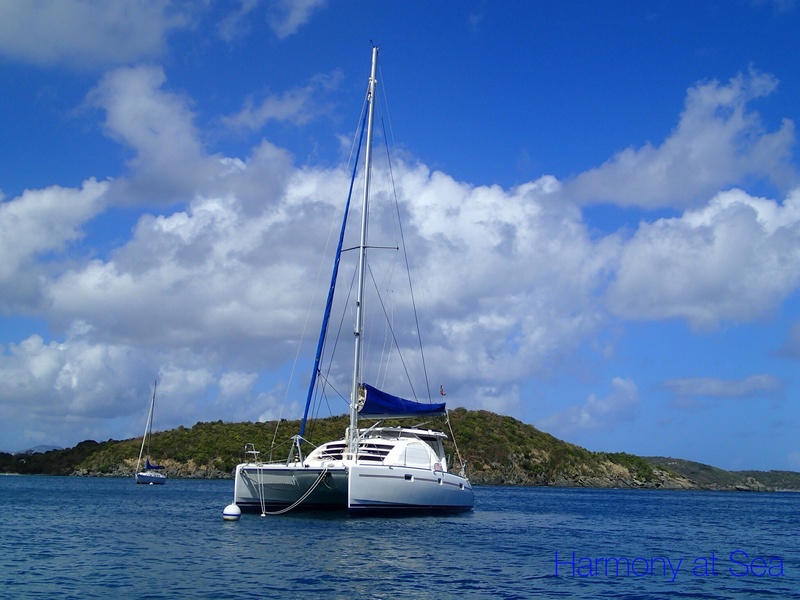 Did you name your boat and, if so, why did you choose the name? if you didn’t, would you like to and what would you choose? 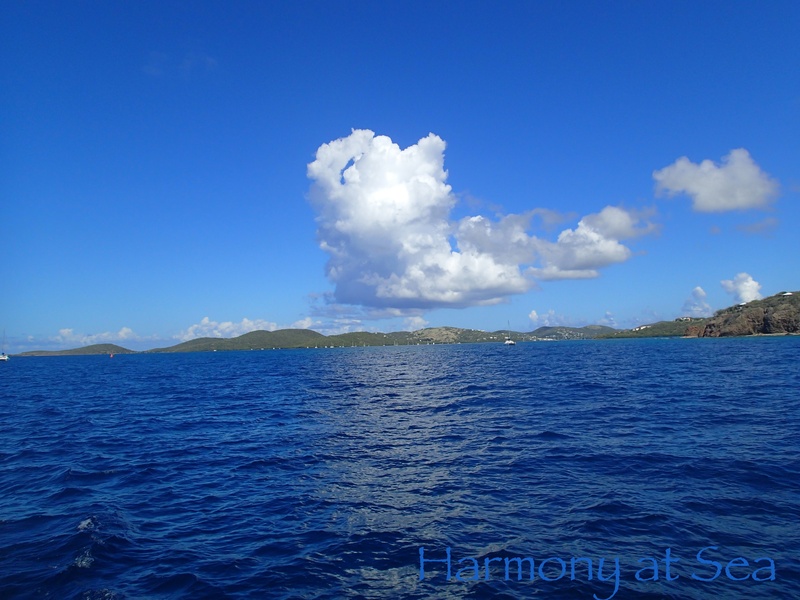 What is your favorite cruising destination to date, and why? 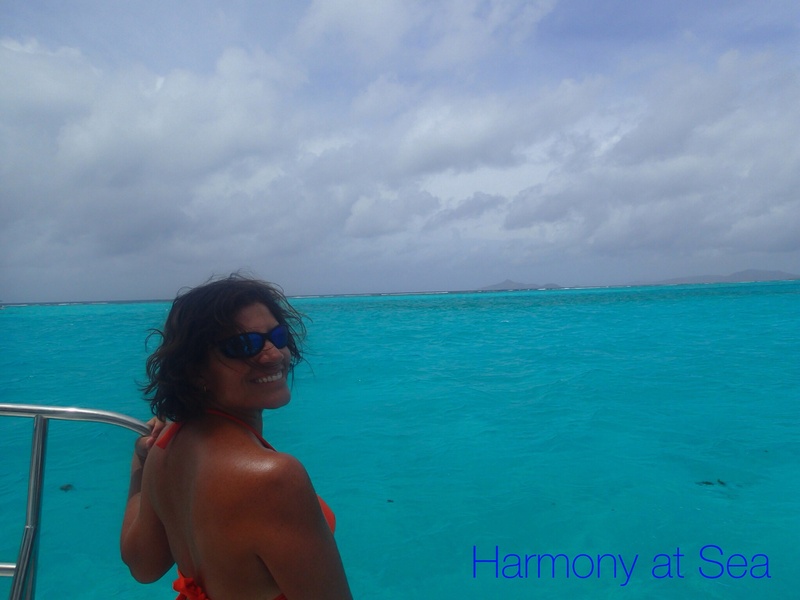 Maggie: Tobago Cays, love the clear waters, perfect for snorkeling, my favorite activity. 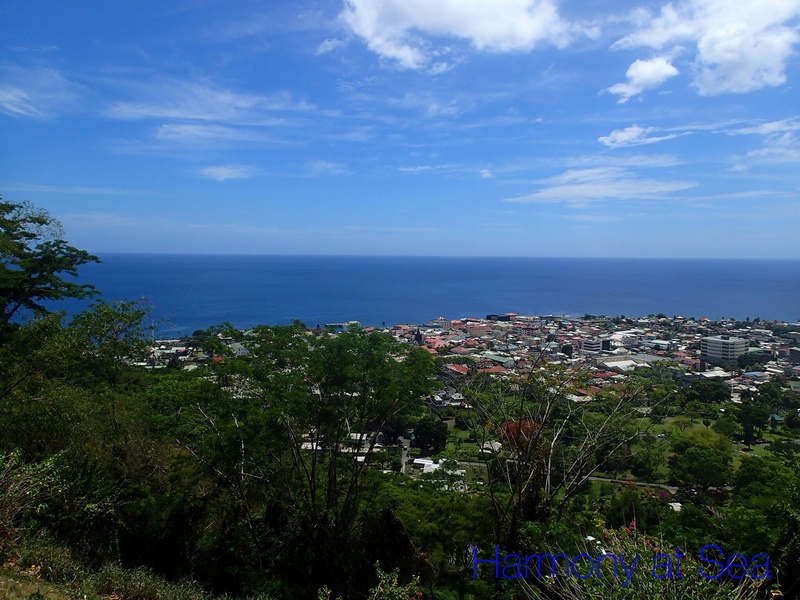 Wylie: Dominica. 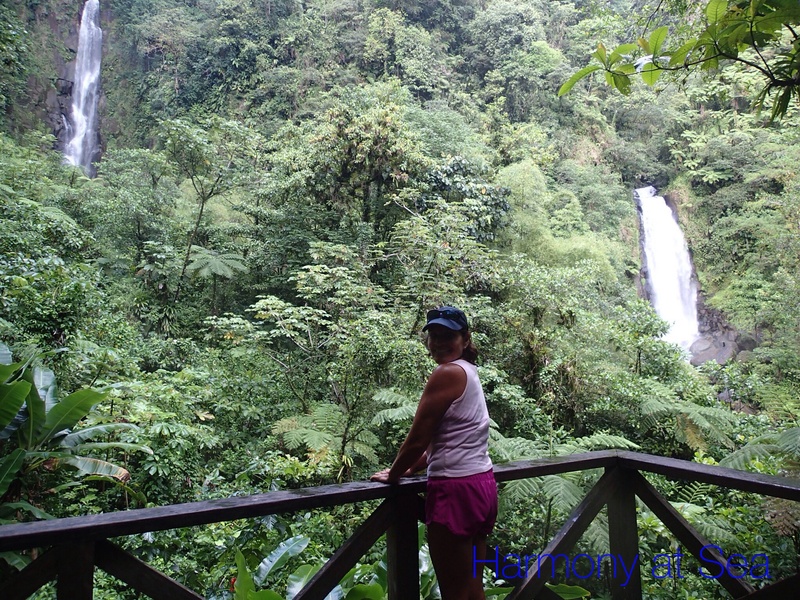 The unspoiled beauty of the rain forest and water falls. If there were one wish a Jeannie in a bottle could grant you now, what would it be? Wylie: A bunch of those multi colored paper umbrellas to put in the frozen drinks the bikini-clad beauties prepare and serve after working on our boat in every anchorage. Denis and LaDonna from http://www.BeagleKnot.com They just created a blog, although it is a charter blog, they are cruisers and they will remain cruisers, so maybe they would like to take the challenge. 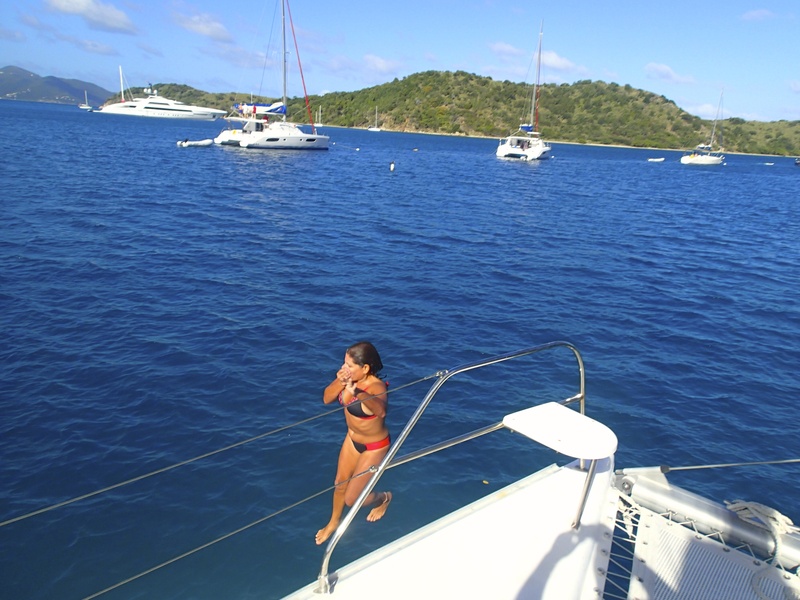 Is there something that you regret not upgrading on your boat? 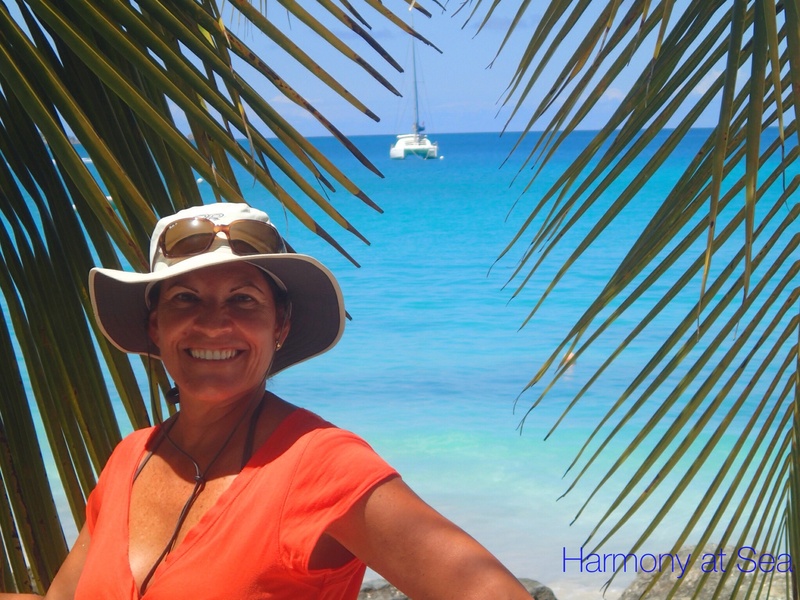 Why did you choose the boat you are cruising on? 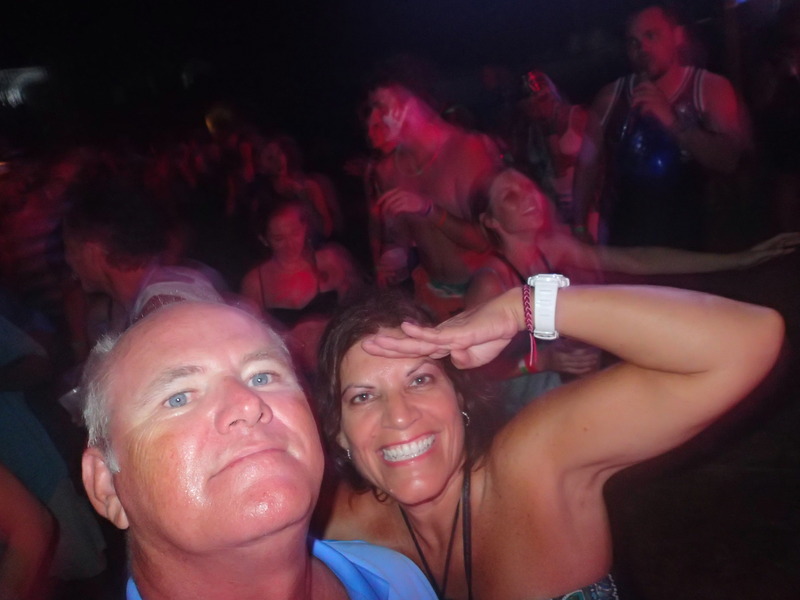 What was your worst mistake during your first days of cruising? 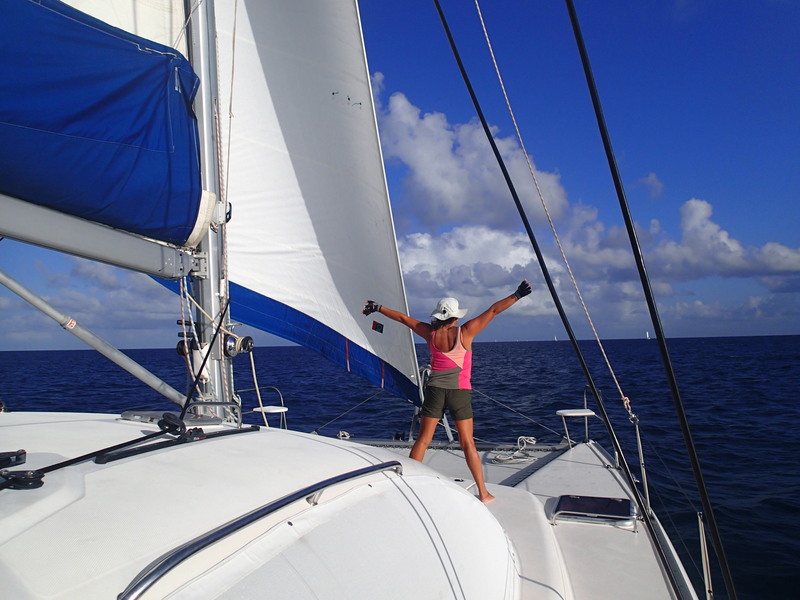 What do you enjoy most about sailing, and why? 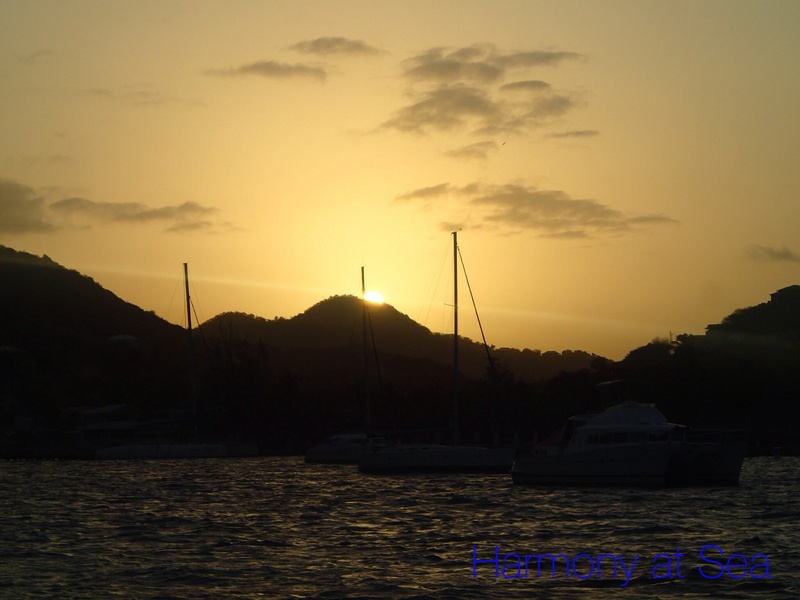 What is the most romantic moment you have had on the boat with your other half? 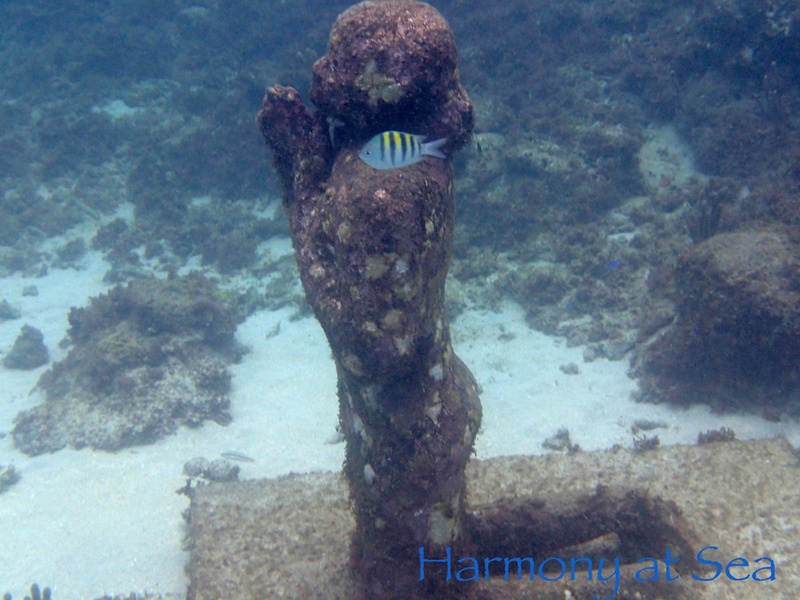 Have your cruising destinations changed from those originally planned? Is there an upgrade to your boat you regret making? If so what is it? 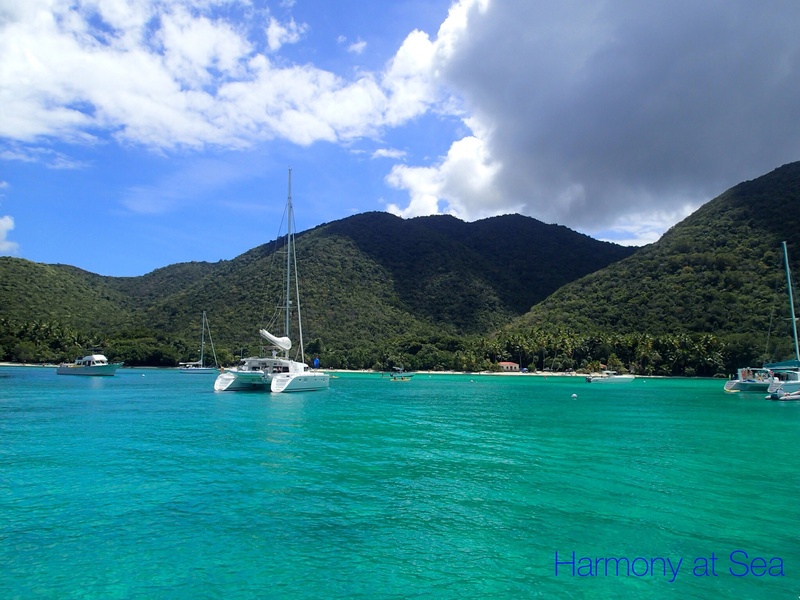 Do you prefer being at anchor or in a marina, and why? If you were being attacked by a giant squid and at the same time the largest Mahi Mahi you have ever seen takes your trolling lure, which would you deal with first? 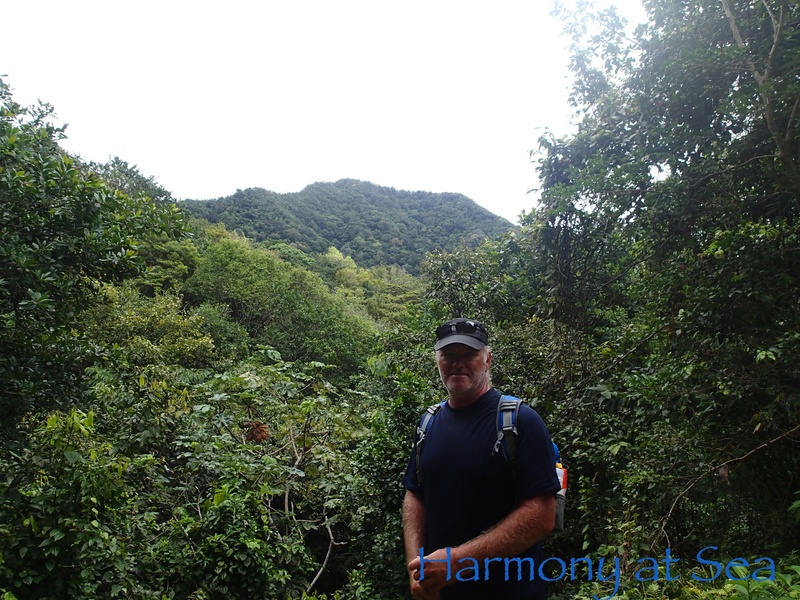 What is the best land excursion you have been on, and why? 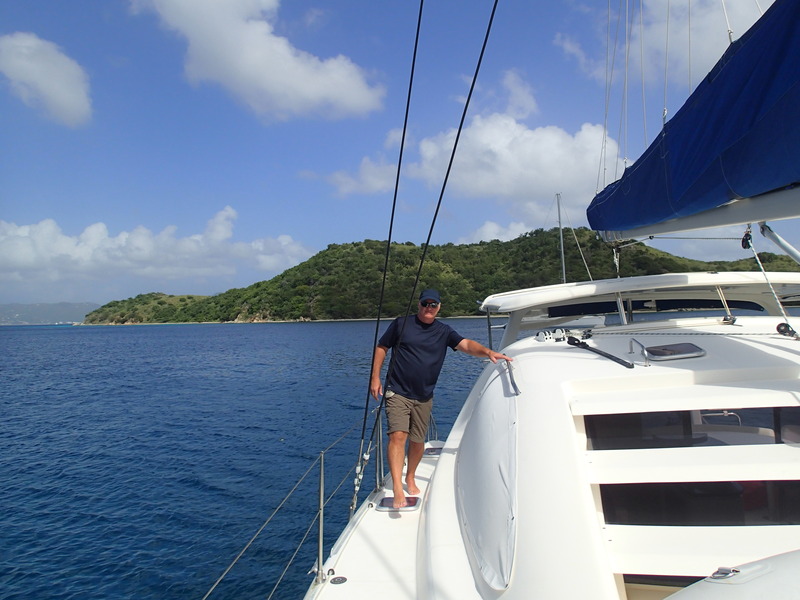 We have been in Grenada, or “Camp Grenada”, as it is jokingly referred to by some cruisers for almost 3 months now. 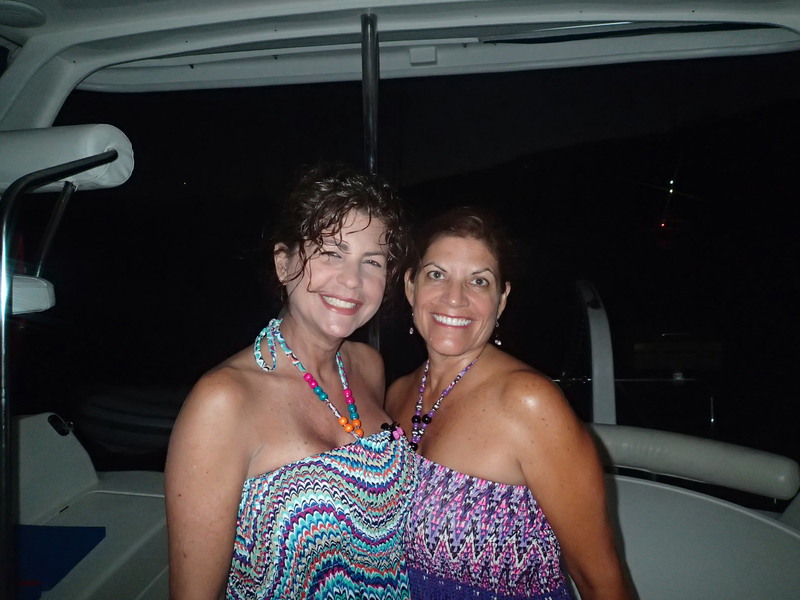 We are having a lot of fun participating in the many activities organized by cruisers. 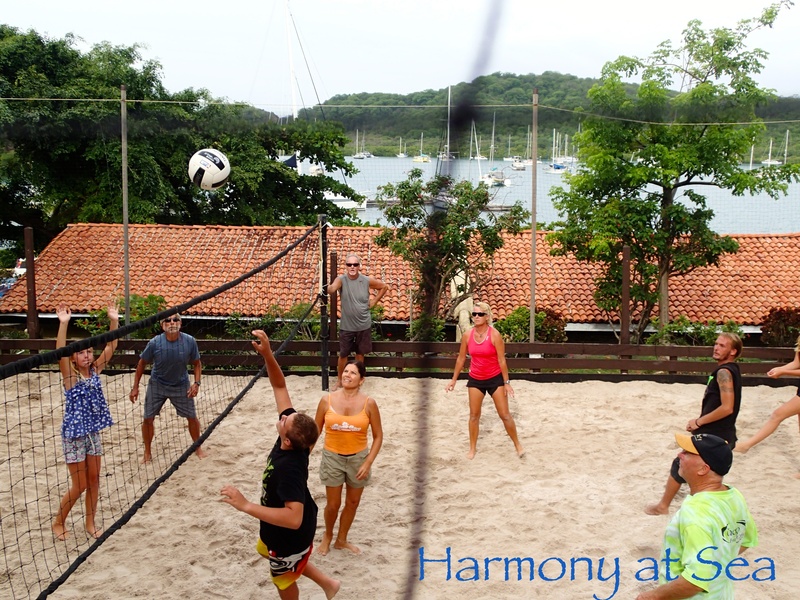 Between Yoga, Pilates and Noodling exercises in the mornings, volleyball most afternoons, music jams, and poker most weeks are full. 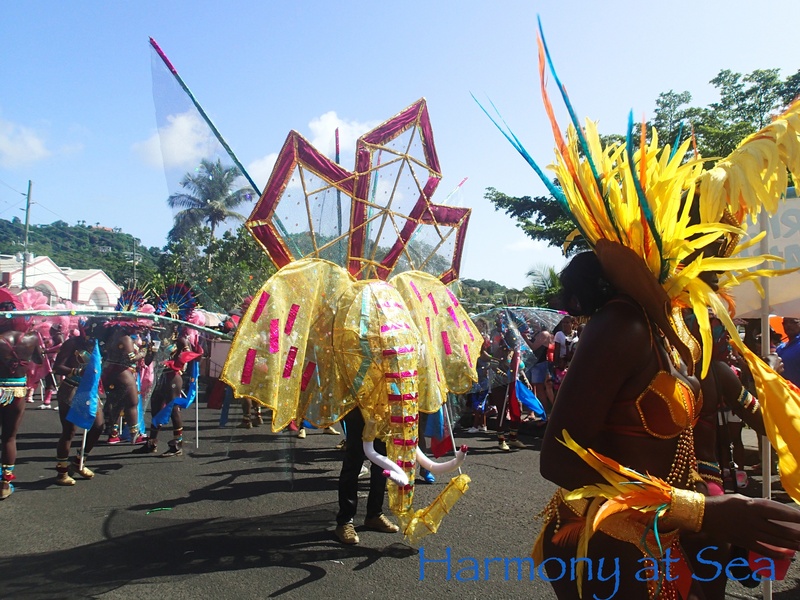 On top of that the Grenadian Carnival Celebration just concluded, it was non-stop dancing and music for 3 days. 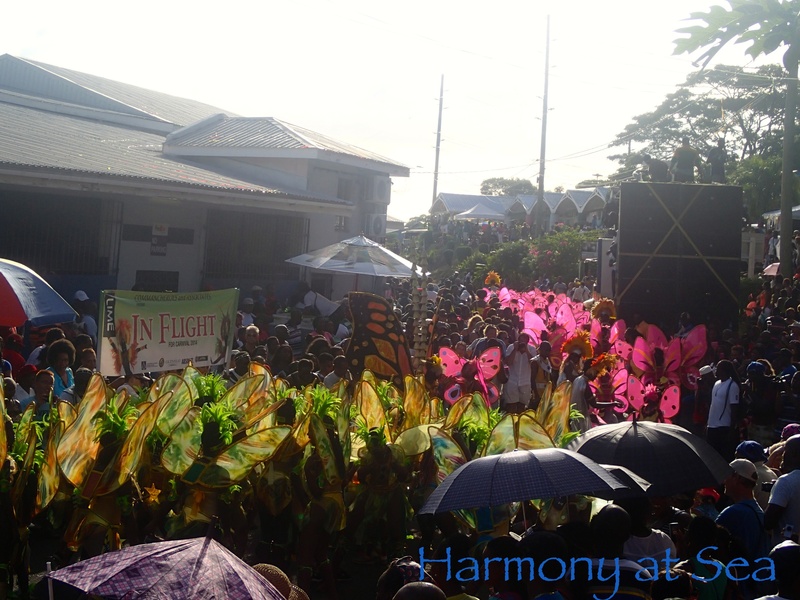 It was very nice to join the locals in this family celebration. 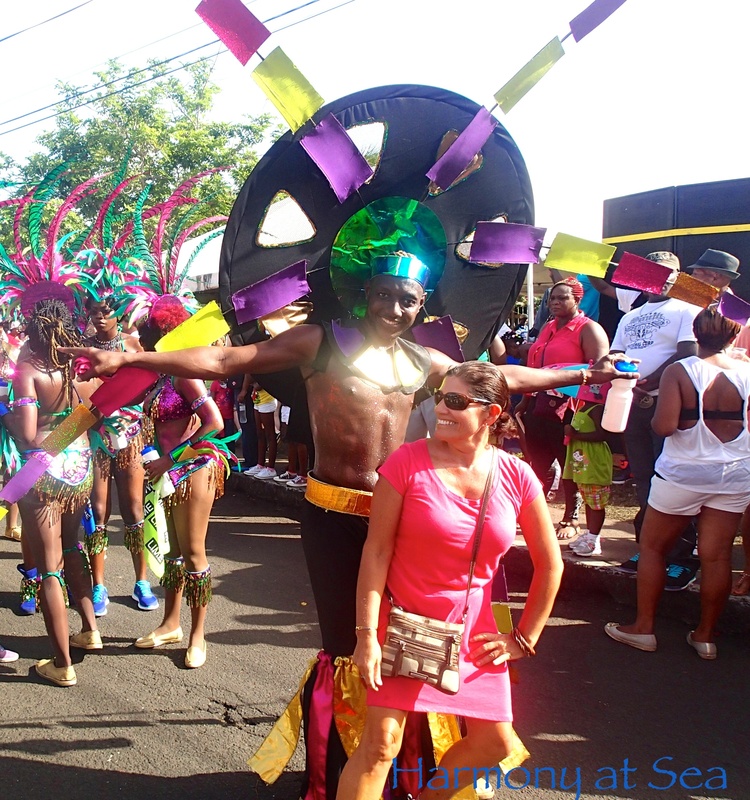 They all come out and follow the colorful parades dancing, smiling, and enjoying the parades. 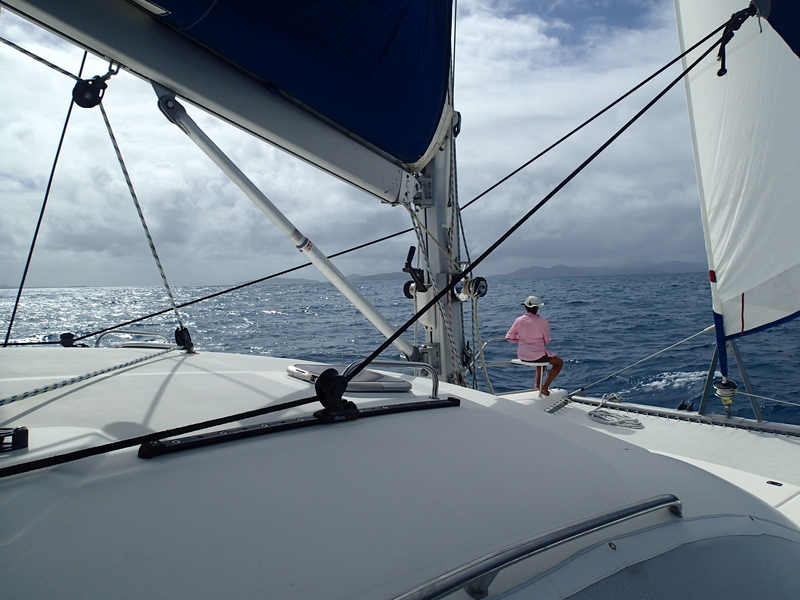 Regardless of how busy camp grenada keeps us we miss sailing. 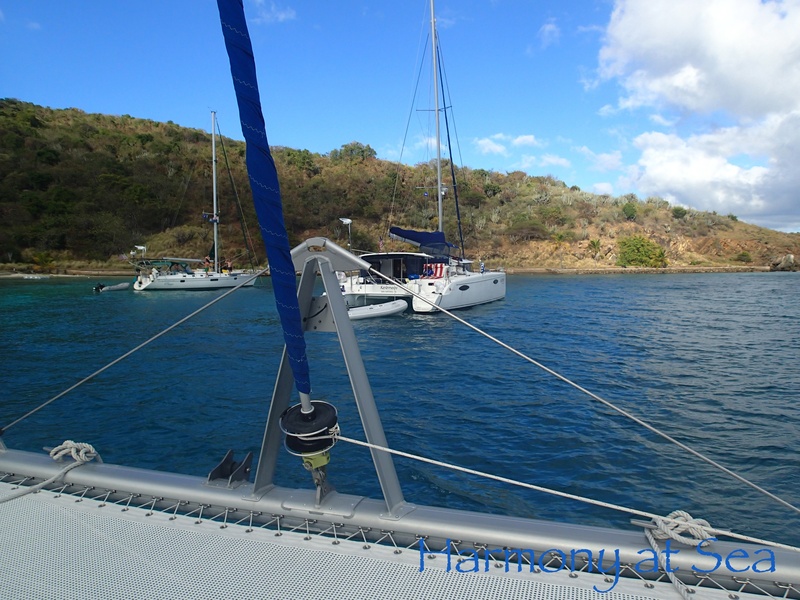 Fortunately we were able to enjoy a brief sail when our friends from s/v Beagle Knot invited us to go sailing with them from St. George to Dragon Bay to snorkel in the underwater park. 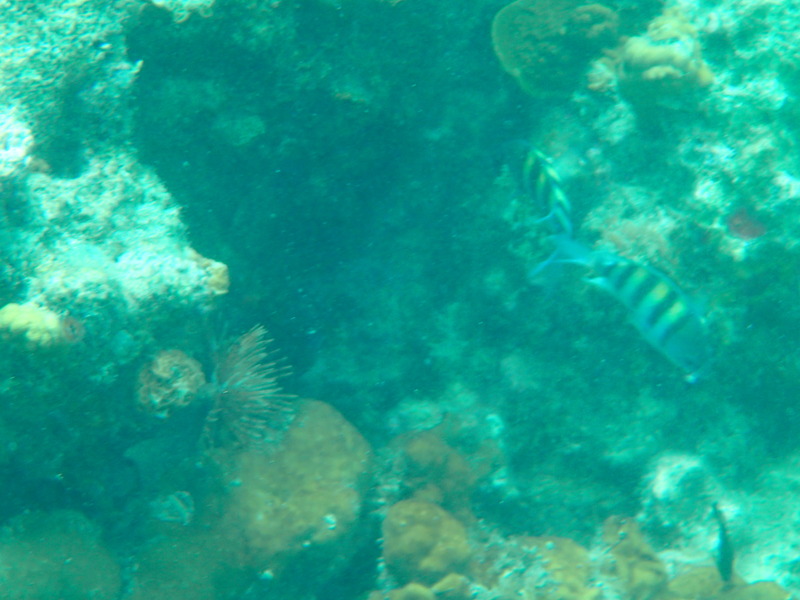 Although it was a short sail it was very pleasant, good wind, great weather and the snorkeling was fantastic!! 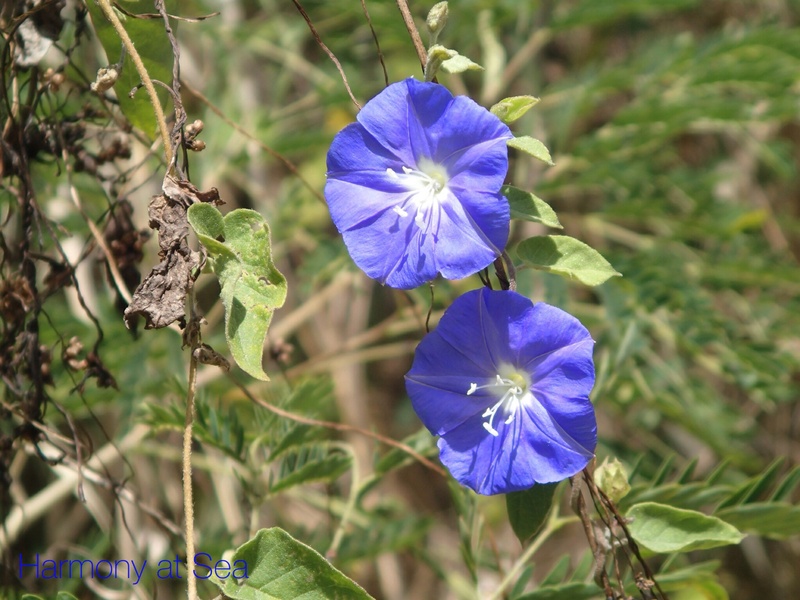 Here are a few pictures of life in Camp Grenada. 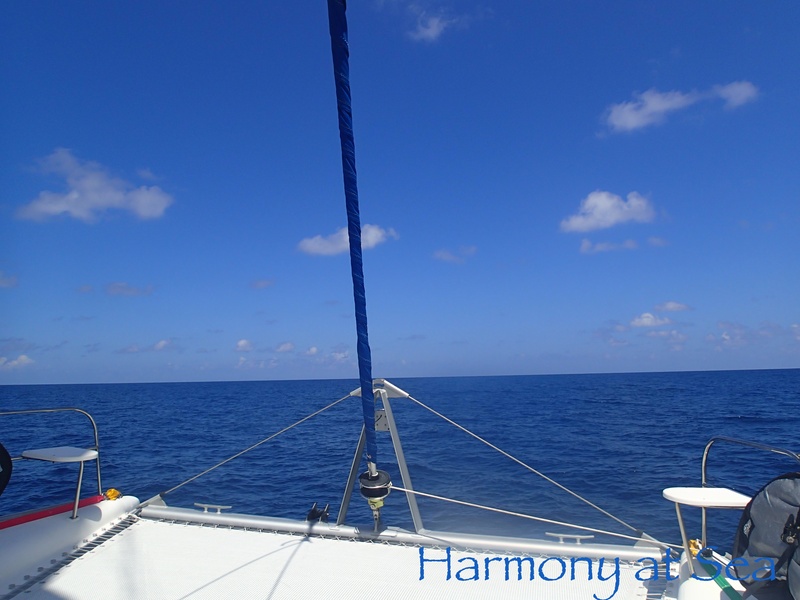 Do not forget to like our Facebook page Harmony at Sea for more status and pictures. 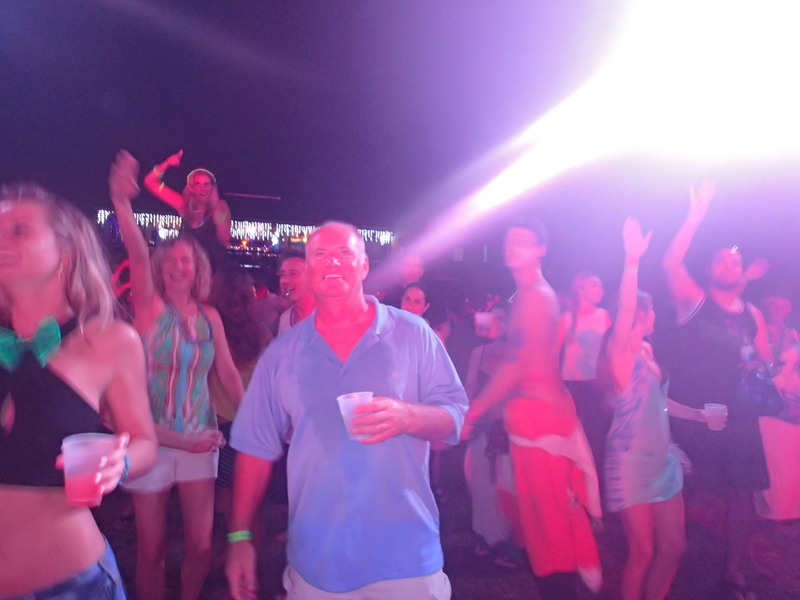 It didn’t matter how old you were … everybody dances! Cold beers after a hot hot parade! 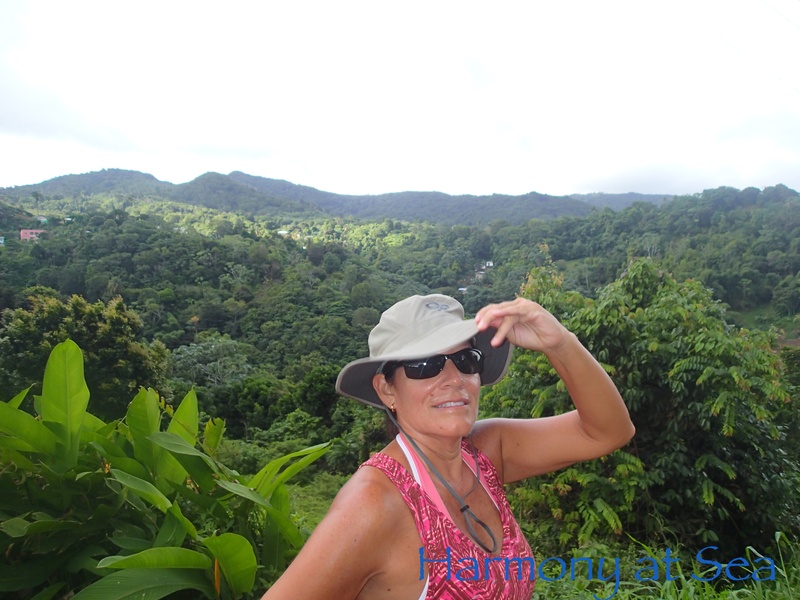 We have had difficulty finding good wifi signals on most of the islands we stopped at so we have not been able to post in a while. 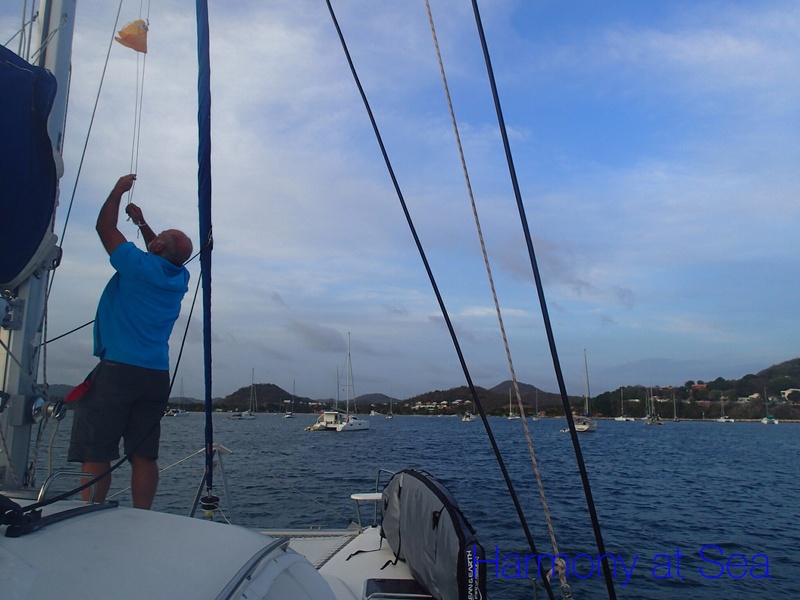 We have also been busy getting settled in our anchorage in Grenada where we plan to stay for the hurricane season. 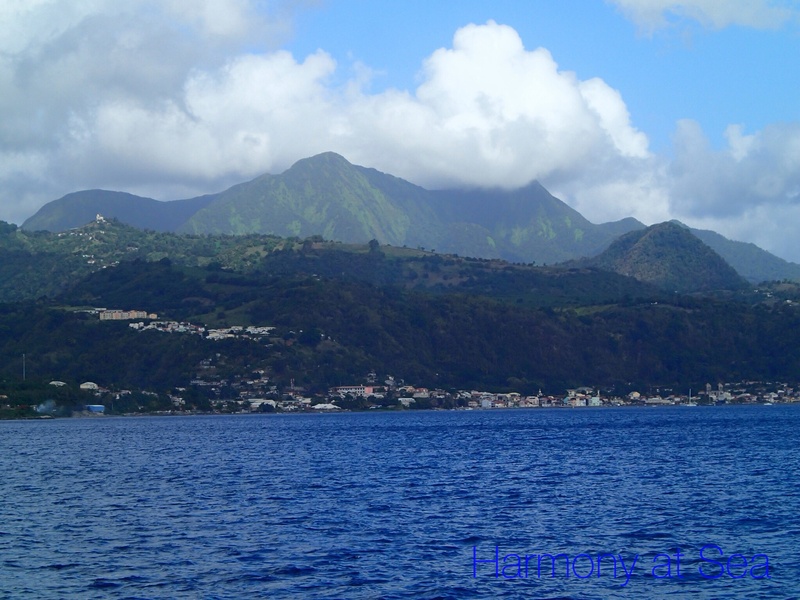 After Nevis, we stopped in Guadalupe, The Saints, Dominica, Martinique, St. Lucia, and The Grenadines. 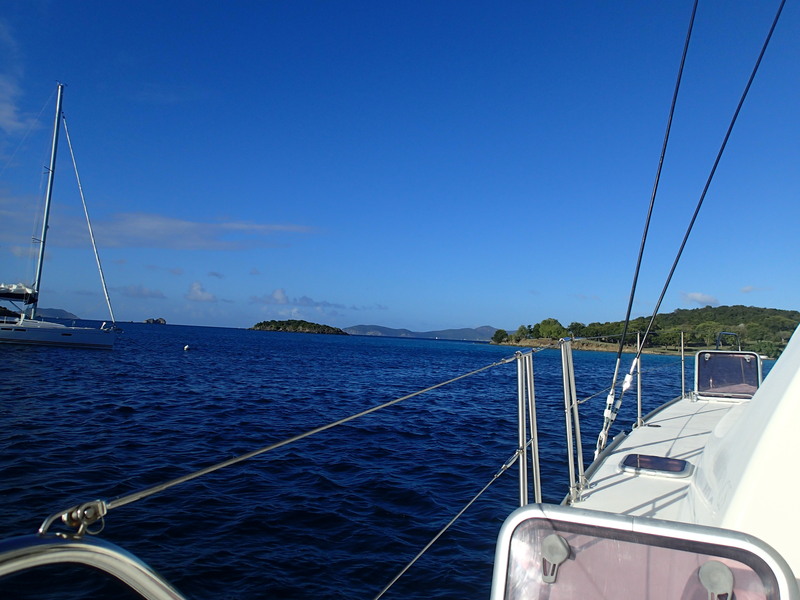 Most of our crossings were very good, we had good wind 16 to 25 knots. 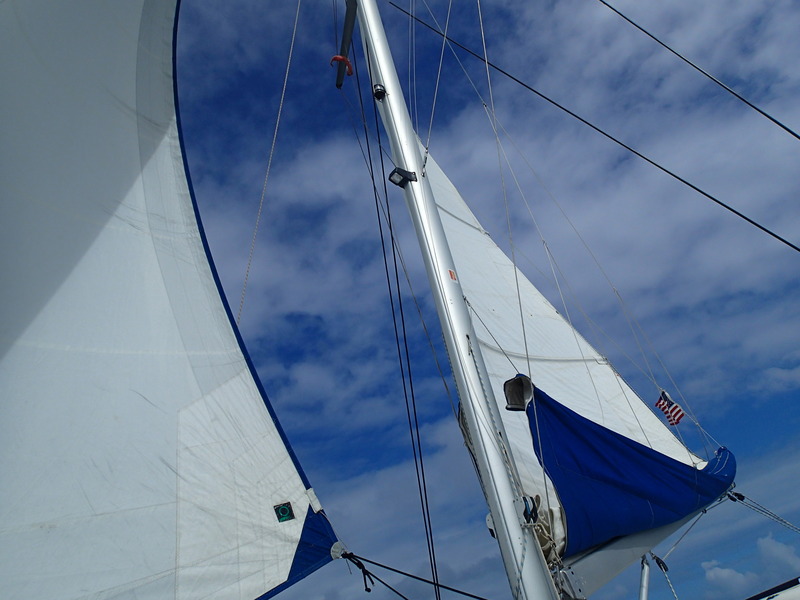 Only a couple of times we had to reef the sails, the wind was 25 to 30 knots with very strong gusts but fortunately they didn’t last too long. 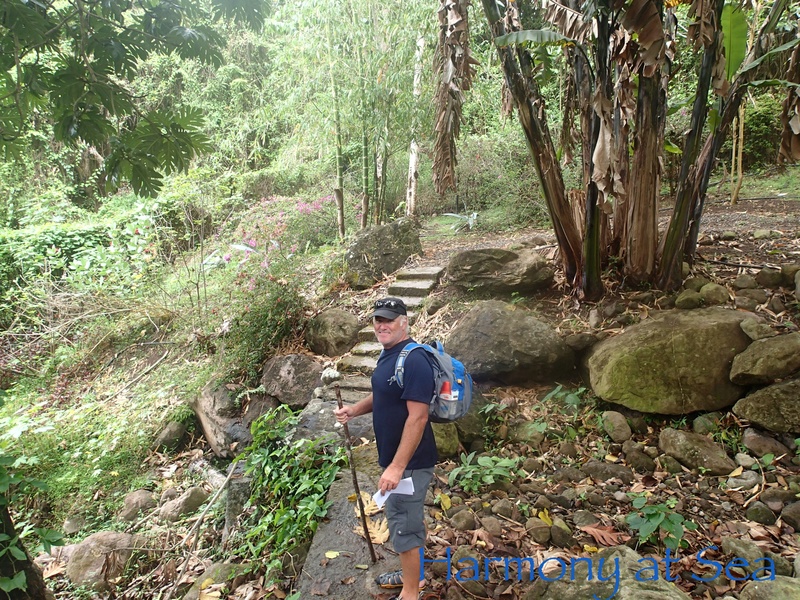 The weather in general was great except 2 times we had cloudy and rainy crossings, not too bad though. 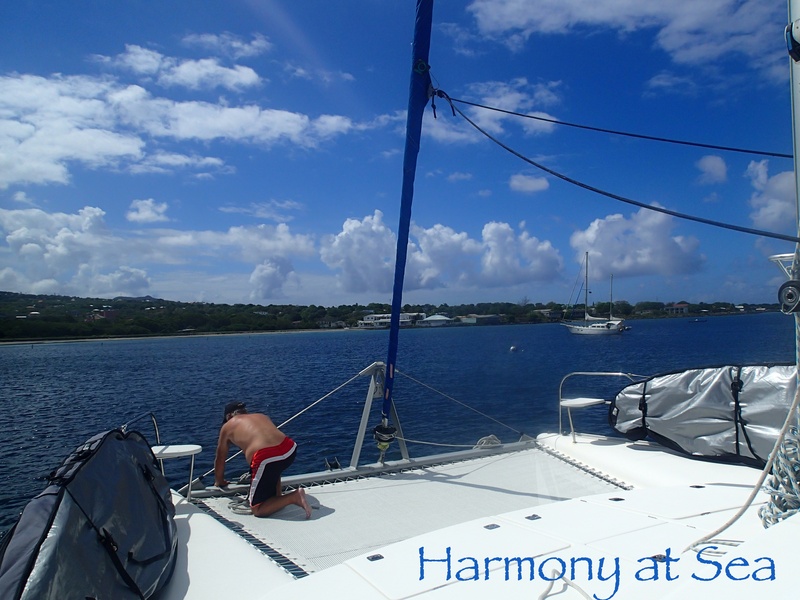 Harmony behaved very well all the way down, no major breakdowns. 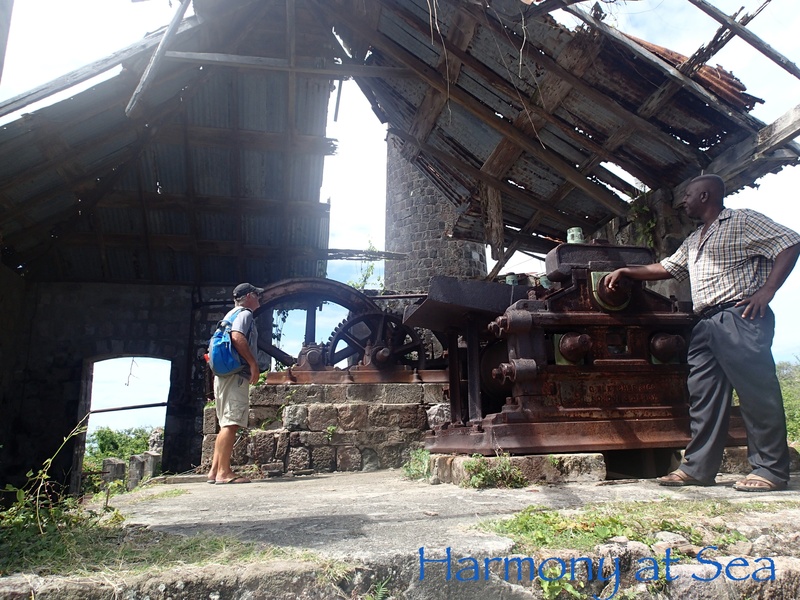 A few small things broke and we will have them repaired during our stay in Grenada. 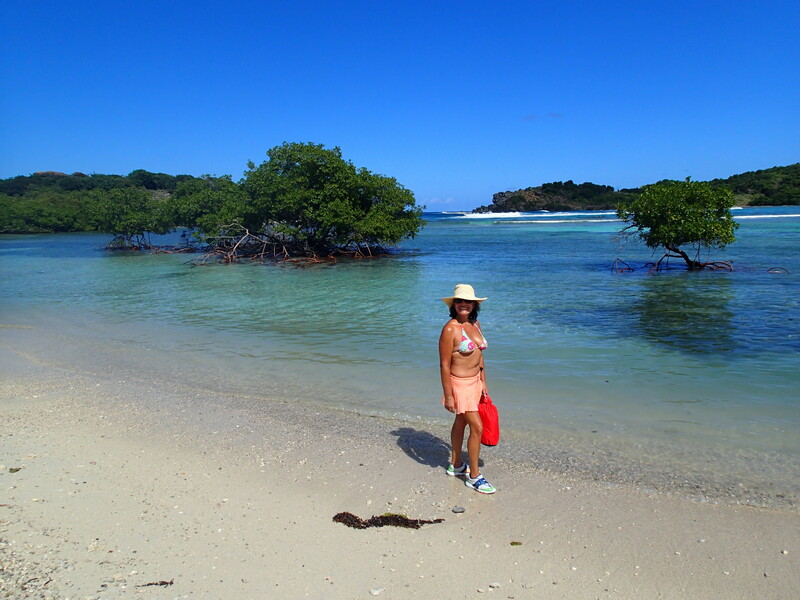 We liked all the islands we stopped at. 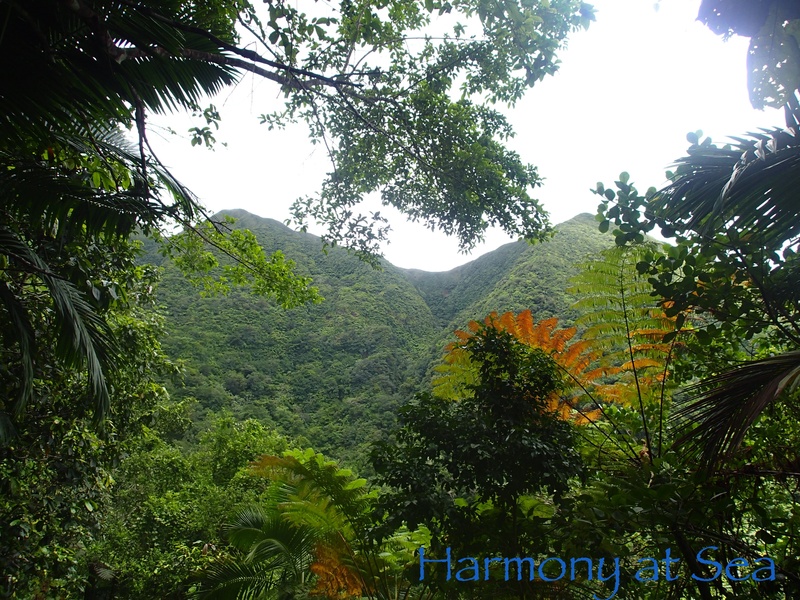 The ones we love most are Dominica because of its natural unspoiled beauty and the Grenadines beautiful turquoise waters. 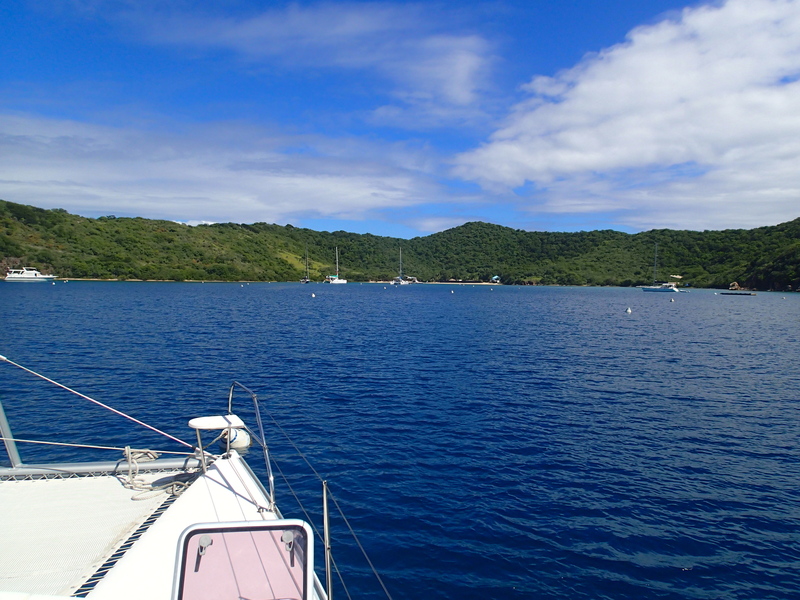 St. Lucia was special for us, 4 years ago were married there and Wylie promised me that someday we would return on our own sailboat. 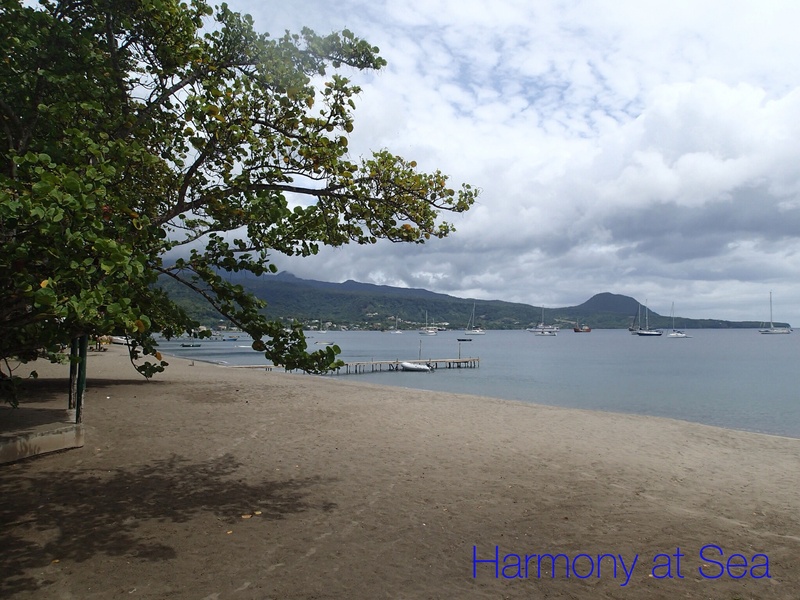 We sailed to Rodney Bay and anchored in front of Sandals Grande where we were married. It was a very emotional and romantic moment. 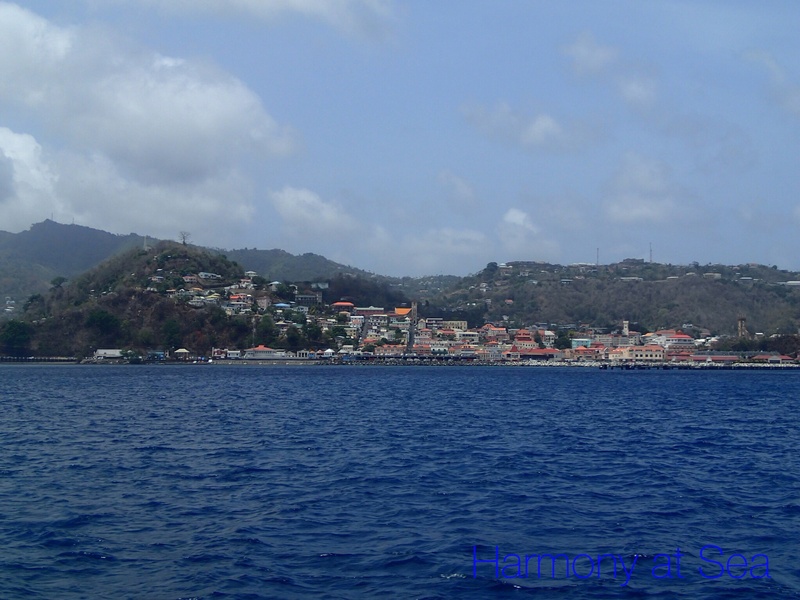 We arrived in Grenada on June 11th, and anchored at St. George’s for a couple of nights to provision the boat and then moved to Hog Island Bay, our home for the hurricane season. 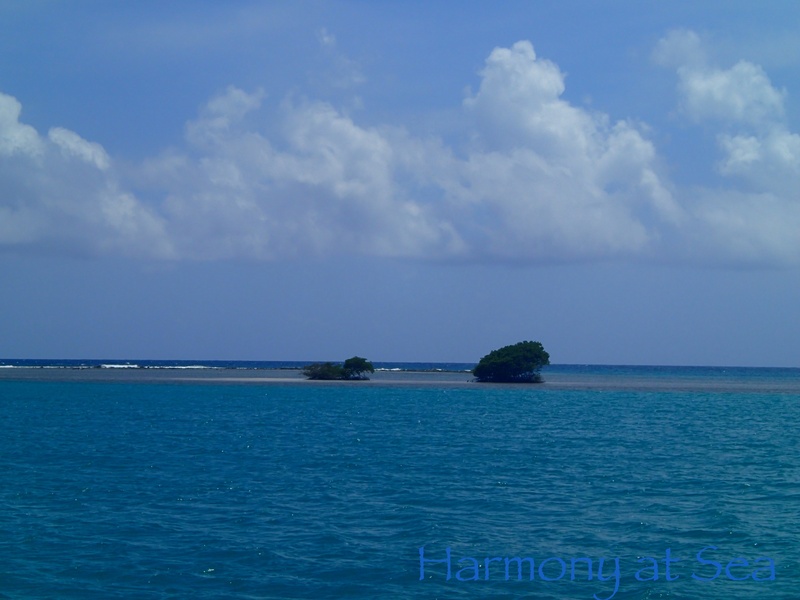 Hog Island is a nice anchorage, well protected and quite. 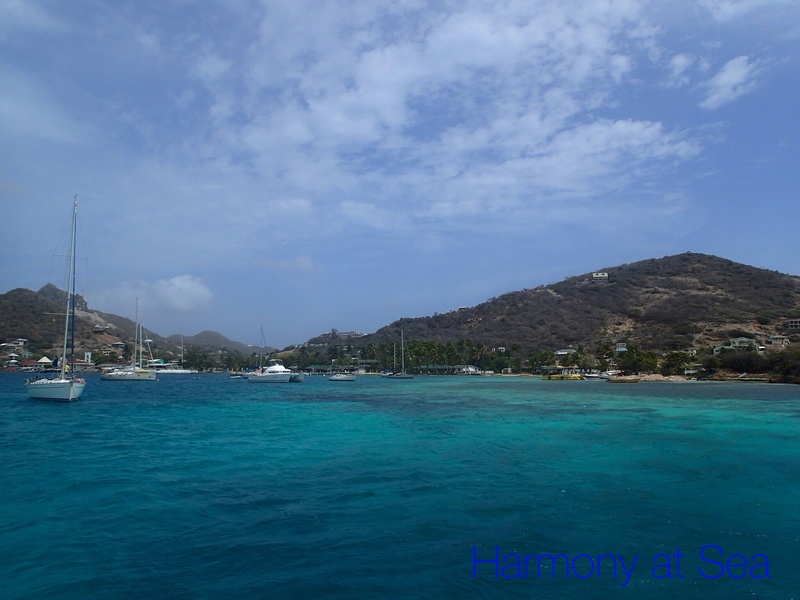 There are a couple of marinas with easy access by dinghy. 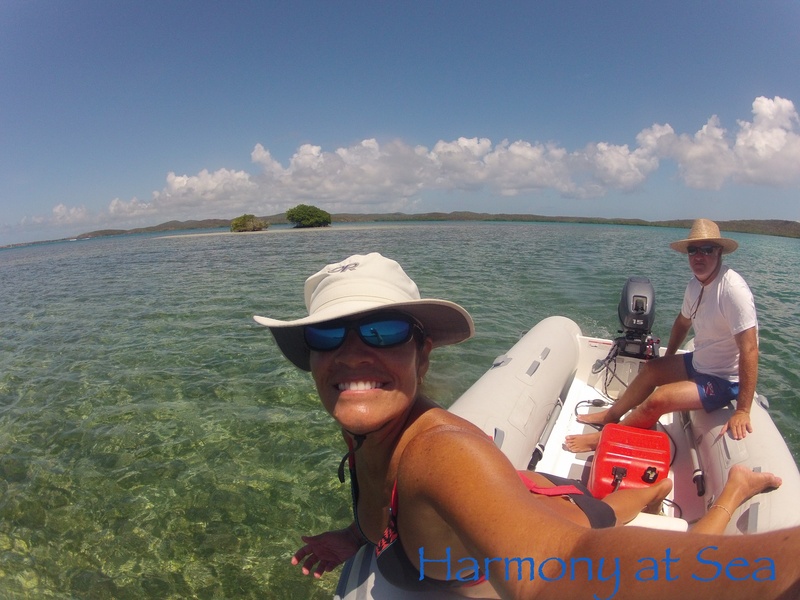 Secret harbor marina works best for us. From there we can take buses and taxis to downtown. 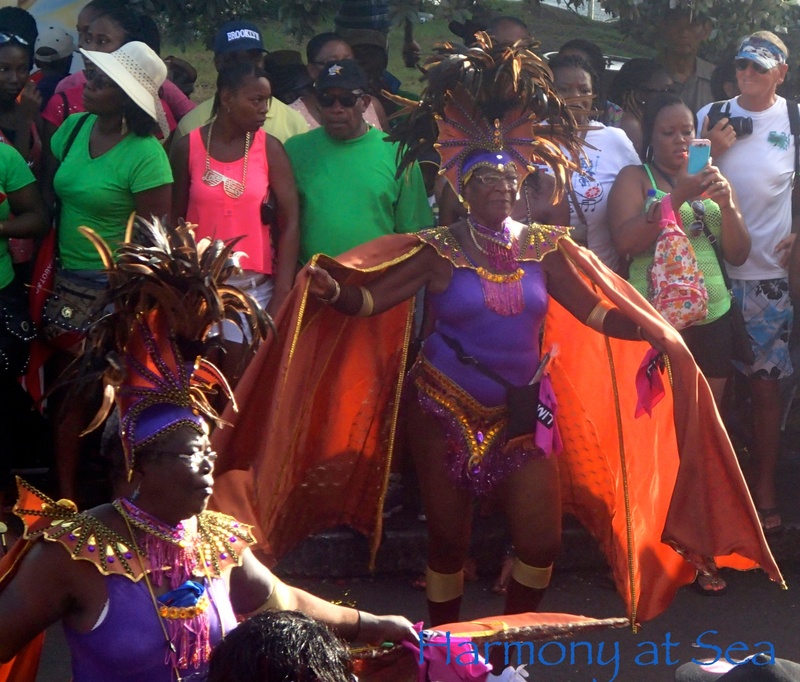 There is a very well organized cruiser’s community here in Grenada, they offer activities, transportation, and information. 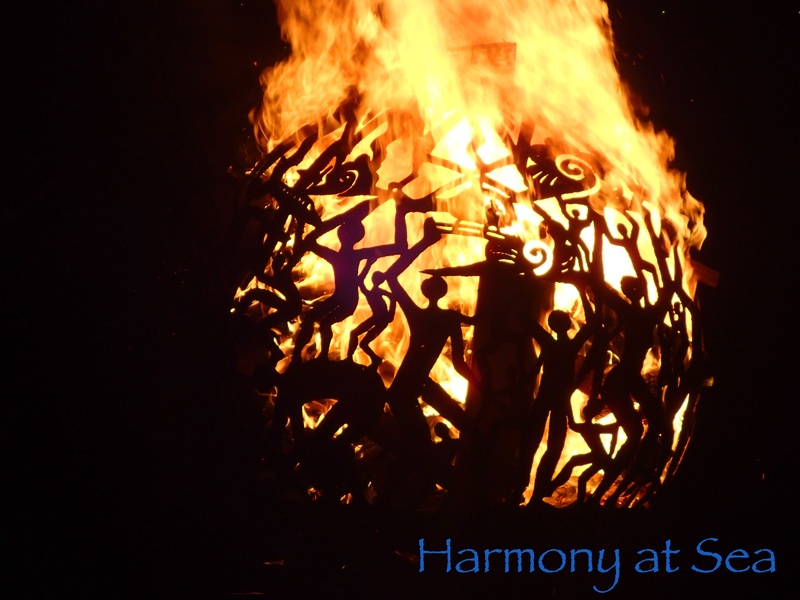 We are looking forward to participating in the many activities offered here. 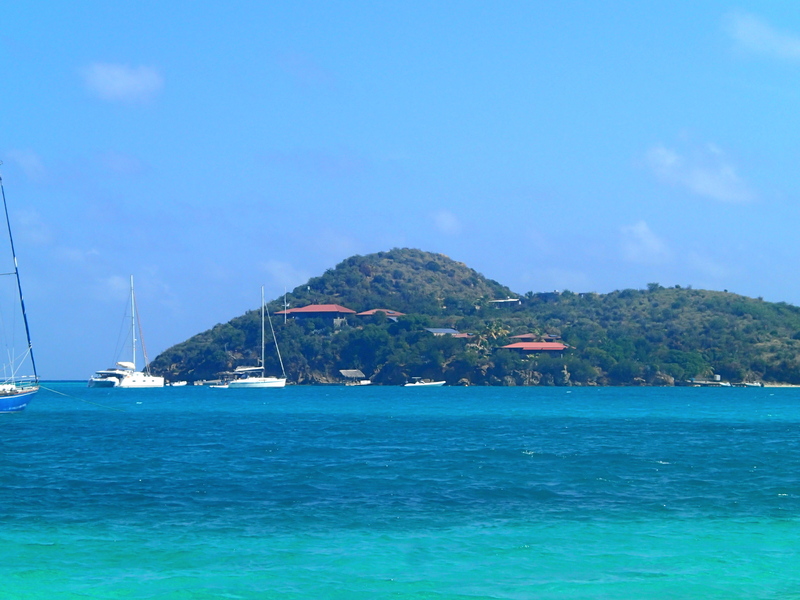 The port office in St. Bart’s let us check out yesterday so we could leave very early in the morning for St. Kitts. 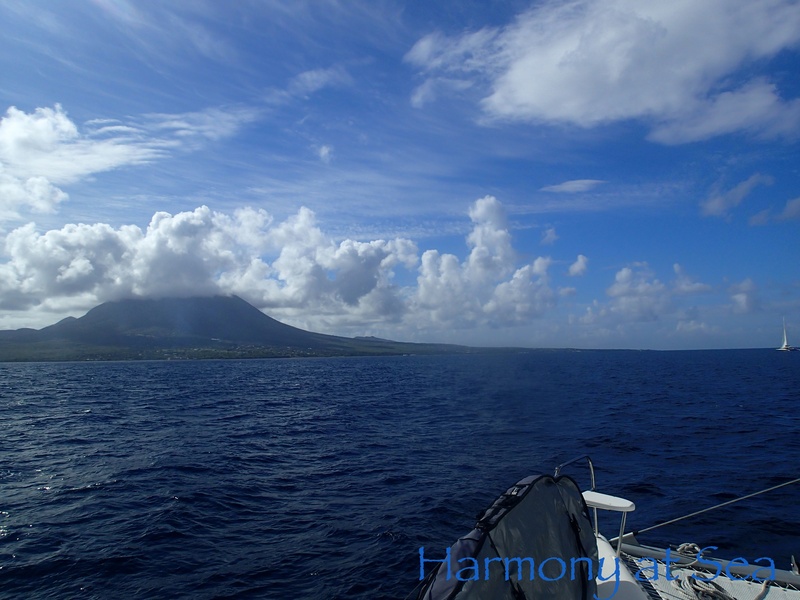 We had a great sail all the way to the NW corner of St. Kitts, where we turned and motor/sailed to Basseterre to check in. There were no cruise ships docked, so Port Zante was empty, and we were able to check in quickly. 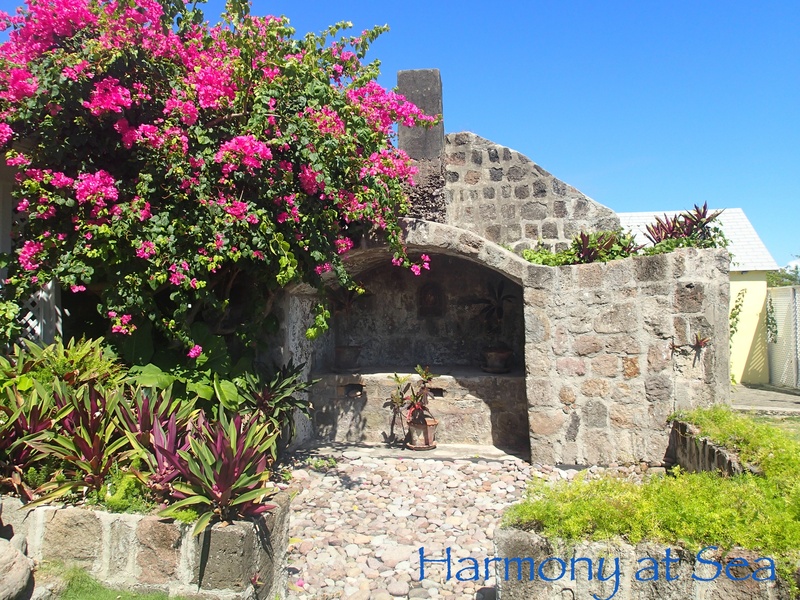 In St. Kitts you have to go to 3 offices: customs, immigration and the port authority. Fortunately the offices are close to each other and the officers were very nice and helpful. 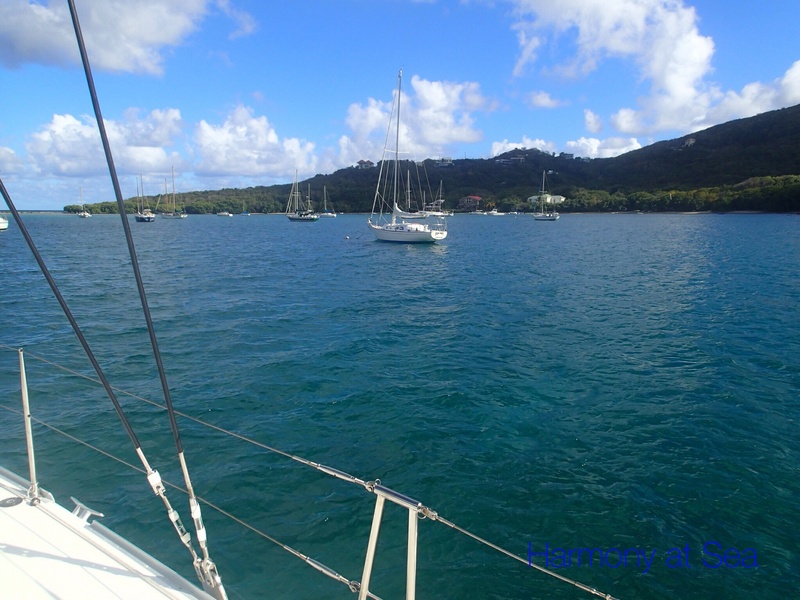 We checked in and out including Nevis (Take a note, the custom office formerly located at Deepwater Harbor is closed) Basseterre was a very rolly anchorage so we decided to motor to White House Bay after we checked in. 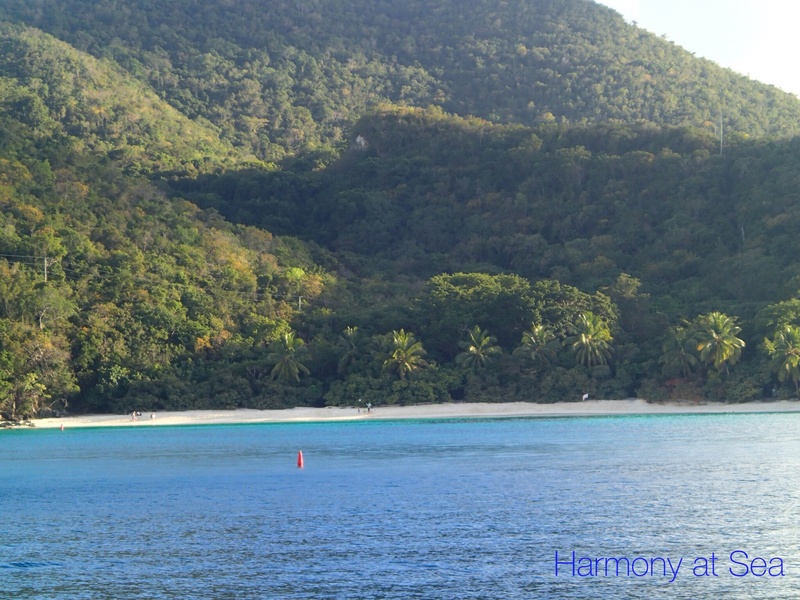 White House bay is very beautiful, calm and very well protected. 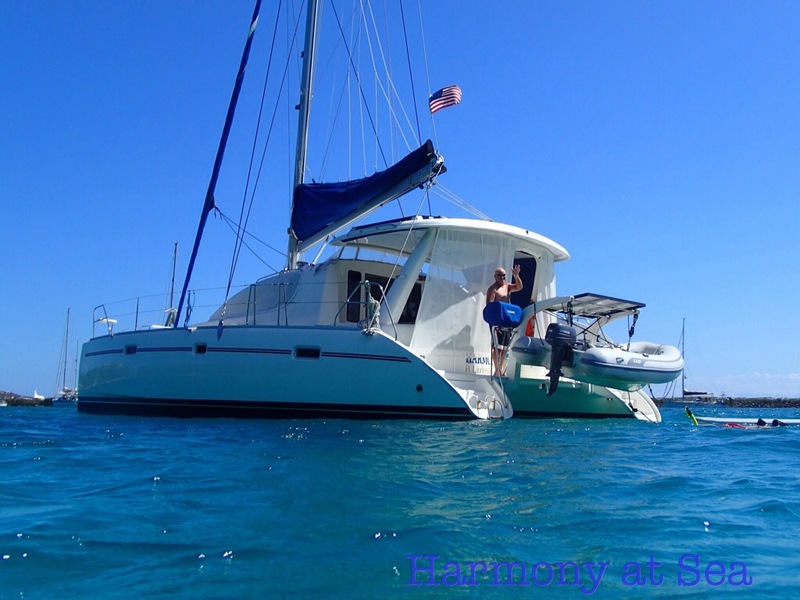 We enjoyed a couple of nights relaxing and snorkeling and cleaning the boat. 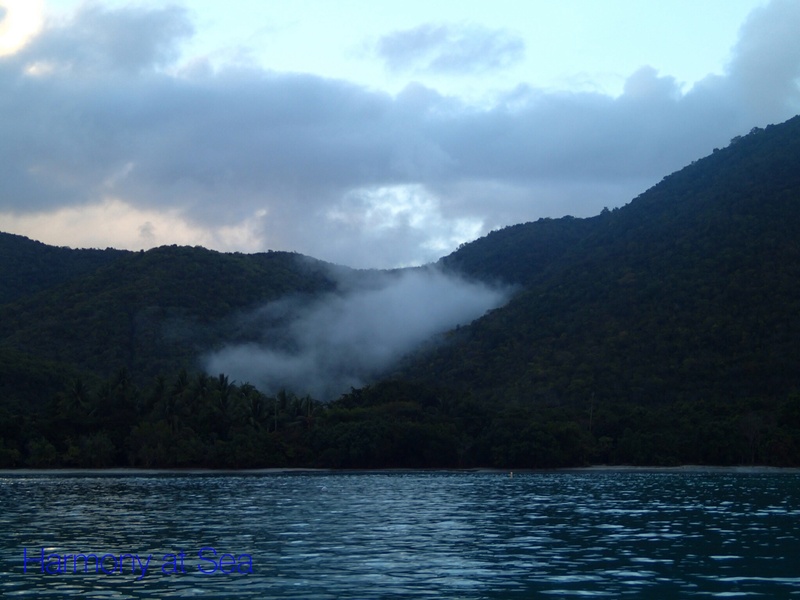 Friday morning we left for Nevis. 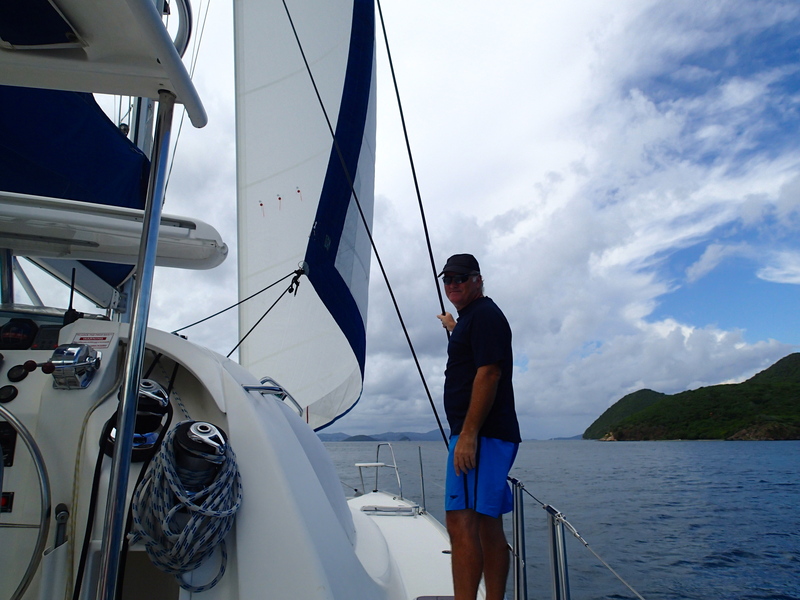 We had a nice, short and smooth sail. 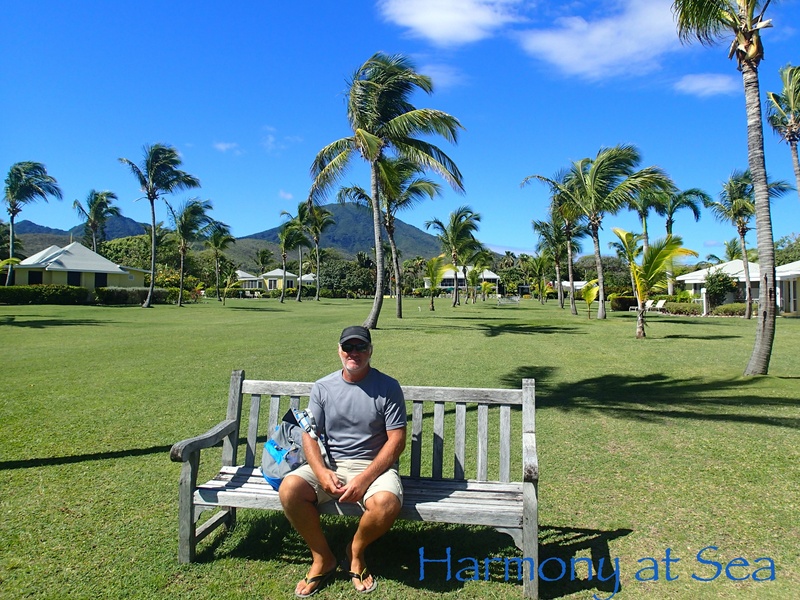 We picked up a mooring ball (mandatory) at Pinney’s Beach in front of Mount Nevis, and took the dinghy to Charlestown to pay for the mooring ball. There are no gas stations in town and the fuel at the dock is delivered by truck so we took a taxi to buy fuel for the dinghy. 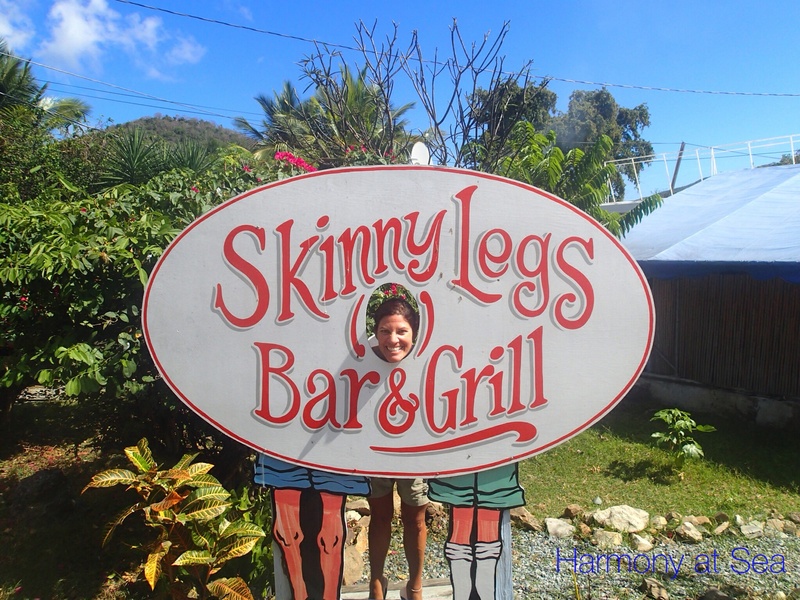 Later in the day we dinghied to the Sunshine Bar to try their famous Killer Bee drink, it was ok. The restaurant is a little over rated, or maybe they were just having a bad day. Sunshine said he was short staffed and it showed. The service was very slow. 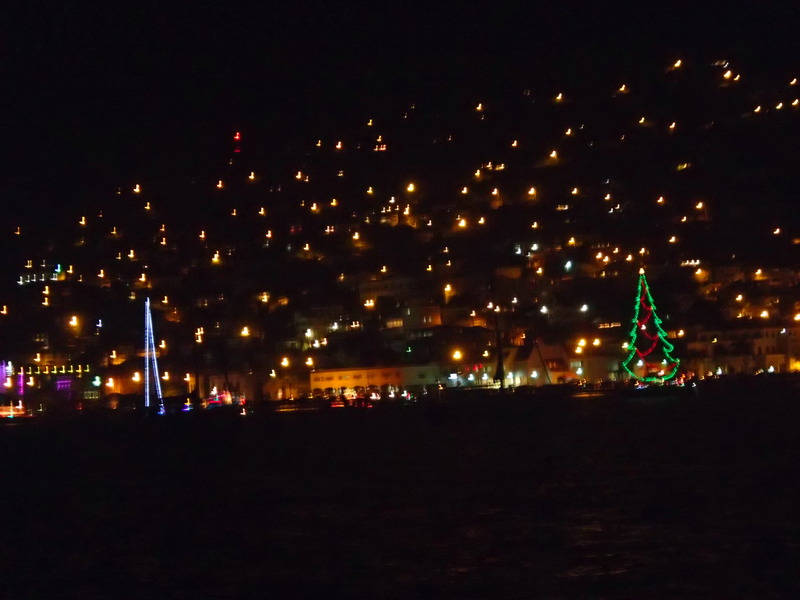 The food was ok. We did enjoy their music from the boat at night and the Four Seasons put on a fireworks display. 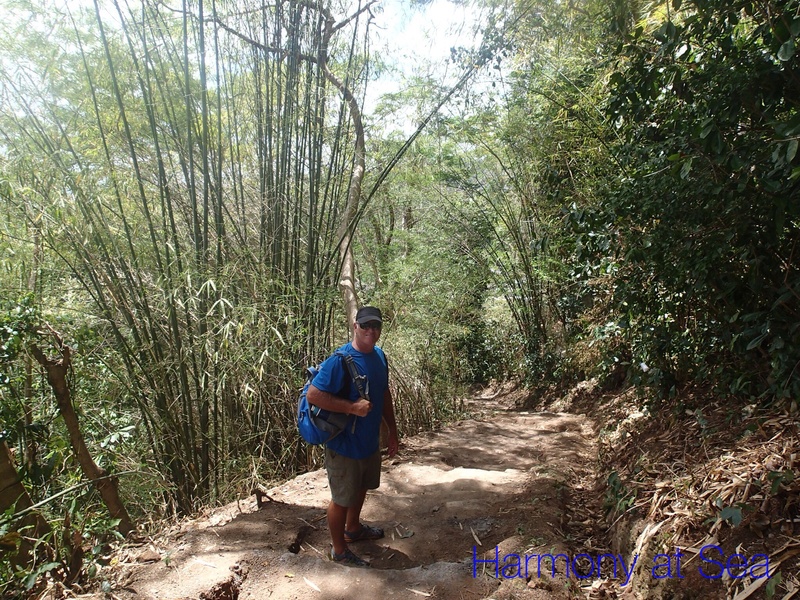 The next day we took a taxi to the Golden Rock Plantation where we did a 3 hours hike inside the rainforest. 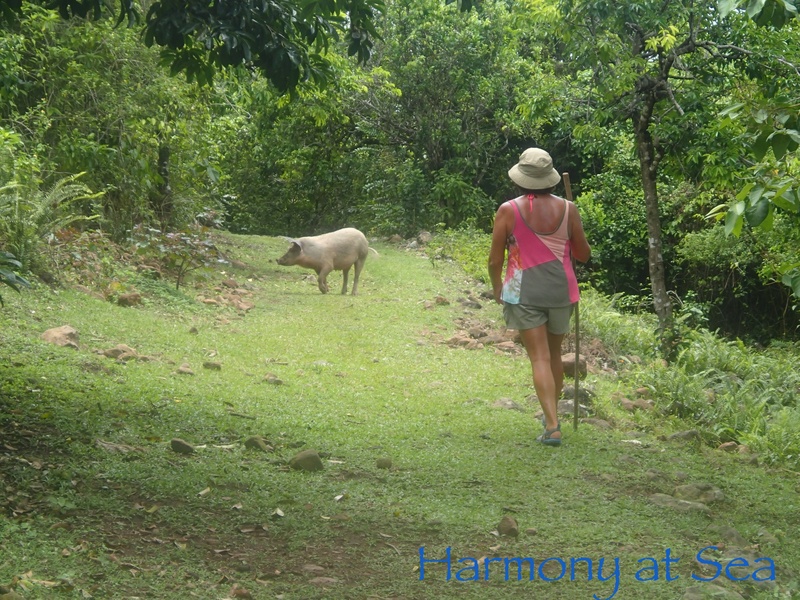 We saw lots of goats, pigs, donkeys and monkeys. 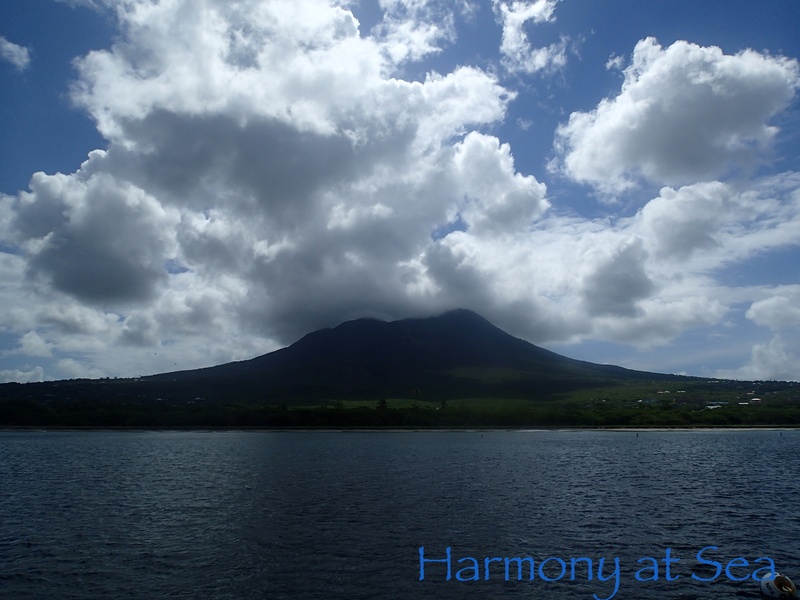 The views from the hills were amazing, and we were able to get a clear view of the Nevis’s Peak, without clouds covering it. 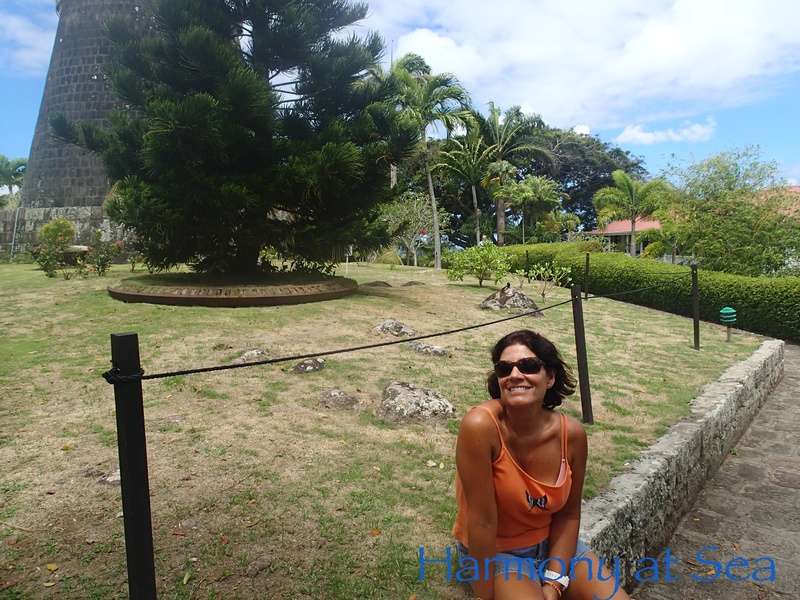 After the hike we had an amazing lunch at Golden Rock and walked around the plantation, it is such a beautiful place, very lovely, full of colorful plants. 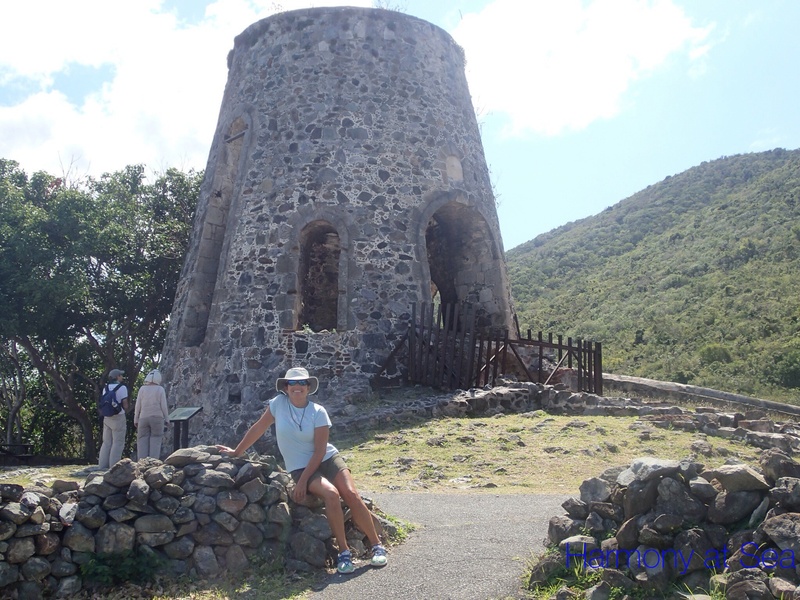 We decided to stay one more day at Nevis and take a taxi tour around the island. 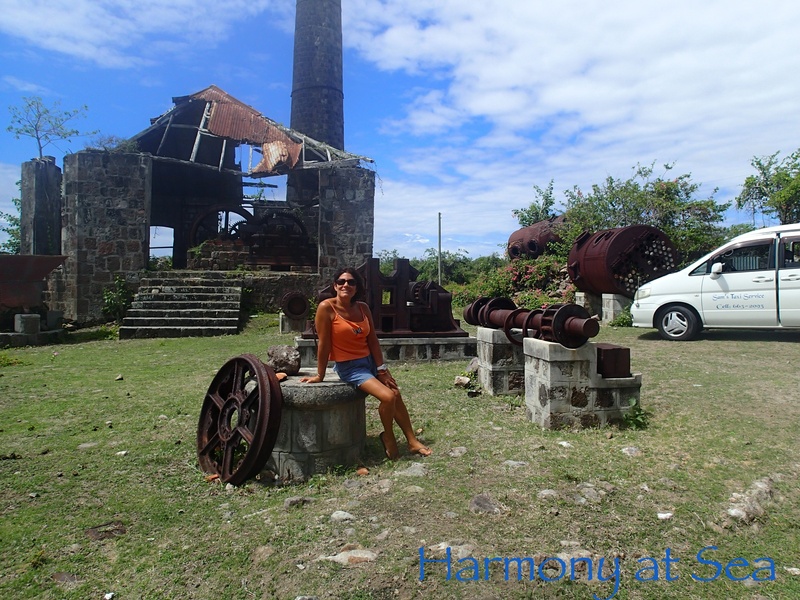 Sam from Sam’s taxi service took us to all the historical sites on the island. 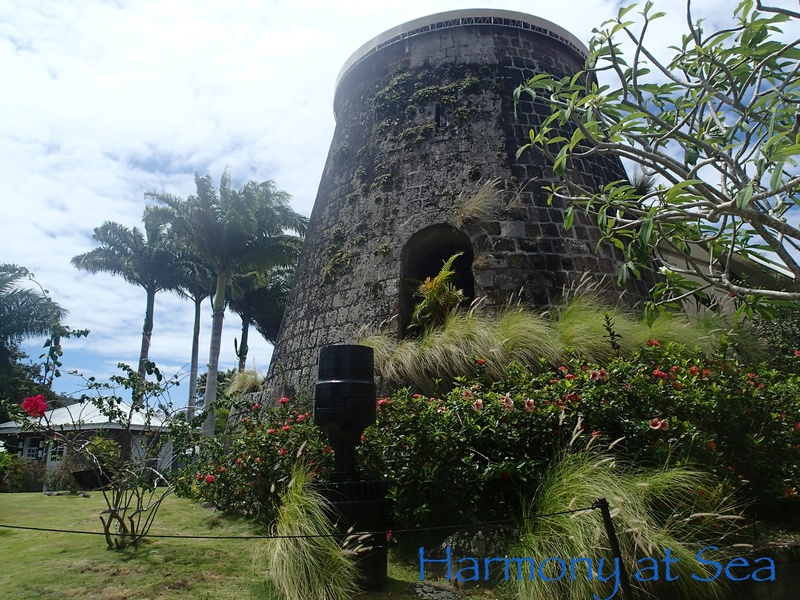 Nevis has so much architectural heritage and beautiful plantations to see, we loved it. Our first over night passage went well. 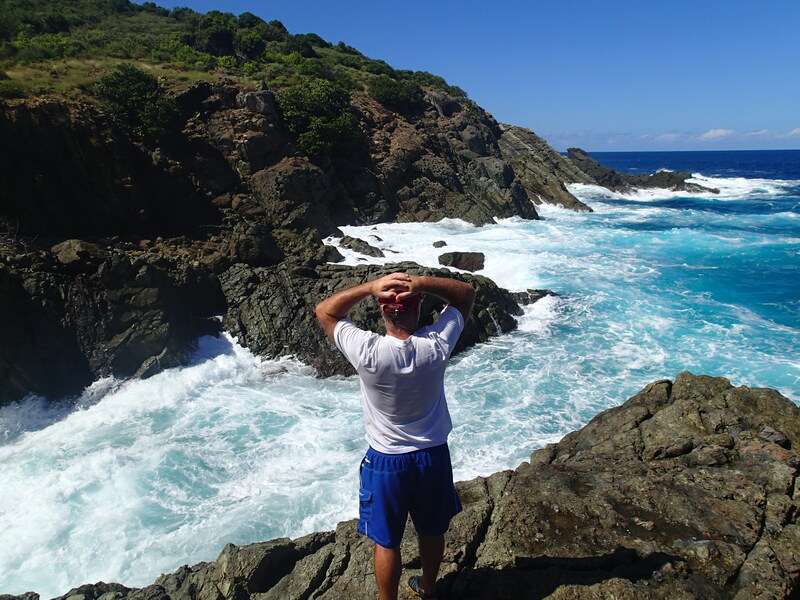 The wind and waves were good and the weather was perfect. 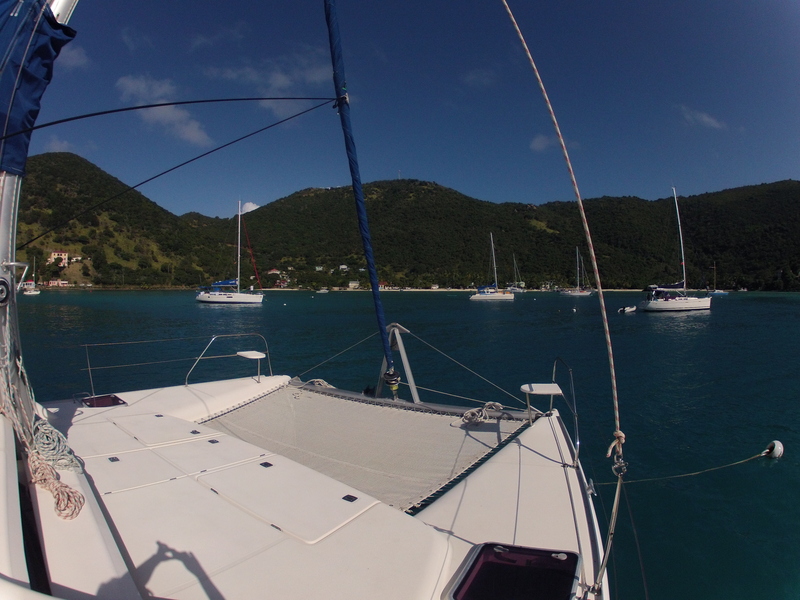 We made it to St. Martin ahead of schedule so we slowed down to arrive in daylight. 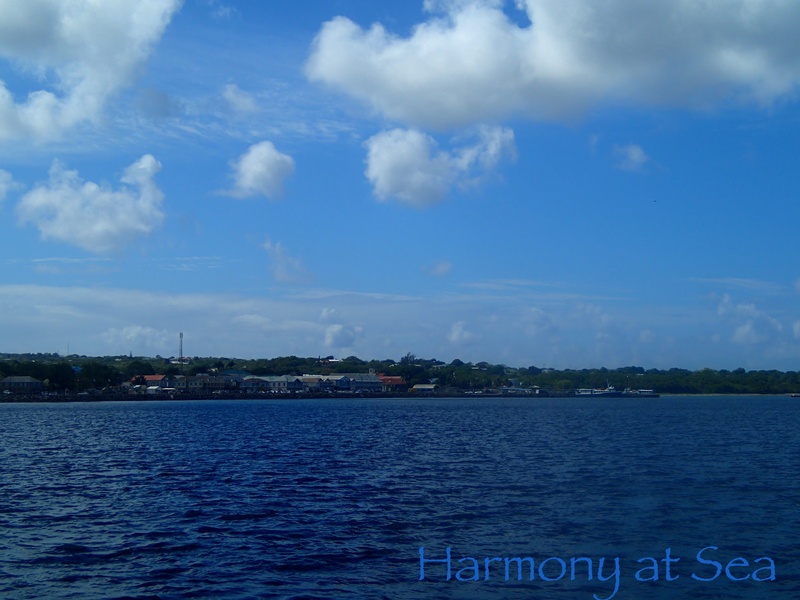 After checking in at the Captainerie in Port Le Royale on the french side (where port fees do not apply) we steered Harmony through our first lifting bridge, a tight one and anchored in Simpson Bay Lagoon. 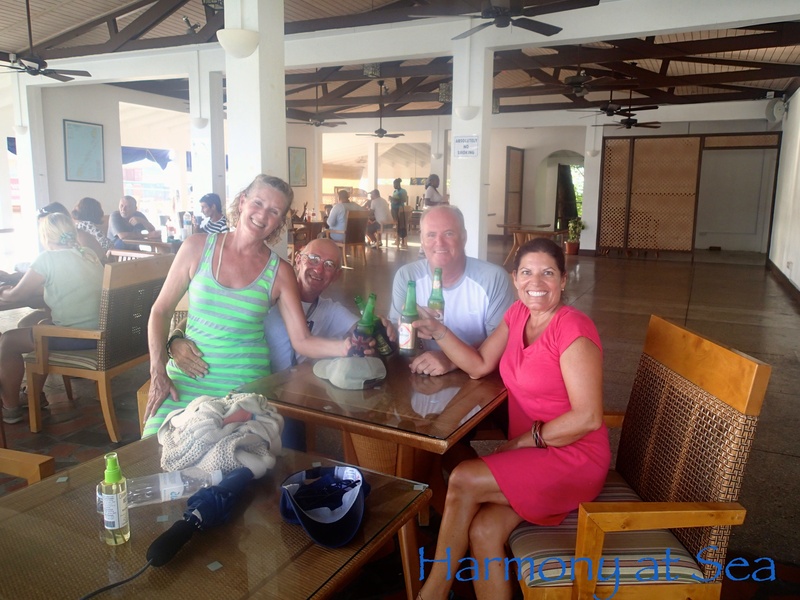 We did some shopping for the boat and enjoyed happy hours at some bars. 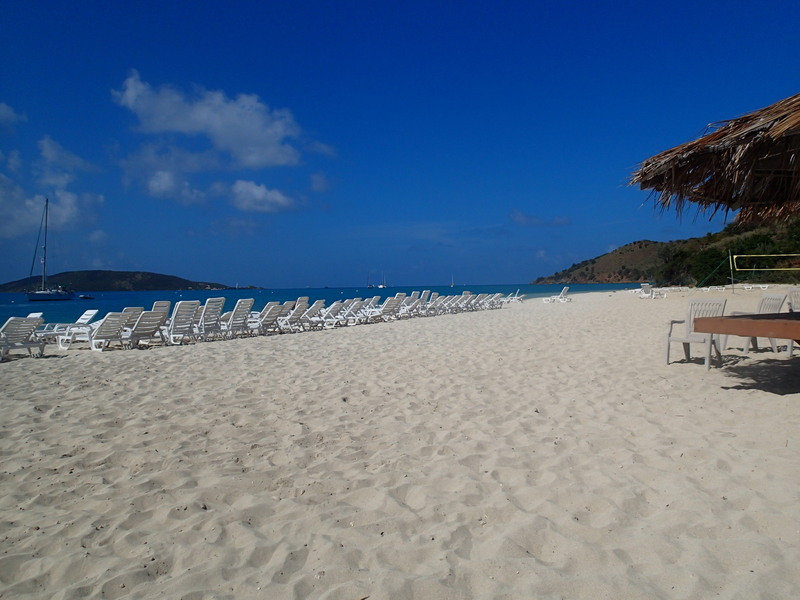 Due to bad weather we ended staying in St.Martin a week, longer than we had planned. 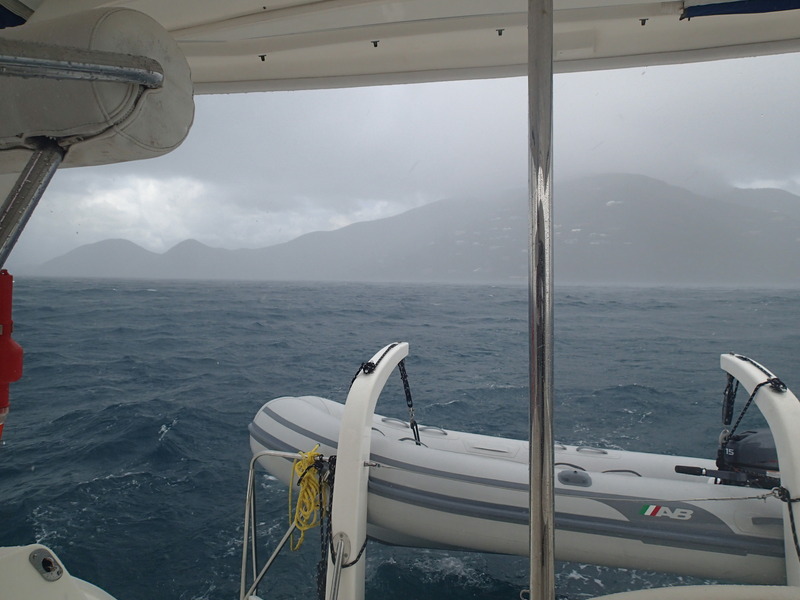 The dinghy rides between the bays were no fun in the rain. 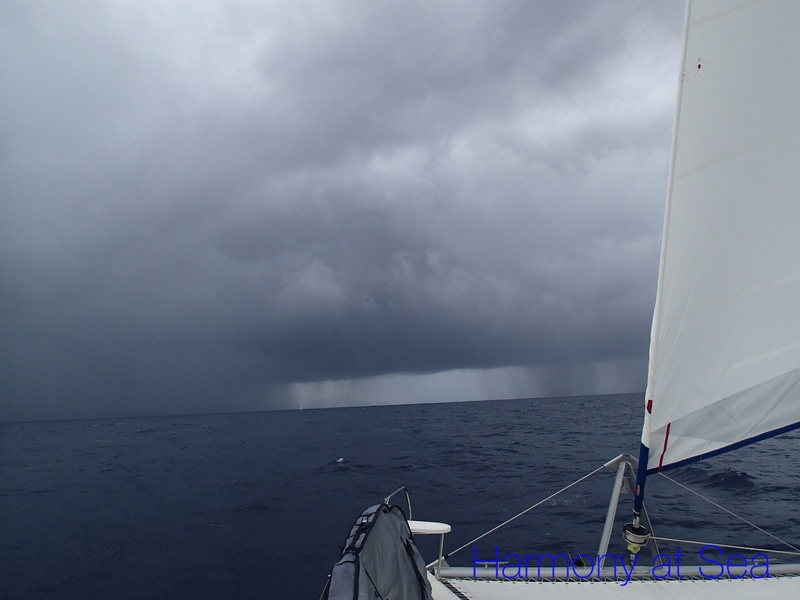 Saturday night was the worst, it stormed with strong winds, gusts of 30 to 32 knots during the night, boats swung all over the place, some got very close to us but without incidents. 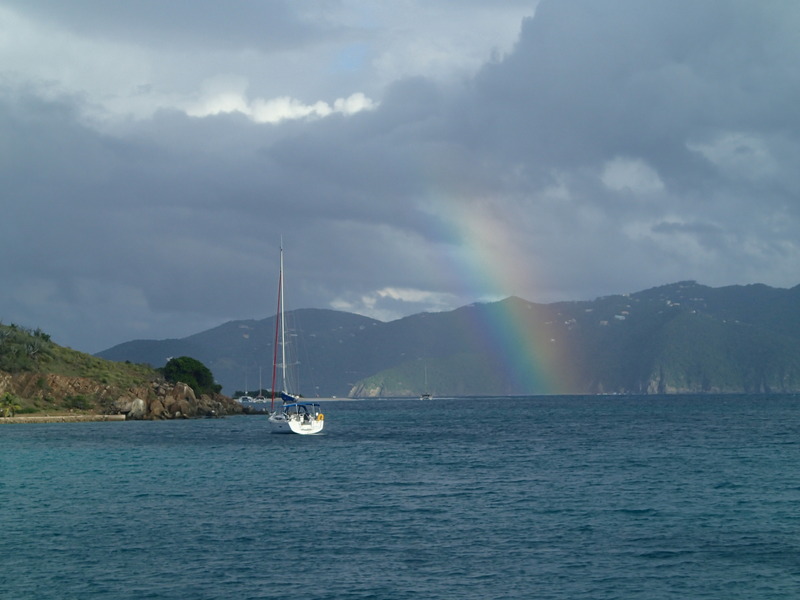 As soon as we saw a weather opening we left for St.Bart’s. 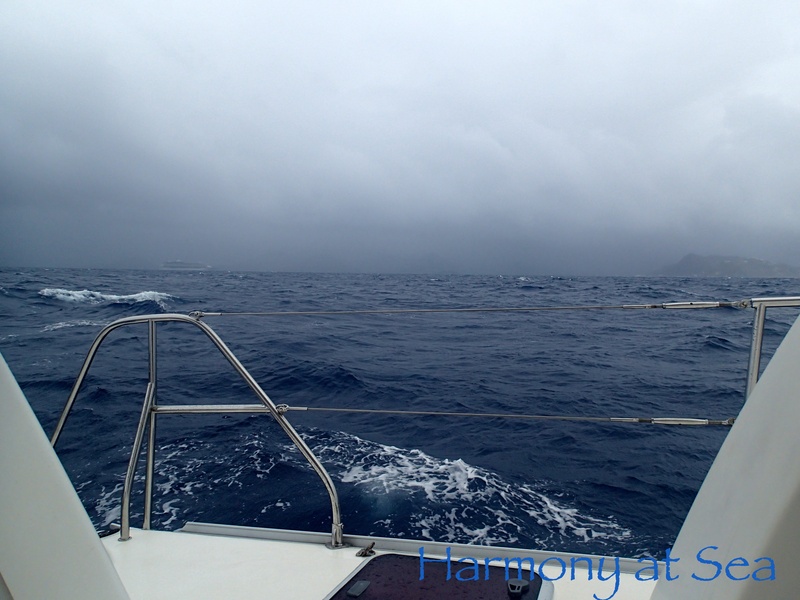 We were enjoying sailing for a short while when we saw some bad weather coming toward us, so we decided to start the engines and head straight to St.Barts, unfortunately the weather caught us. 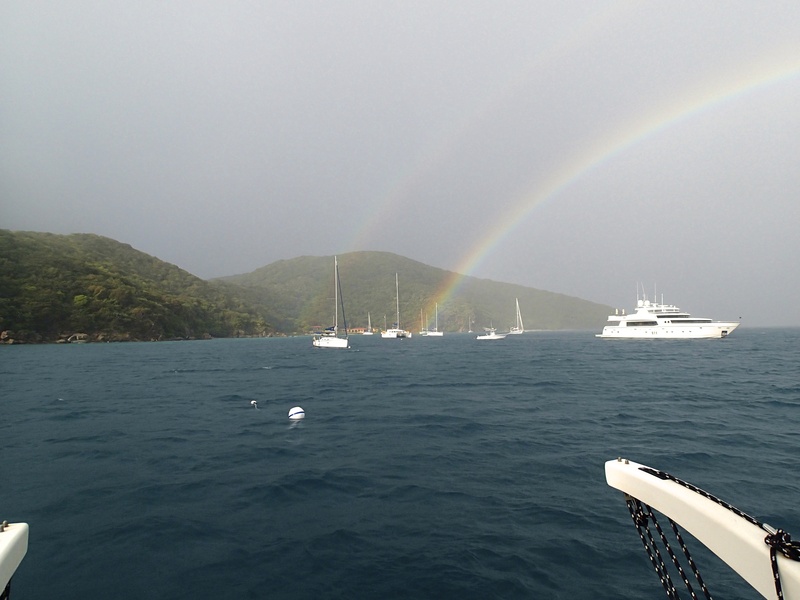 It rained all the way to St Bart’s and the rest of the night. 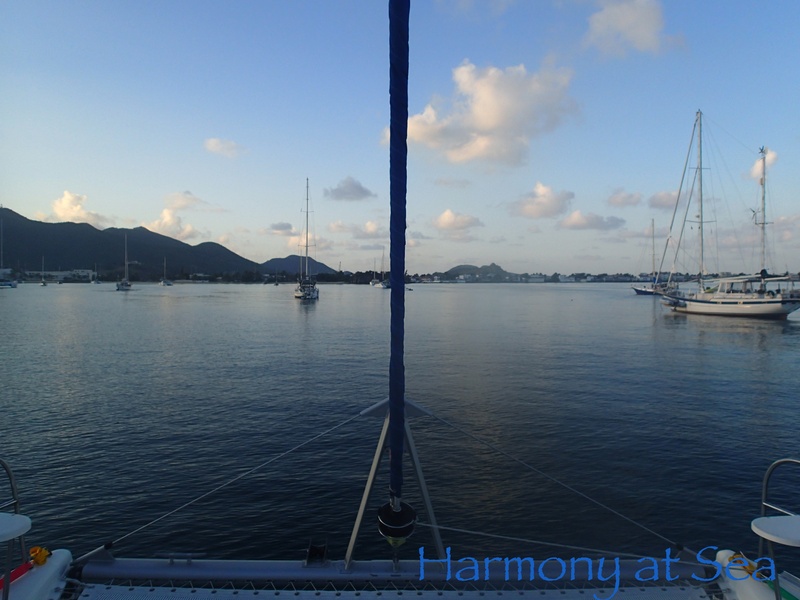 We anchored in Gustavia in front of the Saintes Rocks. 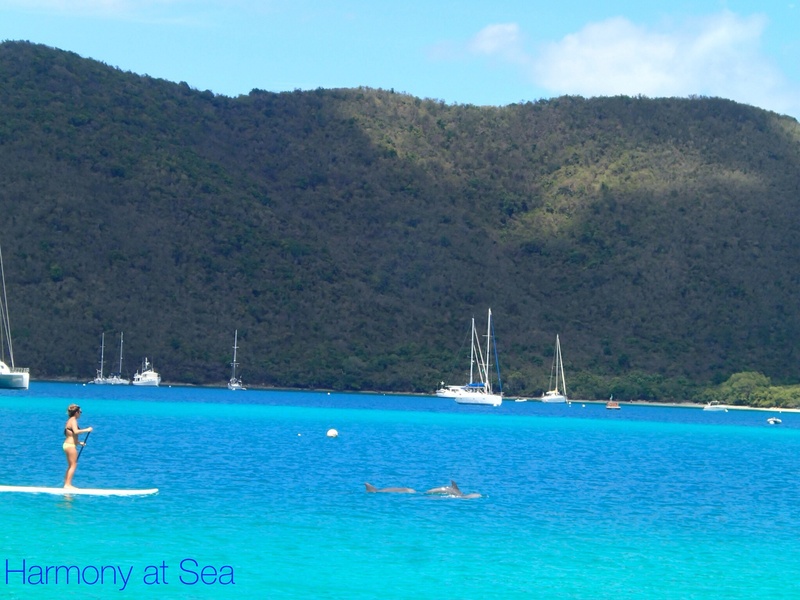 The dinghy ride to check in was not fun either. 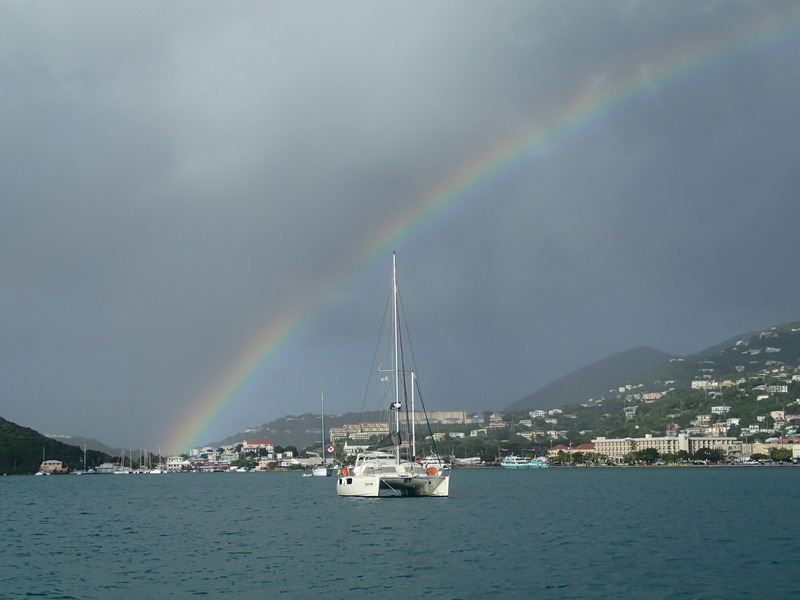 We were a little embarrassed going in to the Port Gustavia office all wet, but the officers were super nice and relaxed, no worries. The following day the sun was out so we decided to do a walking tour of the city. 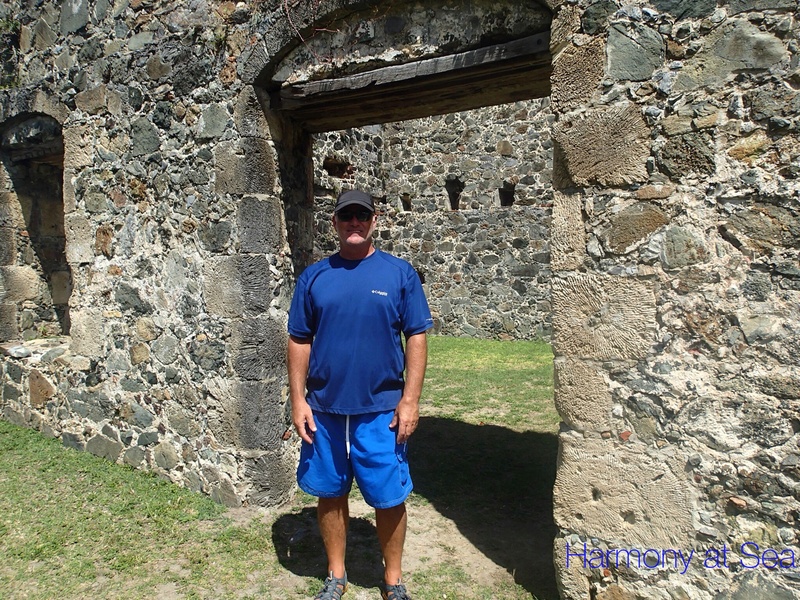 Begining at the walkway we visited Fort Carl, Shell Beach, Fort Oscar (the police station is there, so it is closed to the public) and Fort Gustav. 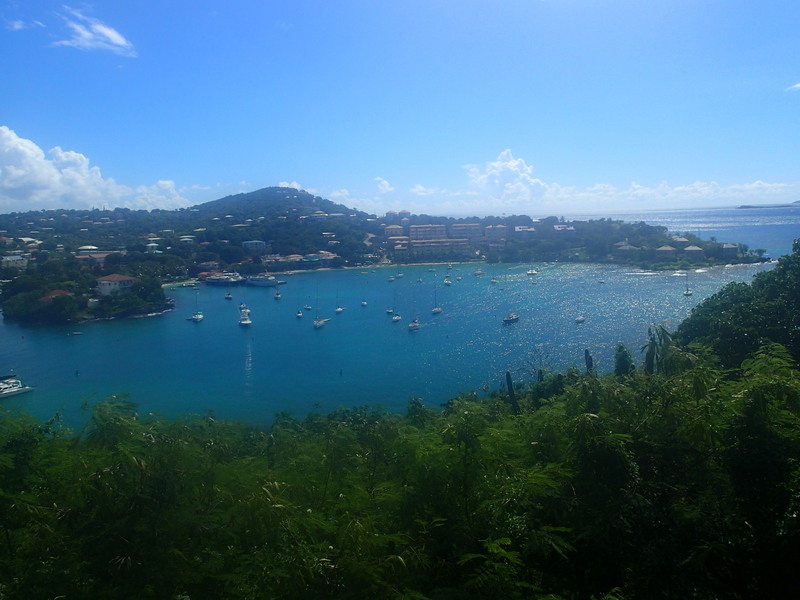 The views from the Forts are awesome, you can see the city and all the bays from it. After the walk we had lunch at Le Select Restaurant. We both ordered the fish sandwich. We laughed when receiving our order to see it was a fish stick sandwich, ha ha instead of fresh fish. The fish stick sandwich tasted good. 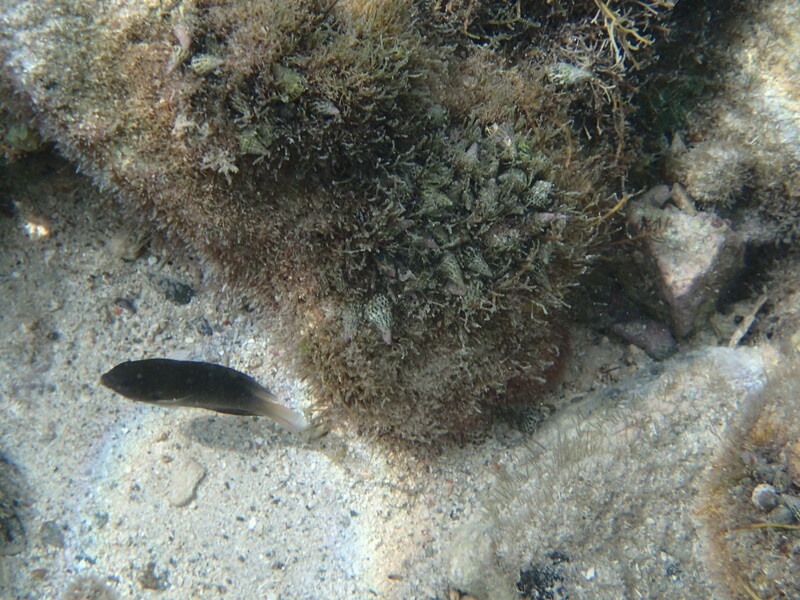 After all it was a St. Barts fish stick sandwich. 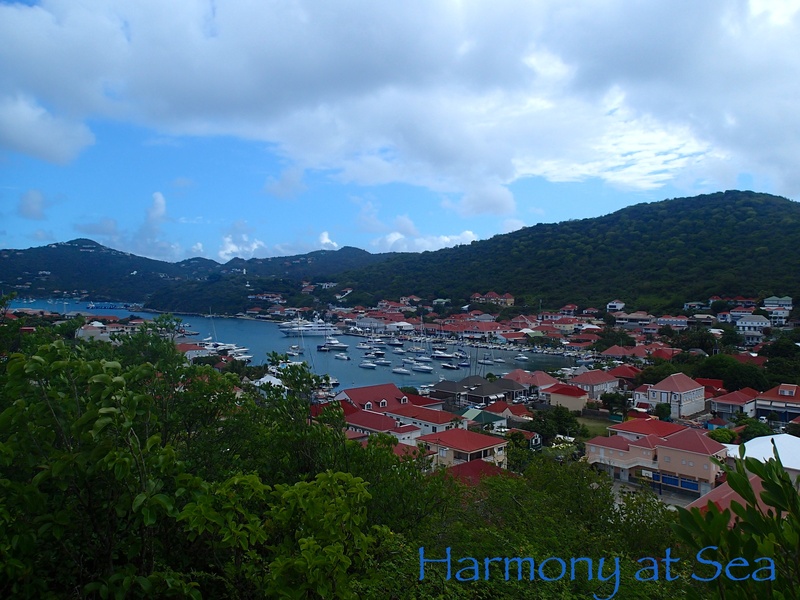 We loved St. Barts, it is really a colorful and beautiful town, clean and neat. 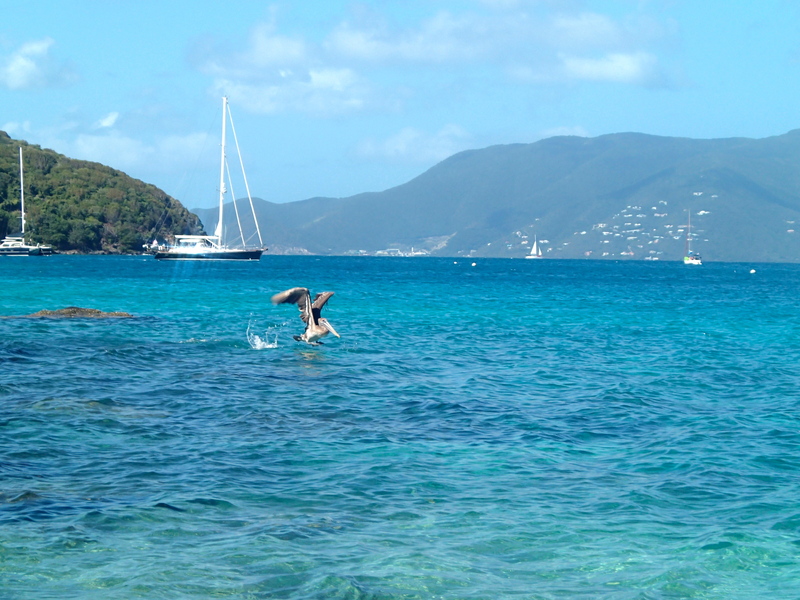 Today we are saying goodbye to the Virgin Islands. These last 5 months have been a wonderful experience. 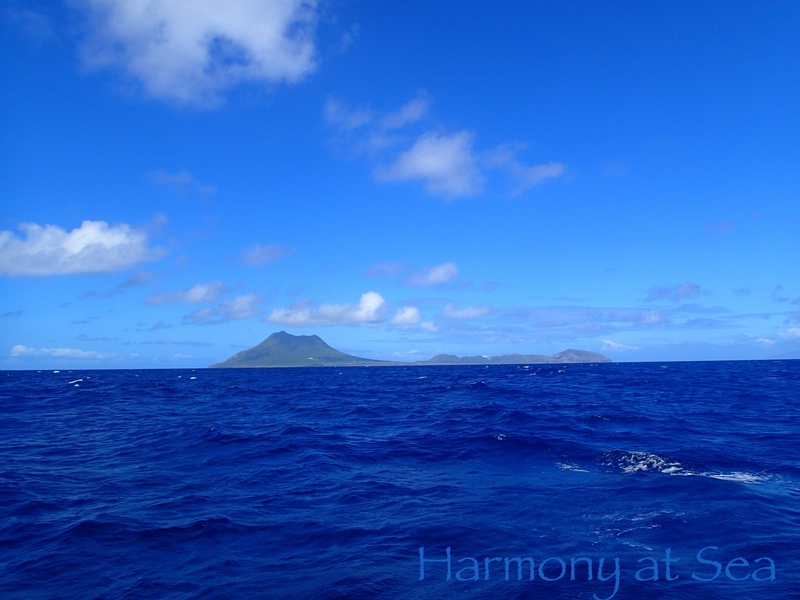 We were able to visit almost all the islands and we met great people on other boats, some of them are sailing down island and we will see them there. Others are returning to the USA , or sailing to different areas so we had to say goodbye and hope to see them again in the future. 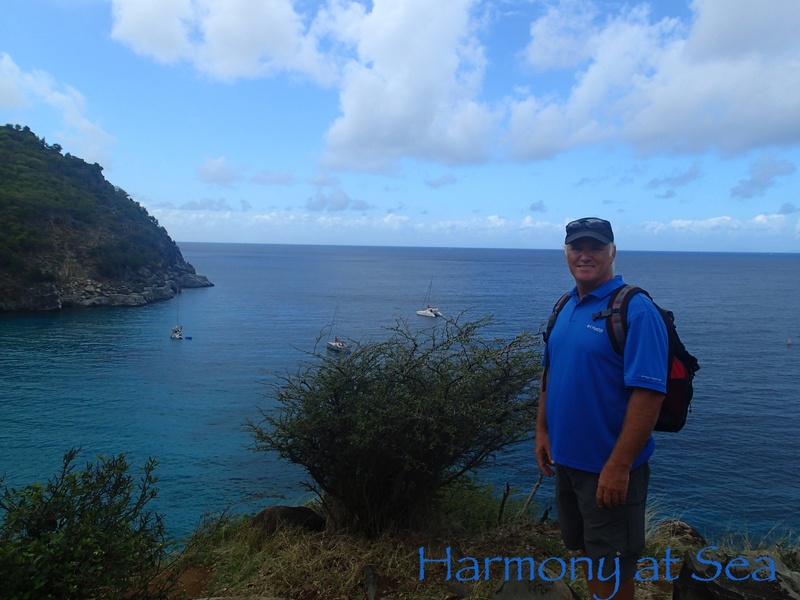 Our cruising life on aboard HARMONY began in the Virgin Islands so they will always hold a special place in our memories. Now we are ready to move on. 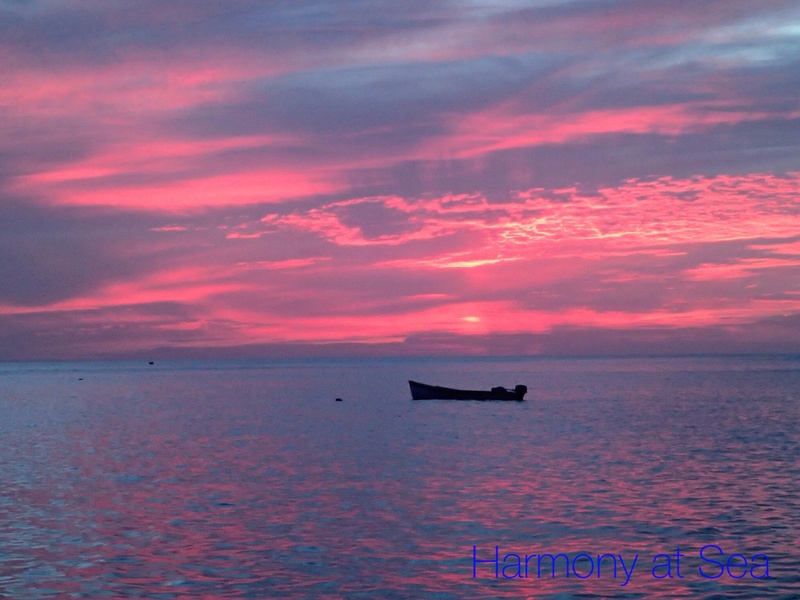 We are looking forward to visiting more of the Caribbean. 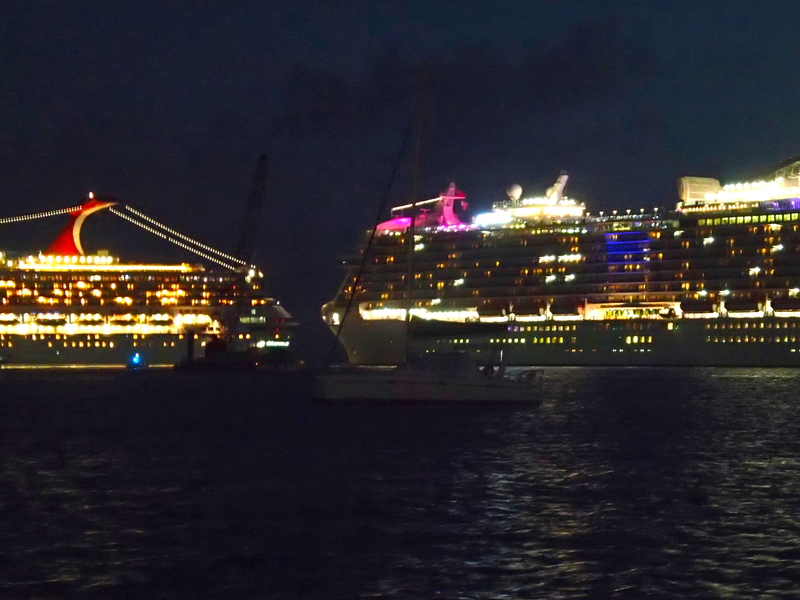 We are excited about our first night passage to St. Martin. 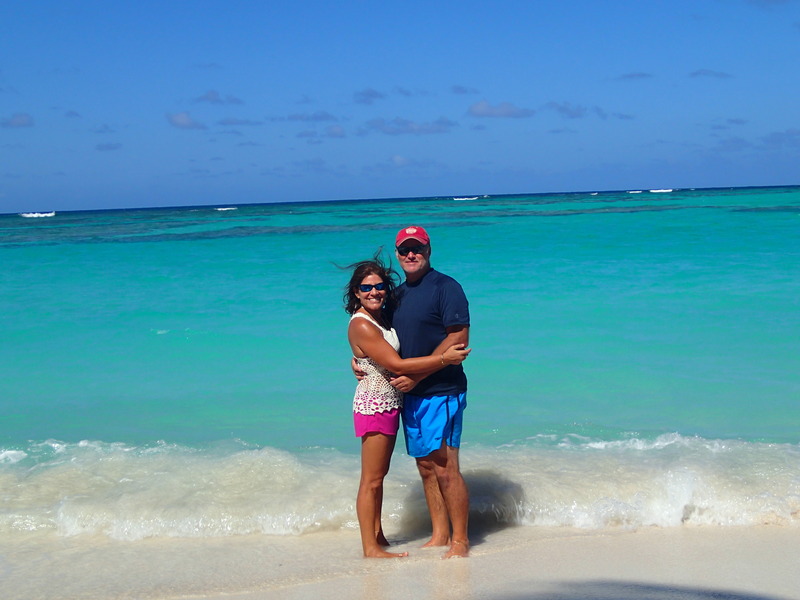 We are planning to leave today at 2pm arriving in St. Martin sometime Tuesday. 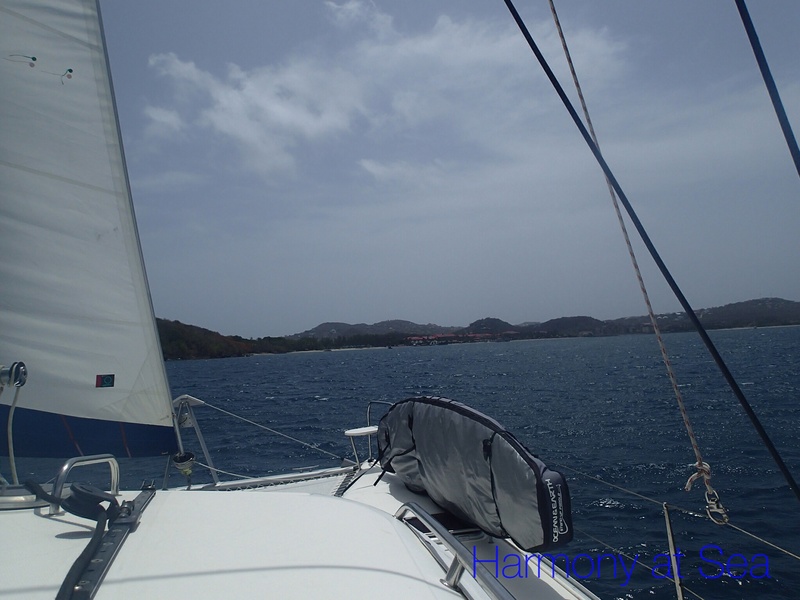 The forecast is calling for light winds and small seas, as good as it gets for motor sailing to St Martin. 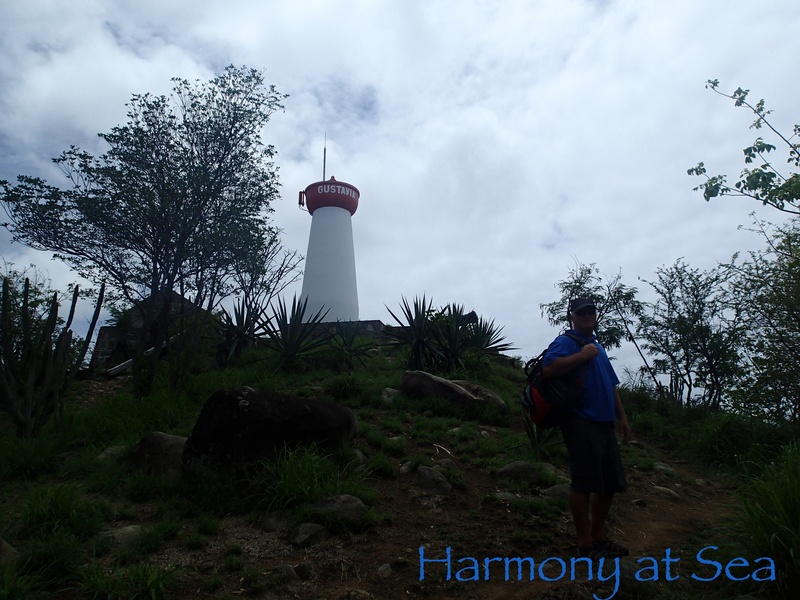 We had a wonderful visit to the SVI, beginning with Culebra where we found the local people to be very nice and helpful. 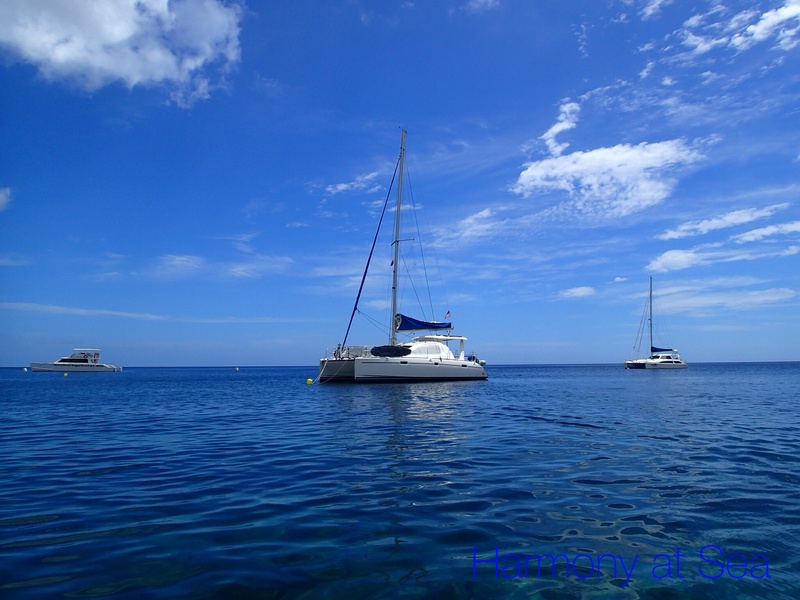 We anchored at Ensenada Honda, near the public dock. 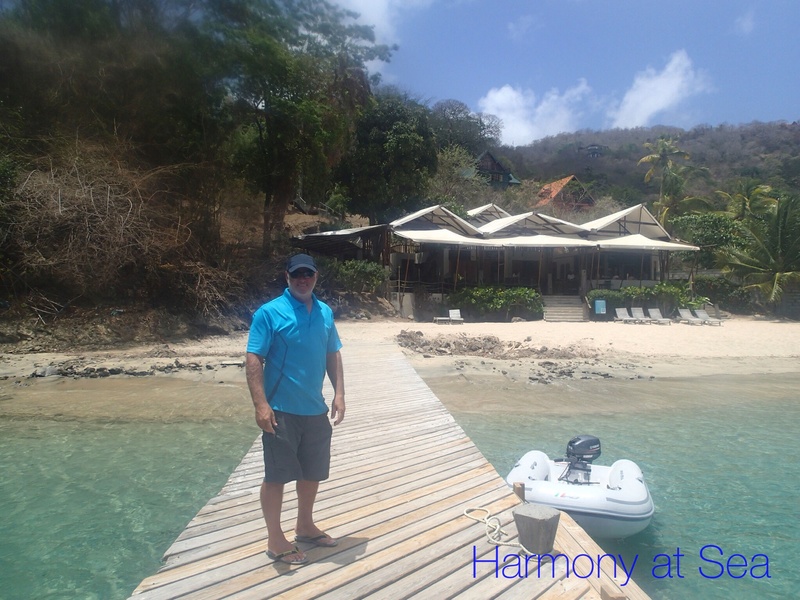 After clearing in with customs by phone we took a short dinghy ride to the public dock and walked to the various restaurants and bars which are all good. We ate in most of them and in our opinion the food at the Dinghy Dock is the best, followed by Zaco Tacos, Susie’s and Mamacitas. 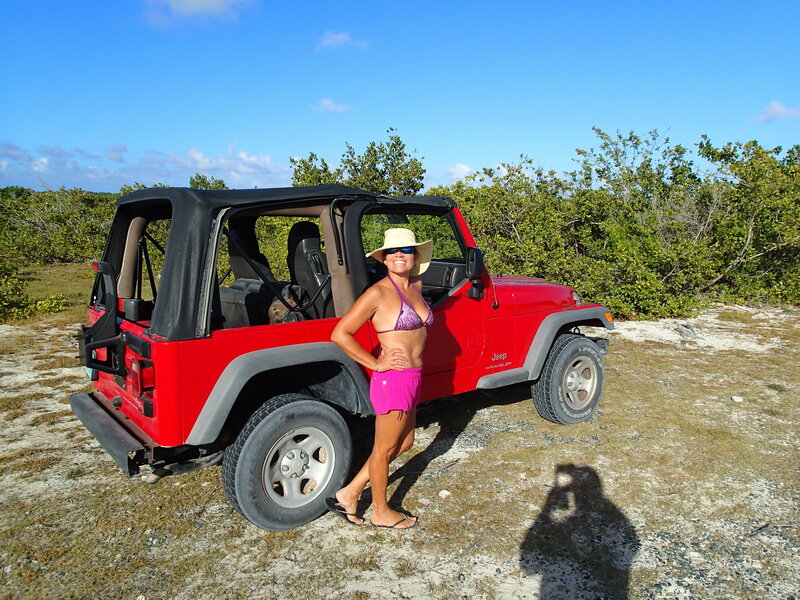 The best way to move around Culebra is renting a golf cart or a Jeep. We didn’t see any taxis but there were a few shuttle vans that ran from the ferry dock to the beaches. The golf carts are lot of fun, but can be a little uncomfortable if you have more than 2 people. 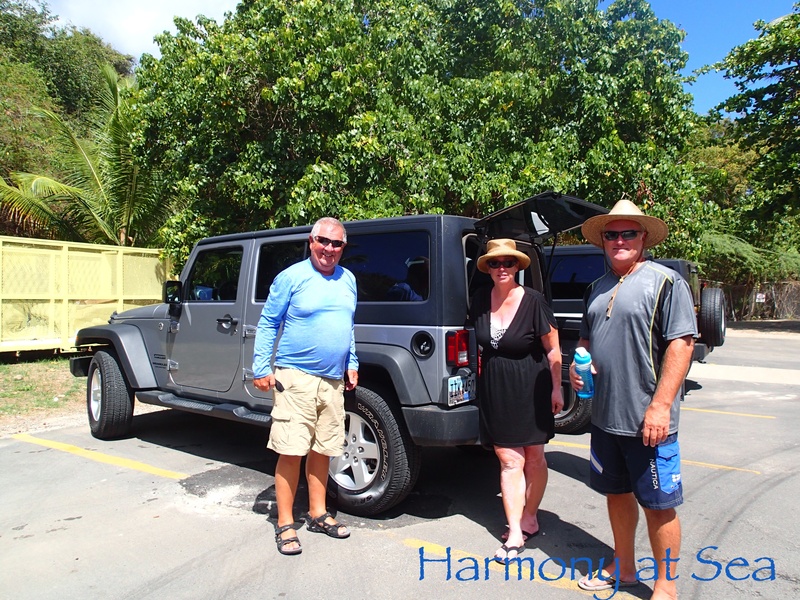 We rented a Jeep when our friends Pete and Donna from s/v Shirley Jean joined us. 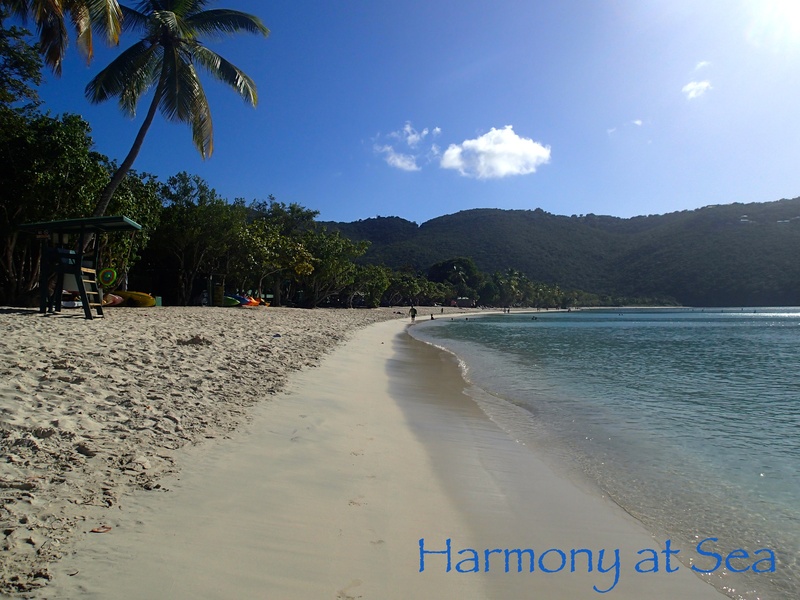 We visited Flamenco Beach, it is a tropical paradise, white sand, clear water, palm trees swaying in the breeze, just naturally beautiful, we love it! 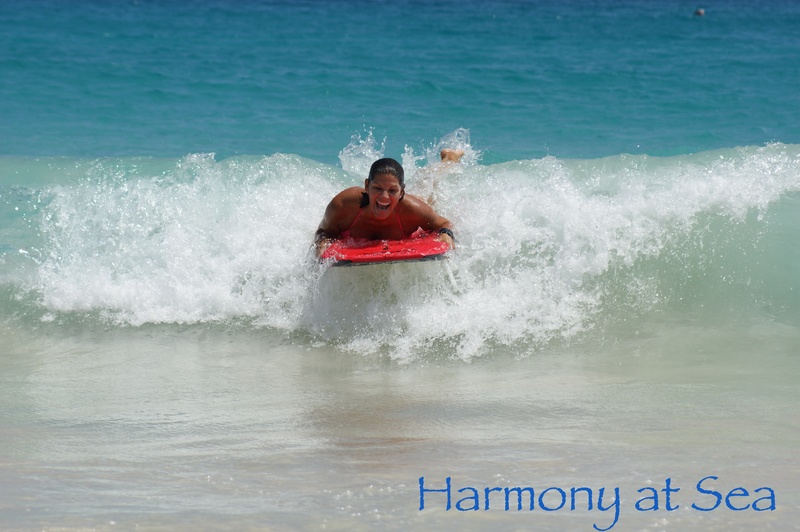 We enjoyed body and boogie board surfing, lots of fun! 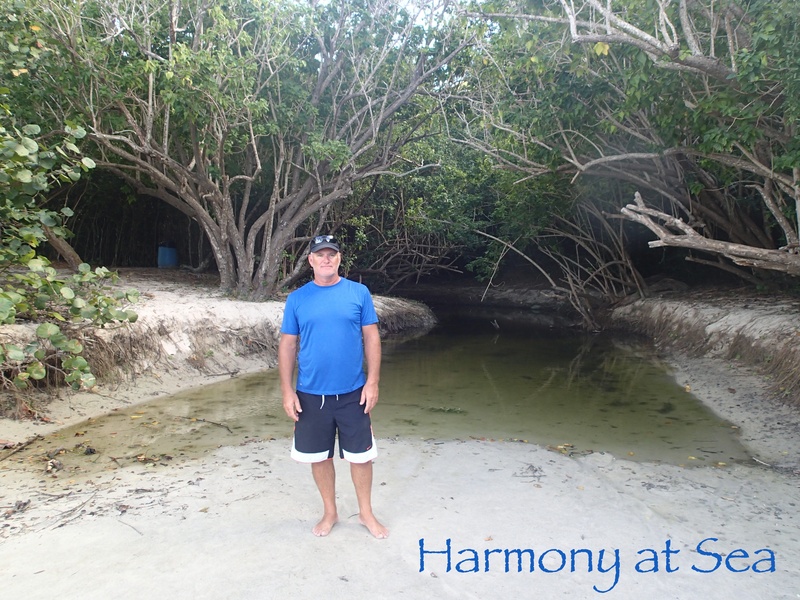 We also visited Tamarindo beach, great for snorkeling, and there are a lot of turtles there. 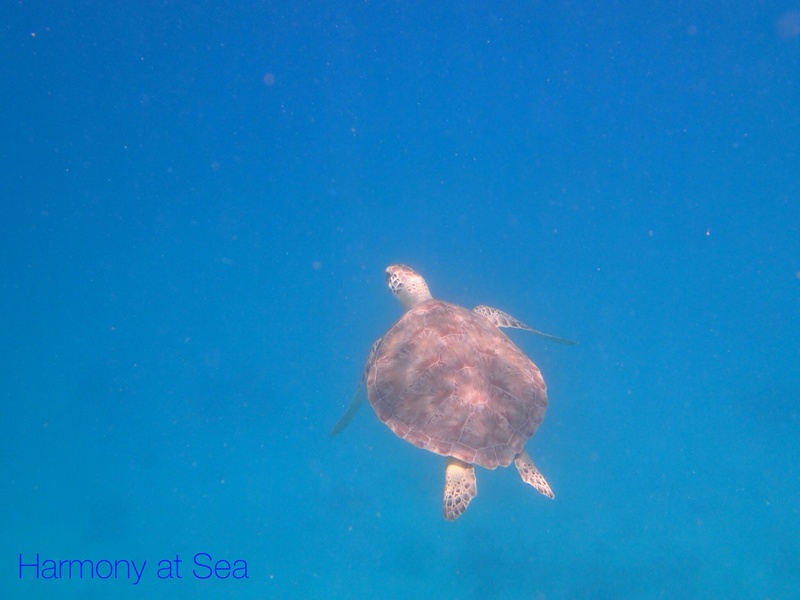 The turtles are so use to people you can swim close to them without them swimming away. 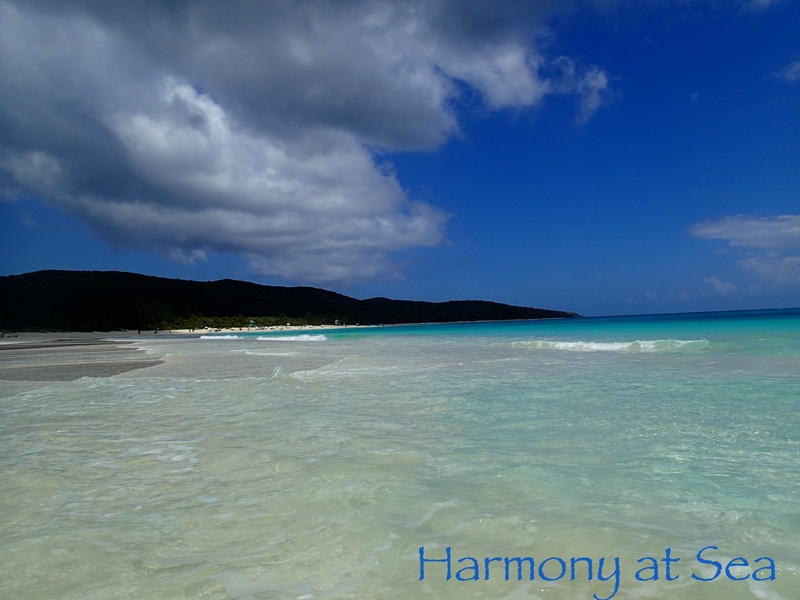 There are other beaches in Culebra but none as beautiful as Flamenco. 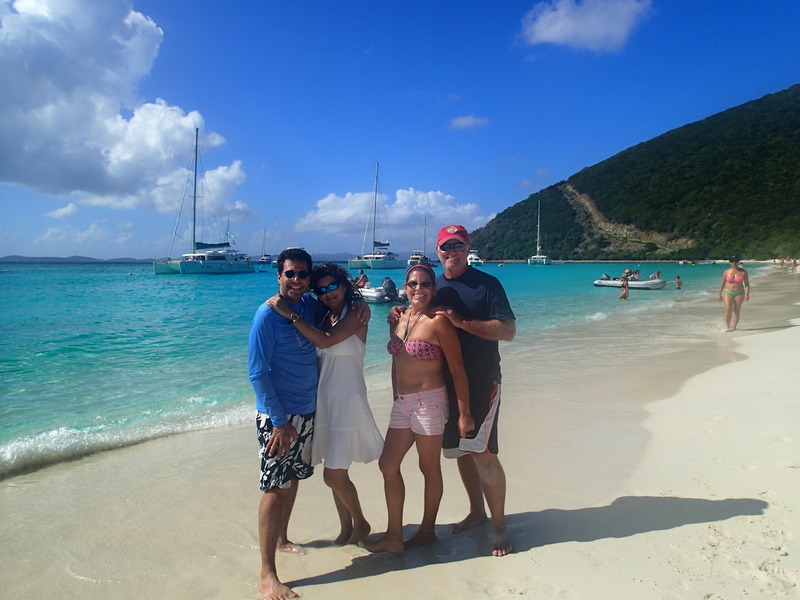 We visited Culebrita Island, a small beautiful uninhabited island off the eastern coast of Culebra. 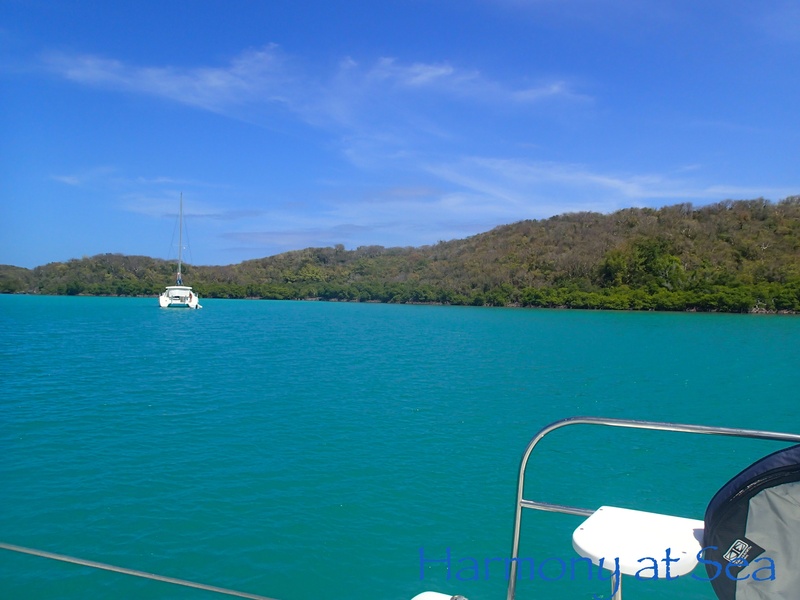 Unfortunately the anchorage was very rolly so we only stayed one night. 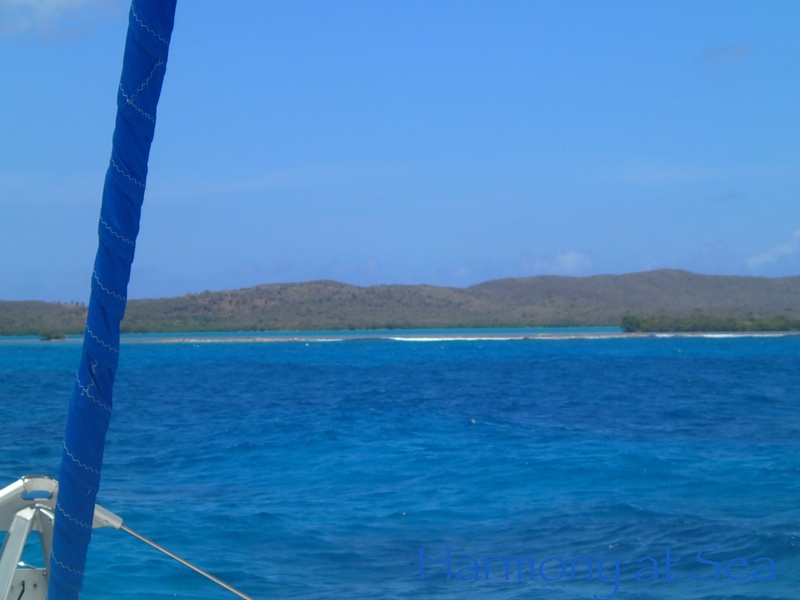 We sailed to Vieques, the bigger island, and anchored at Ensenada Honda, a bay surrounded by Mangroves. The bay is very quite and peaceful but there are no facilities. 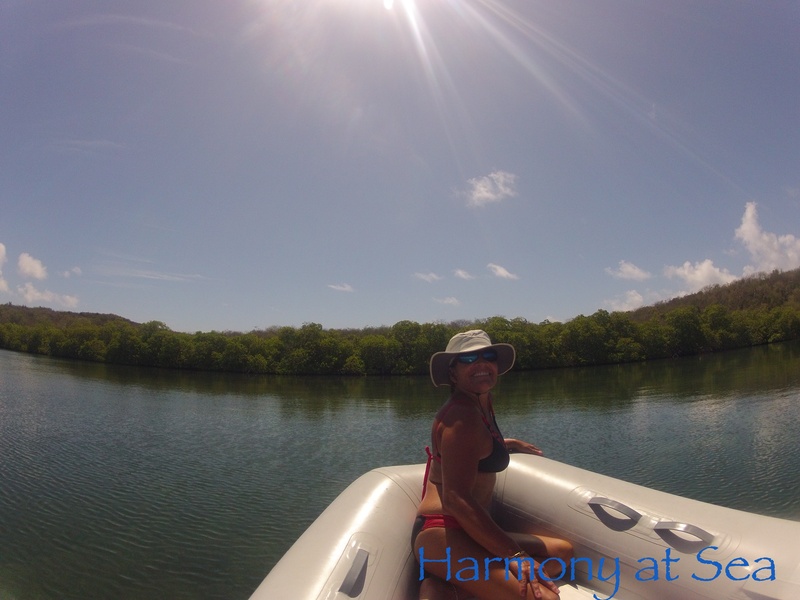 The mangroves are a great place to paddle board. 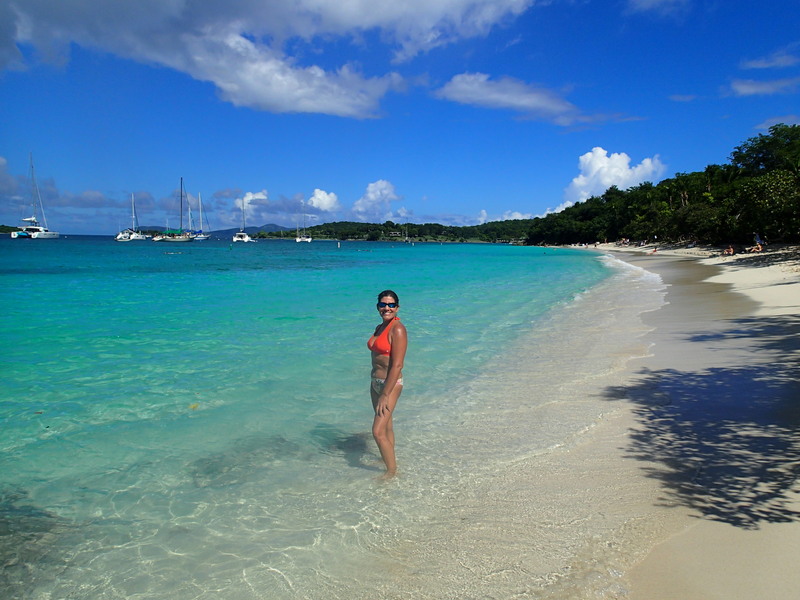 We had to return to the USVI for appointments so our stay in Vieques was shorter than we would have liked. 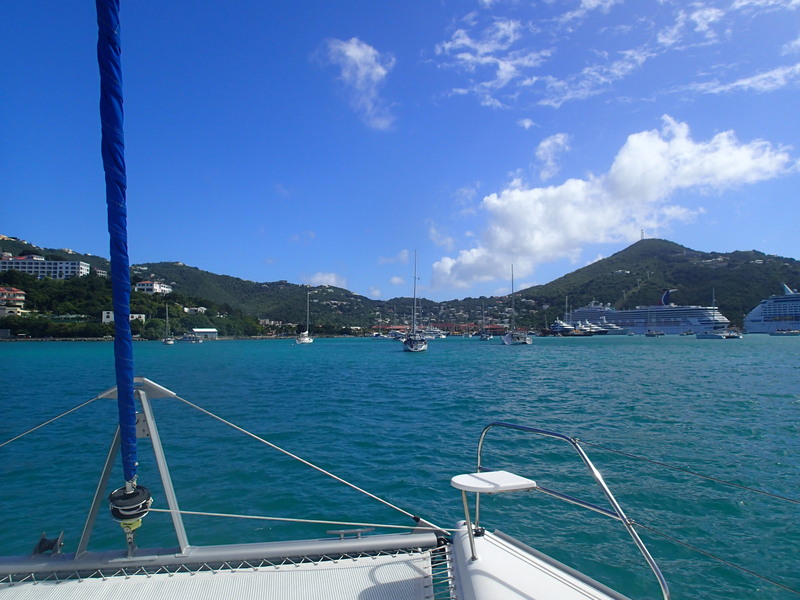 We are back in St. Thomas, anchored at Brewers Bay preparing for our trip to Grenada. Arriving at Ensenada Honda, Shirley Jean in the foreground. 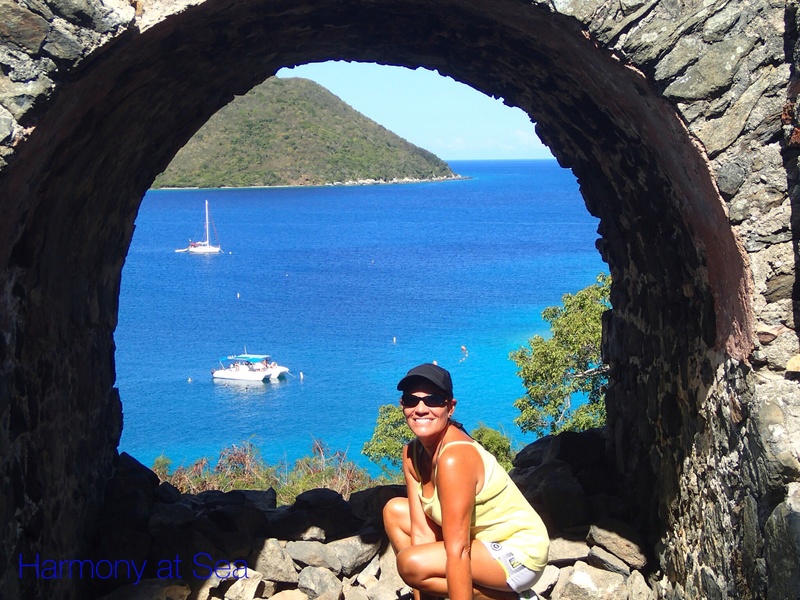 We spent 15 days exploring St. John, visiting most of the bays. 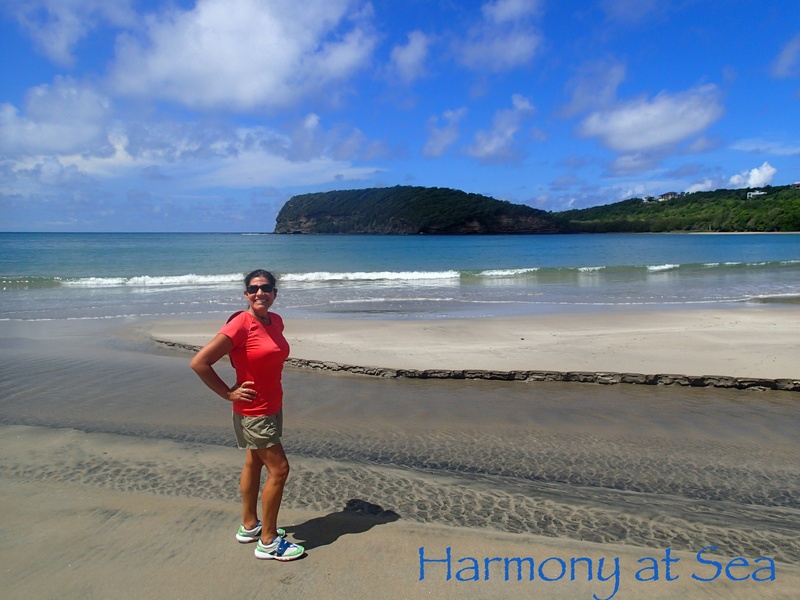 They are all beautiful, great beaches, great snorkeling and several trails to hike. 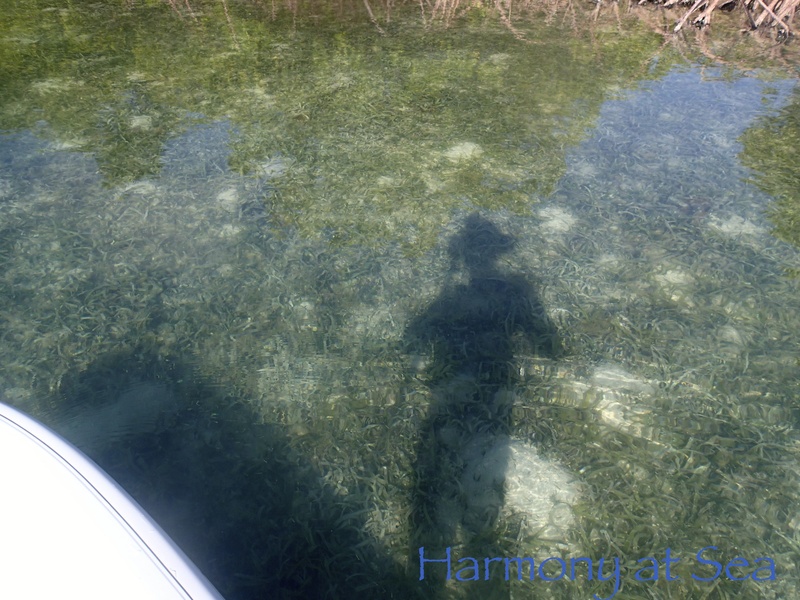 The color of the water is amazing, most of the bays are so clear you can see the bottom. 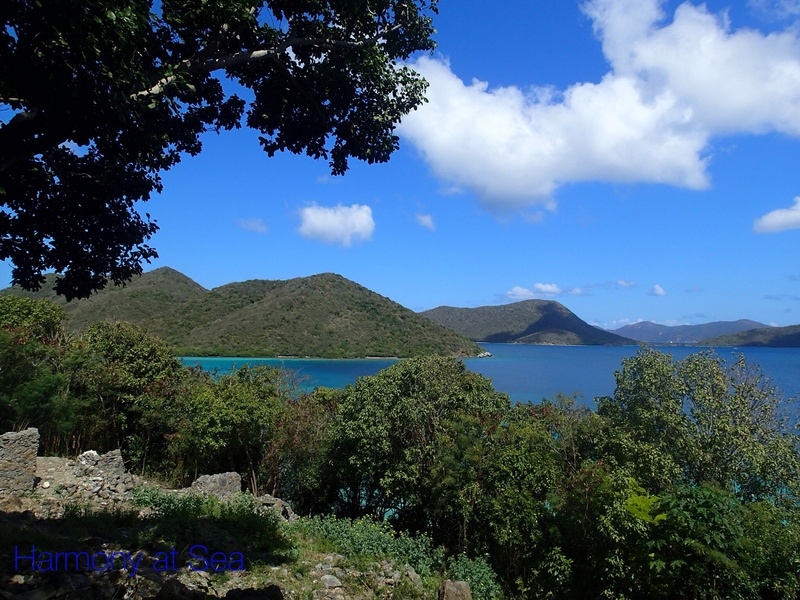 The National Park Service does a great job of taking care of the reef around St. John. 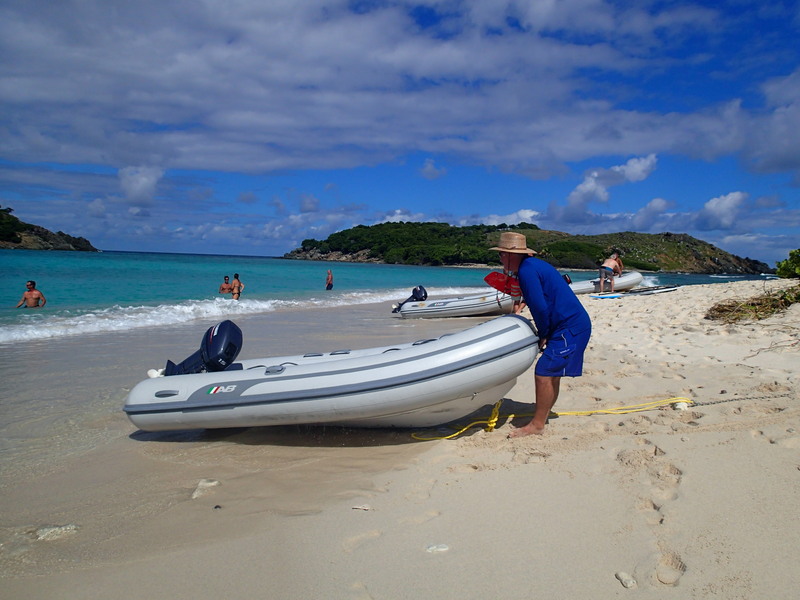 In the majority of the bays you can’t anchor and there are restrictions on where to land your dinghy. 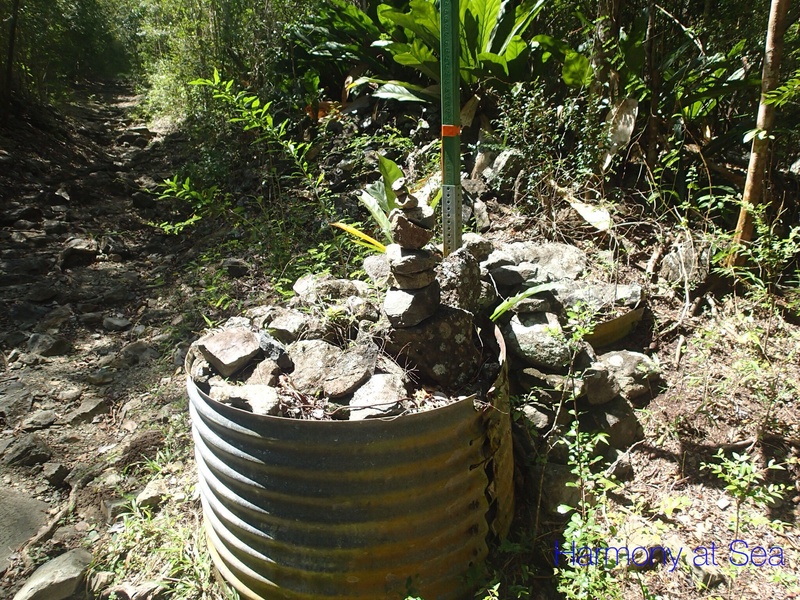 The park service also keep the trails clean and marked for us to enjoy. 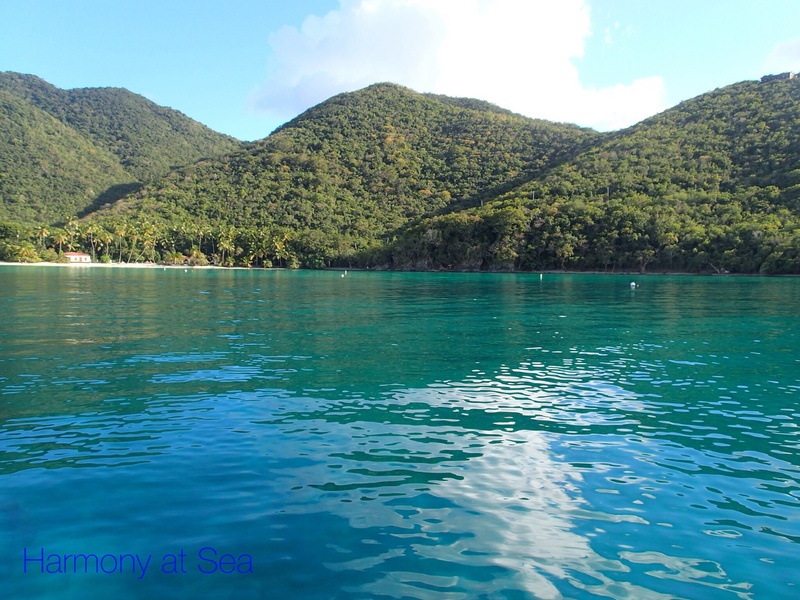 Our favorite bay on St John is Leinster Bay. 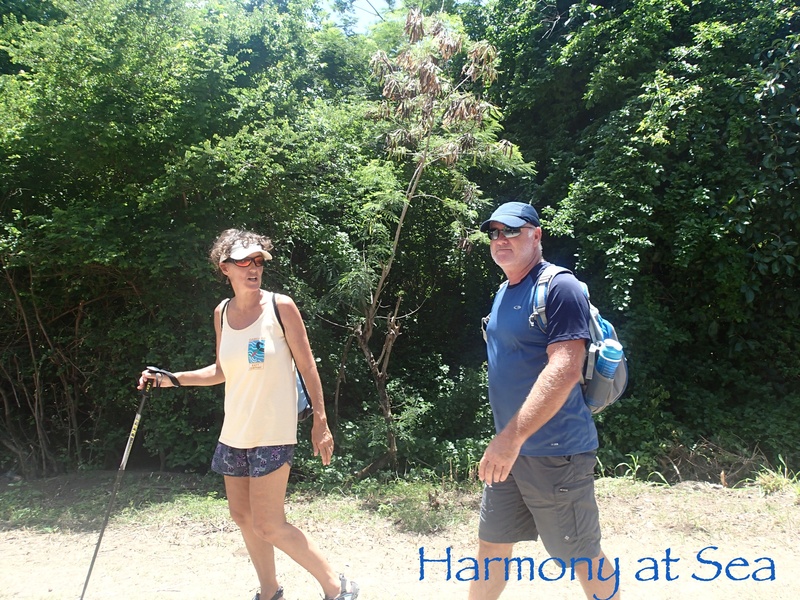 We enjoyed hiking the trails and snorkeling around Waterlemon Cay. Bean Bag games, goats and cold beer! 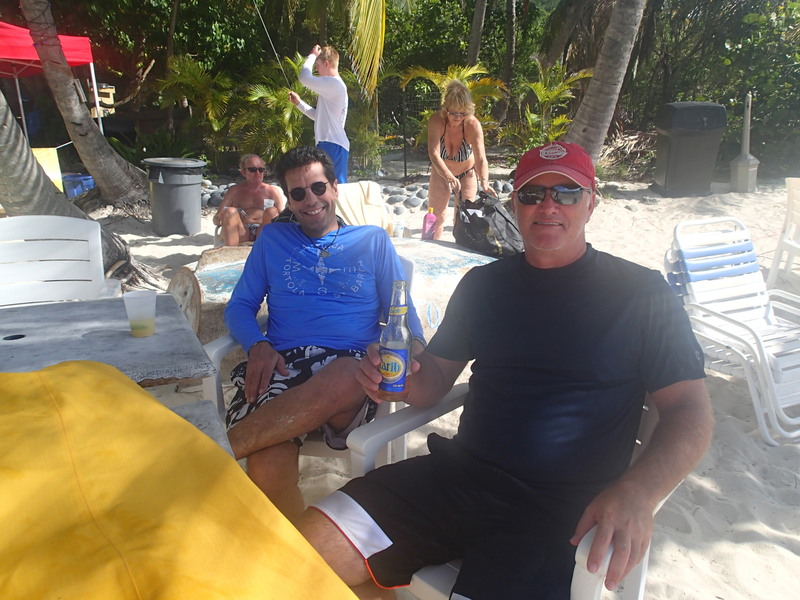 We returned to Diamond Cay and discovered a new Beach Bar had opened at the corner of the bay where we like to anchor. 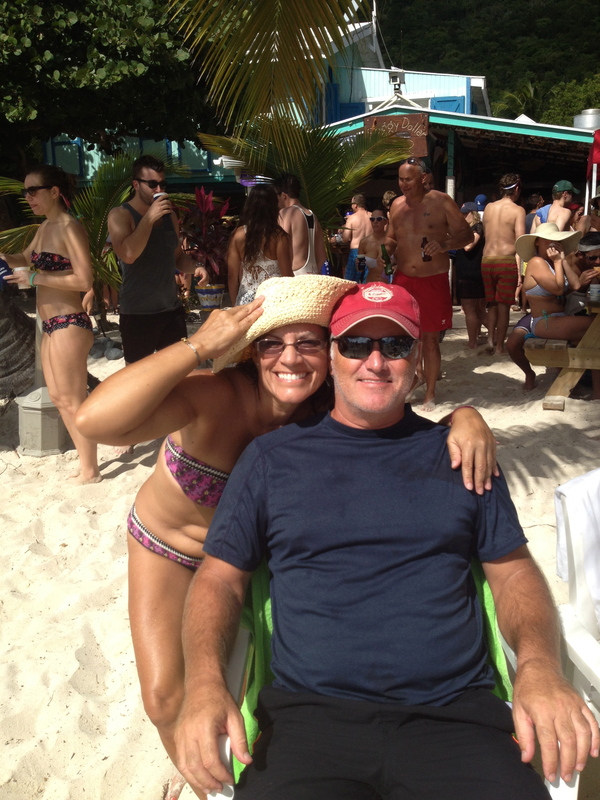 The Bee Line beach bar opened 2 months ago. 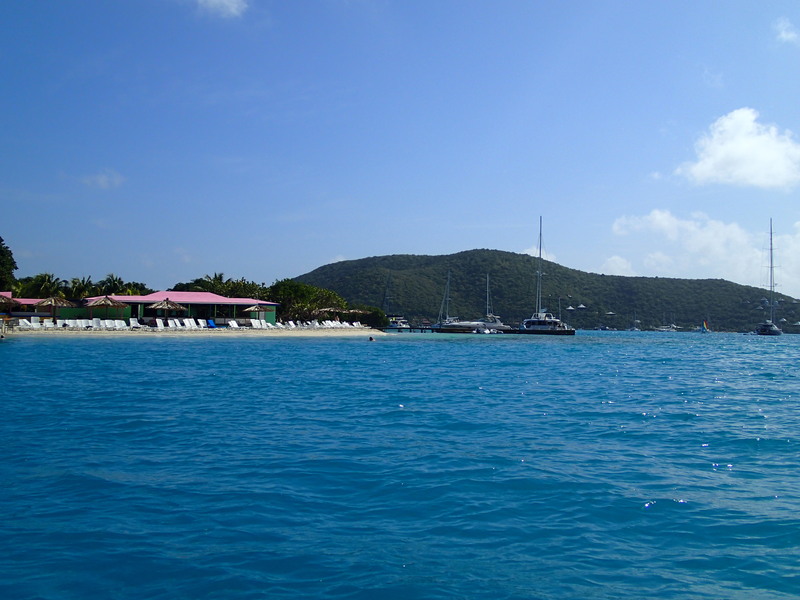 The bar is located on a small beach just to the right of the bay before you enter the mooring field. The area is small and cozy. 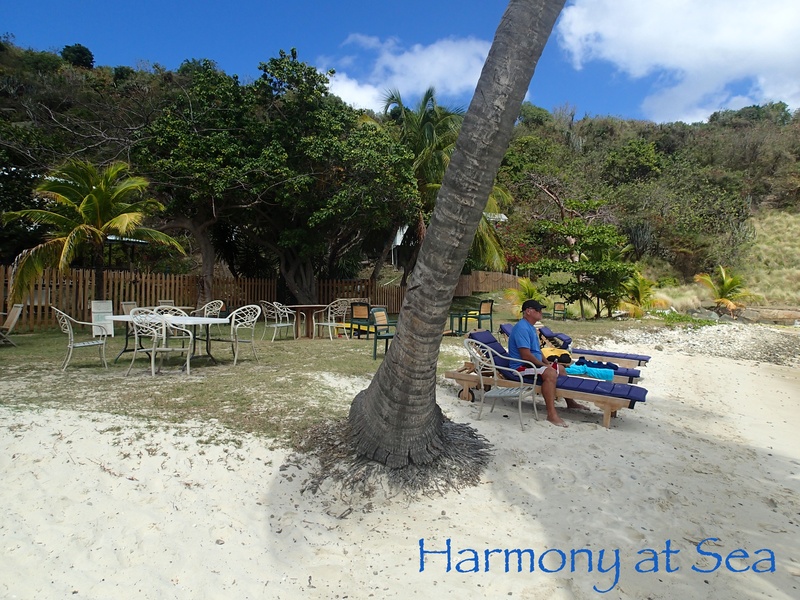 They have nice set up at the bar and tables and lounges at the beach. 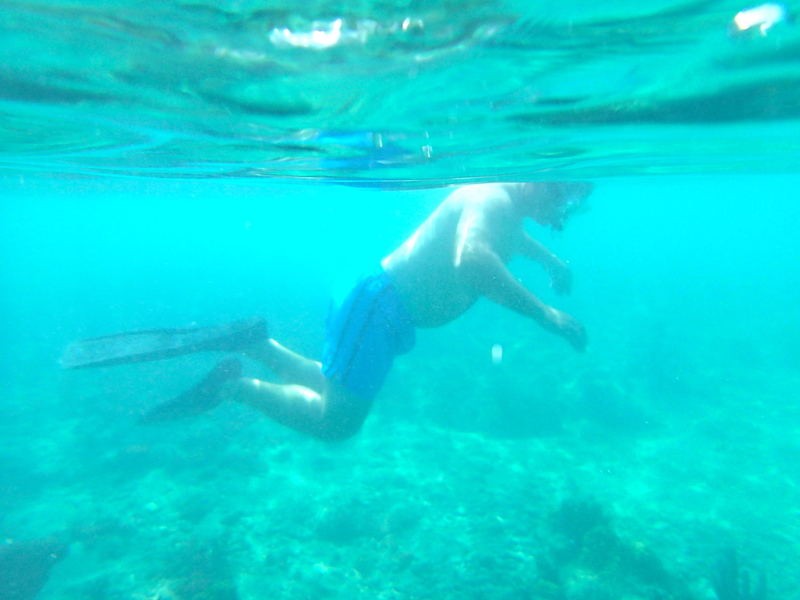 You can swim or snorkel. They have several table games and bean bag tosses. 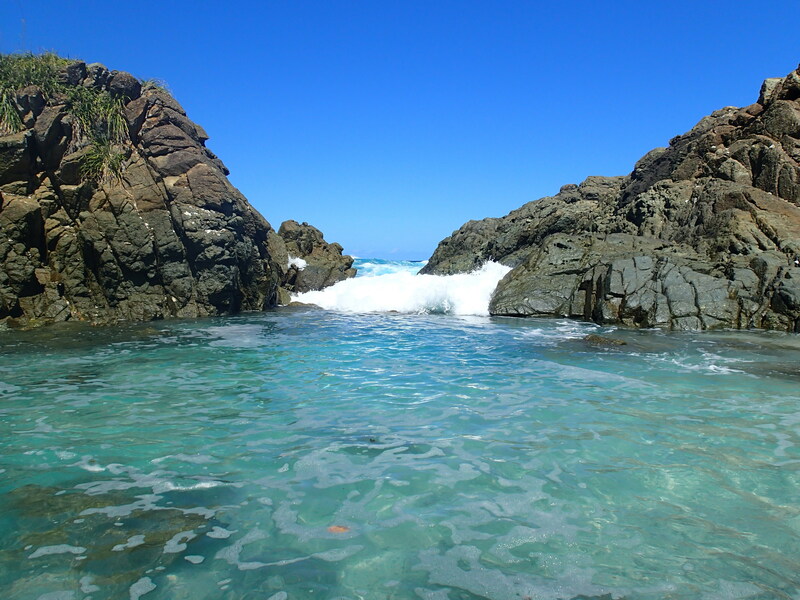 It is an ideal stop to cool off after taking your dinghy to Sandy Spit or returning to the boat after a hike to the bubbly pool. 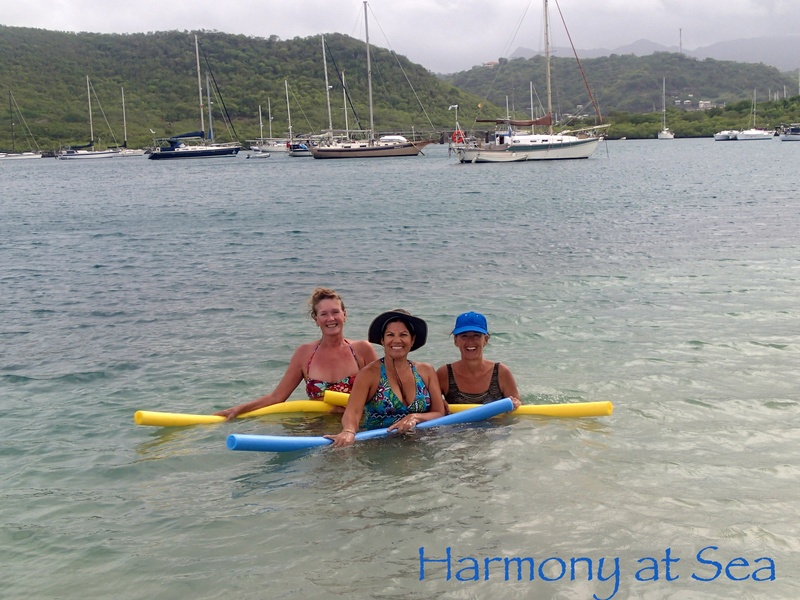 You can take your dinghy to the shore or tie off at the floating dock. 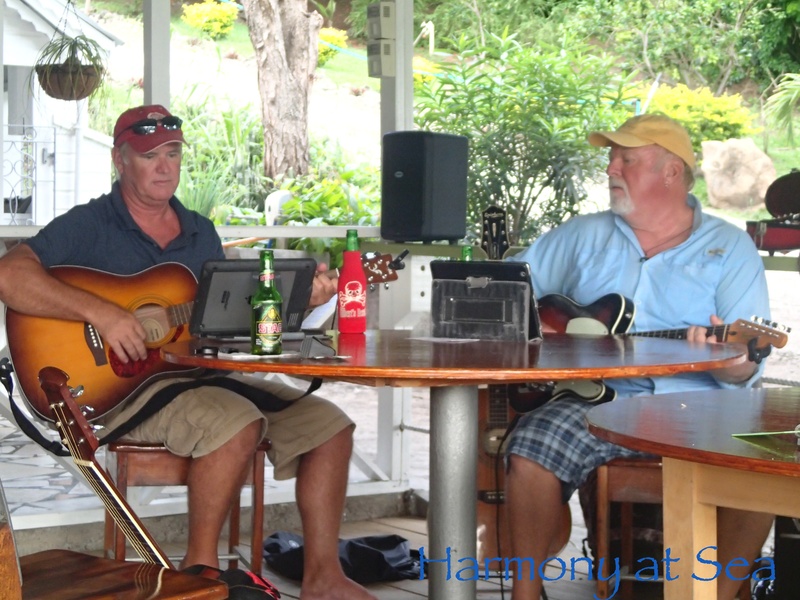 The anchorage is not as quiet as it once was during the day but the music is good and everyone ashore seems to enjoy the drinks and games. 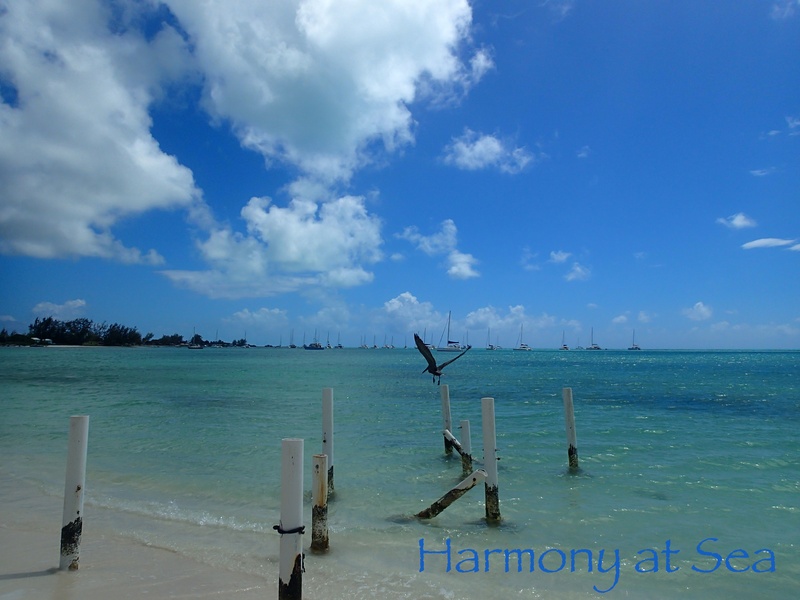 The area to anchor in is small and everyone wants to be close to the shore so expect close neighbors while anchored. The nights are still quiet and the area is beautiful. 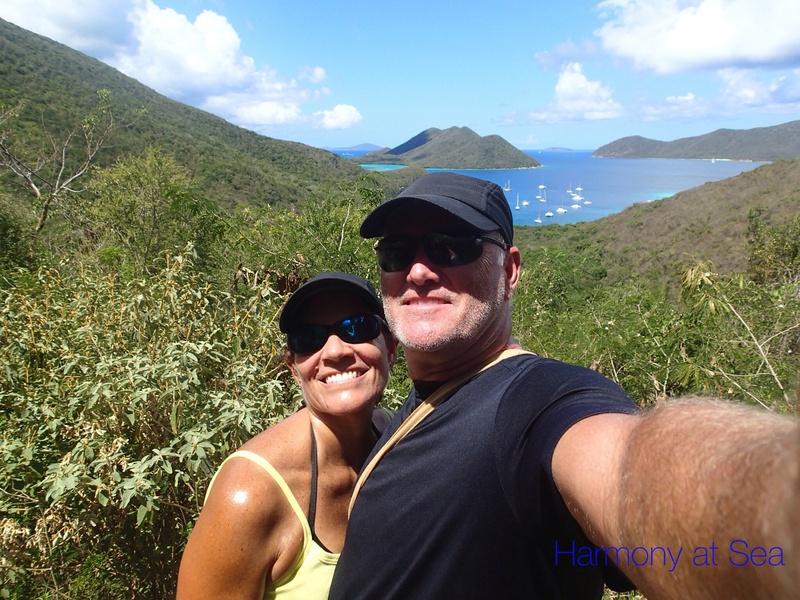 It has been several weeks since our last post, we have been very busy having lots of fun 🙂 We’ve been sailing around St Thomas and the BVI, visiting new spots, enjoying great weather and good company. 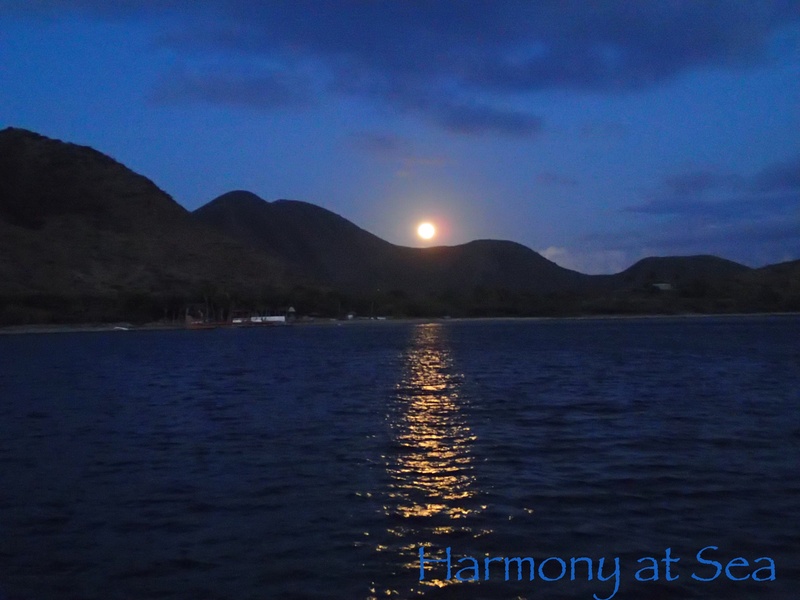 We spend Valentine’s day at the Full Moon Party in Trellis Bay. It was lots of fun. 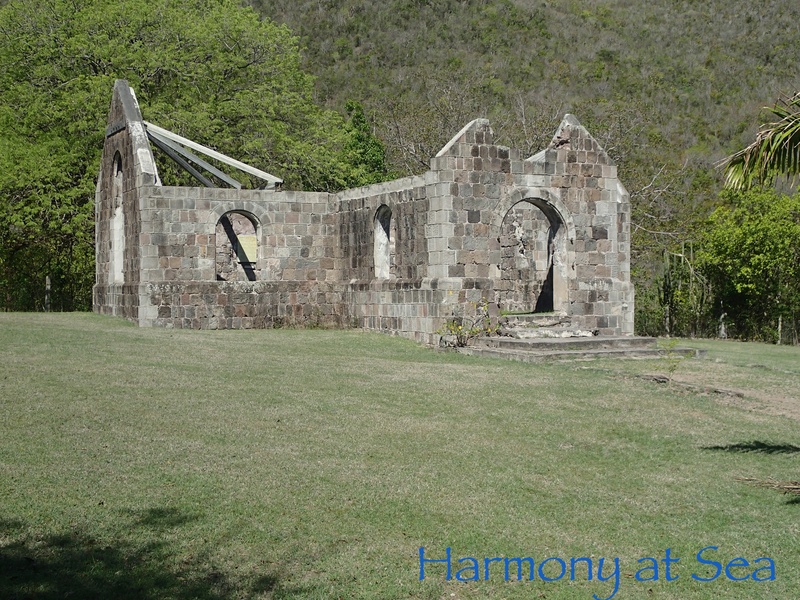 We went back to Virgin Gorda and Anegada, in our opinion the most beautiful islands in BVI. 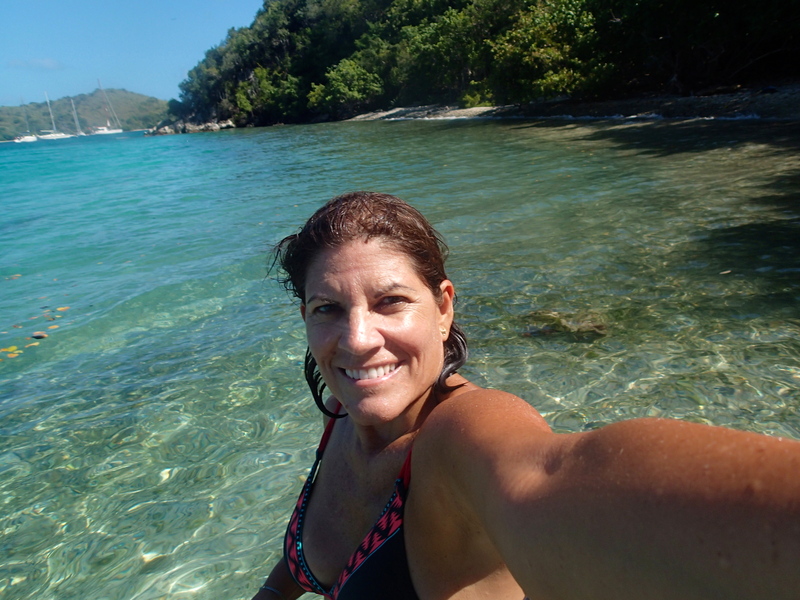 We had great snorkeling at Great Dog, The Baths and Cooper Island, where I swam with sea turtles, it was an awesome experience! 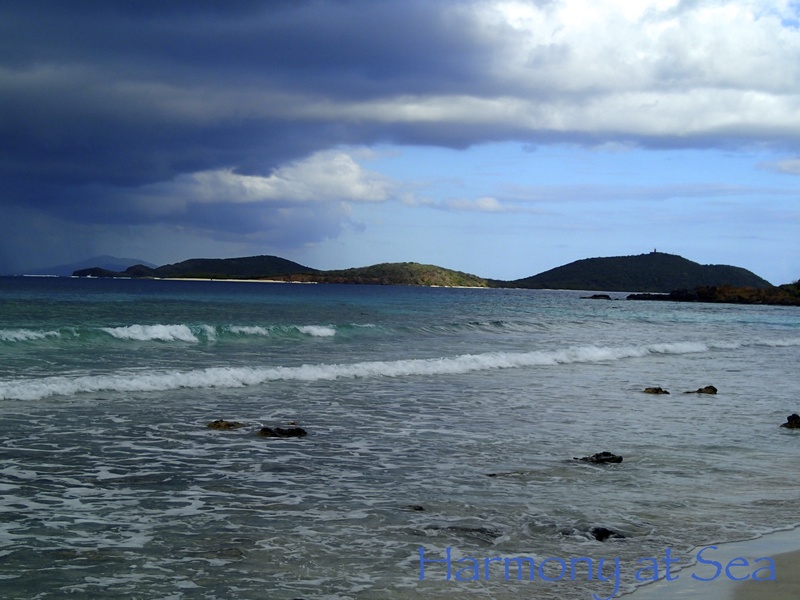 The weather in general was very good, we had a few rainy days and some very windy days. 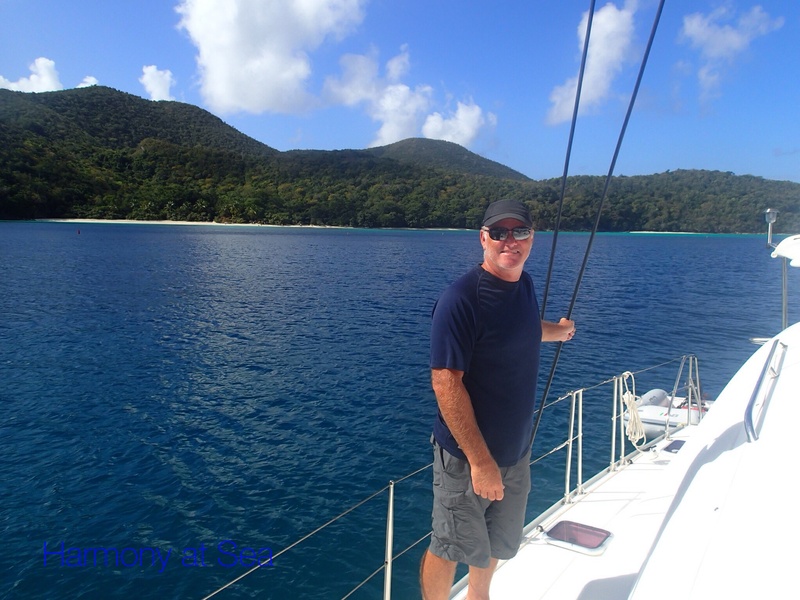 Most of the time we stay put when the wind and waves are predicted to be high but this time we decided to go out and sail from Anegada to Savannah Bay with 25 knot of wind and high seas to get some experience. 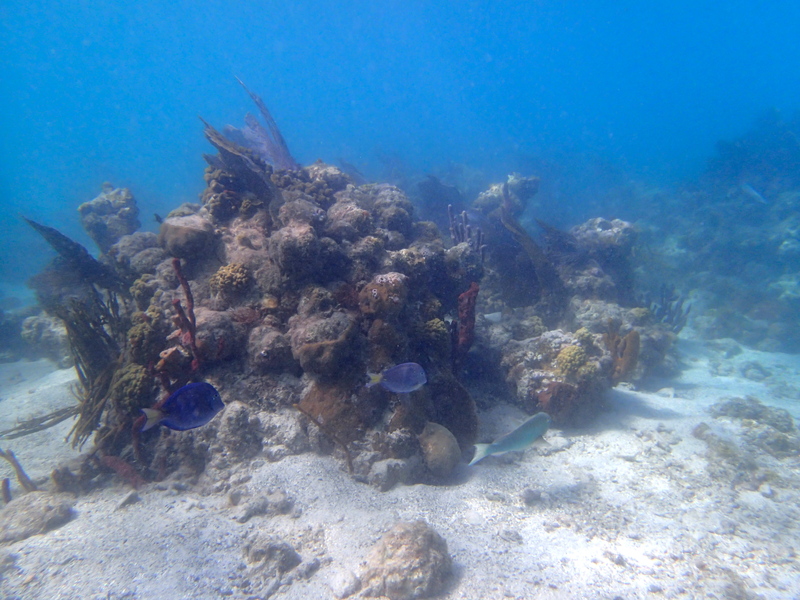 We put a double reef in the main and off we went. 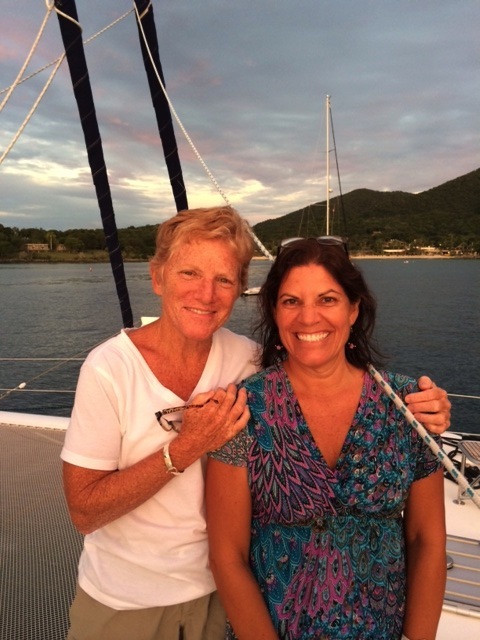 We were happy we did it because we had gusts of 32 knots and my confidence in the boat grew. 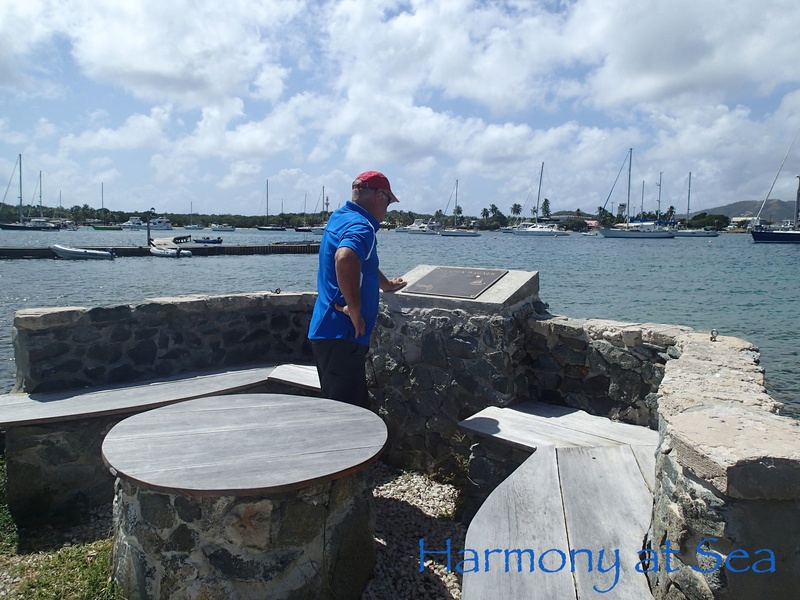 Today we are at Nanny Cay Marina waiting for our new sunshades to be installed. We are planning to stay here a couple of nights, or as long as it takes for Quantum to finish the job. 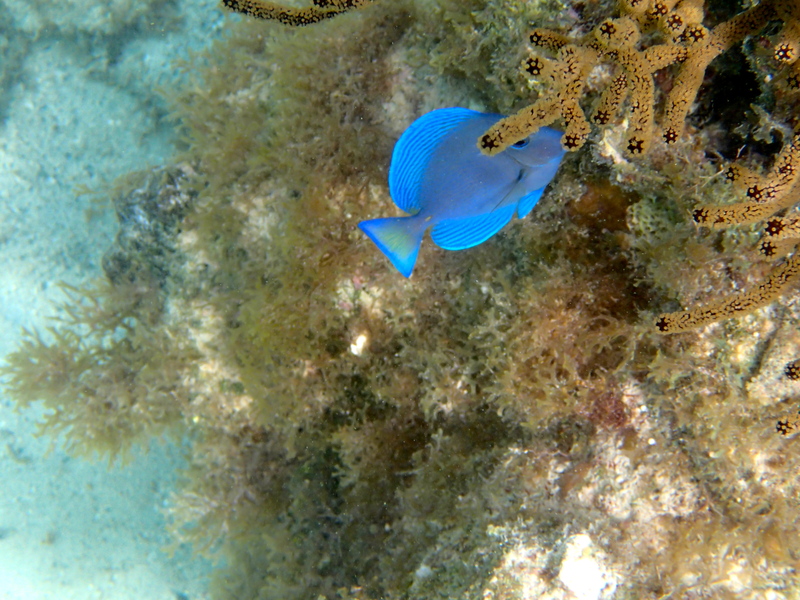 We found several of our friends at the marina so I think it will be fun to hang around for a while. 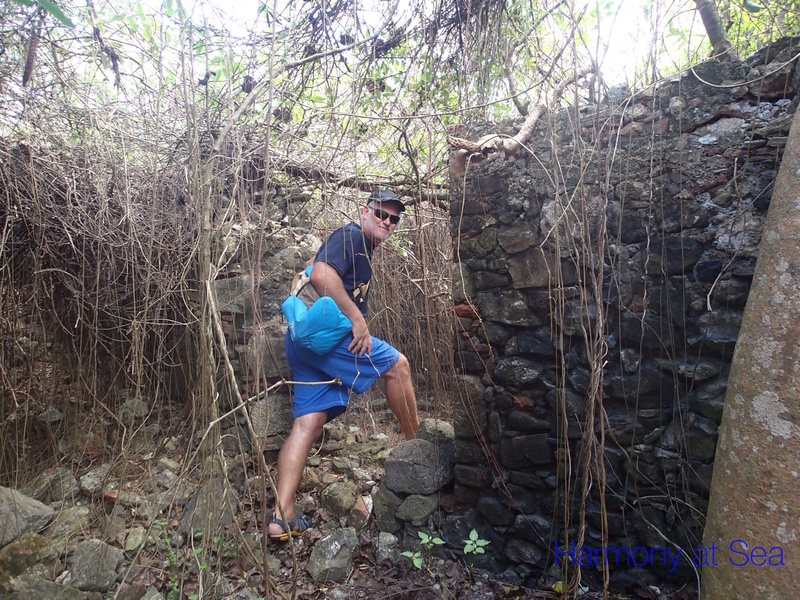 See below for photos of our travels. We don’t normally monitor the VHF radio when anchored, but because we were relocating the boat in the anchorage and would be anchoring closer to the channel we decided to turn on the radio. 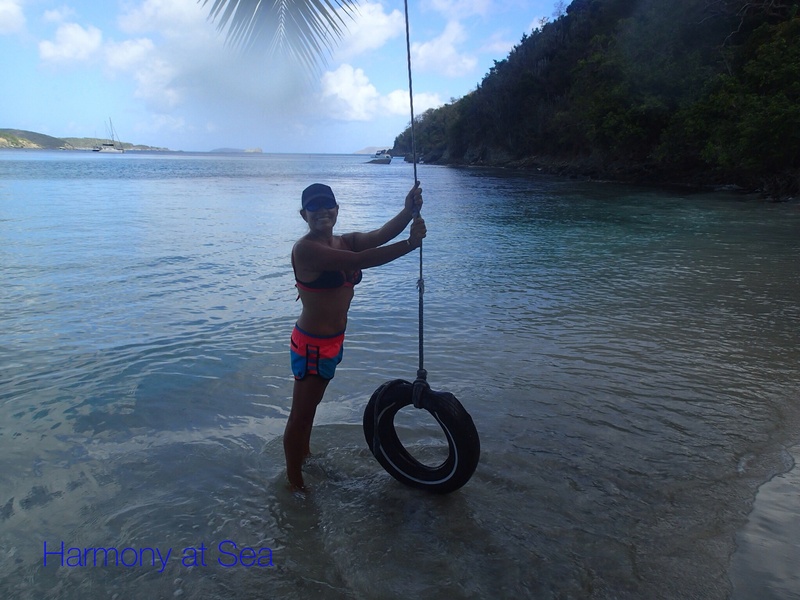 Shortly after setting the anchor we heard a call on the radio that we hope we never have to make, and one no one likes to hear. “US Coast Guard, US Coast Guard this is the sailing vessel (name withheld) we have run aground and my wife has been seriuosly injured, we need help”. 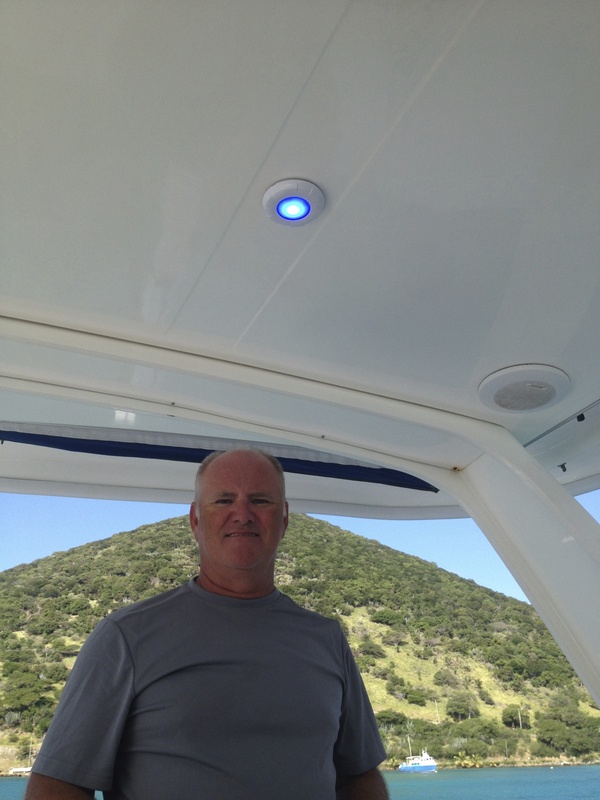 The captain had steered to the wrong side of the channel marker and hit a reef just a few hundred yards in front of us. 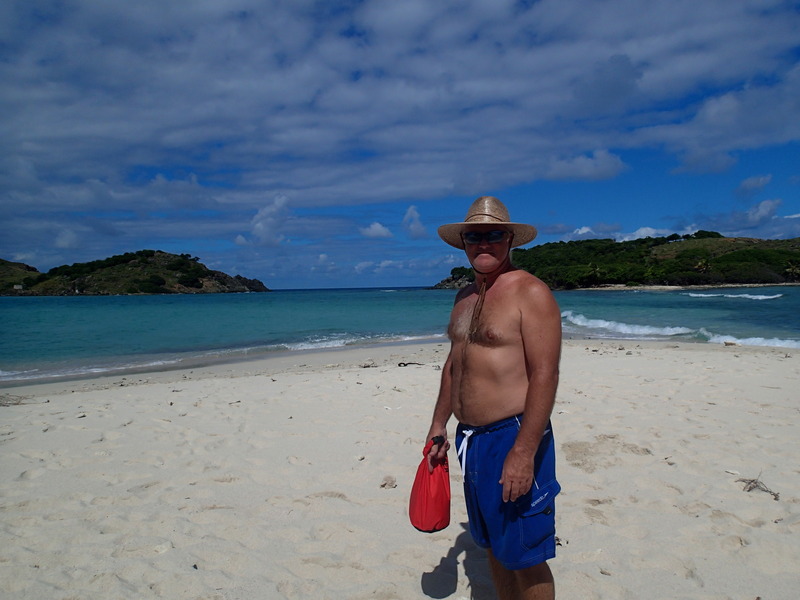 My hubby jumped in the dinghy and went to see if he could help. 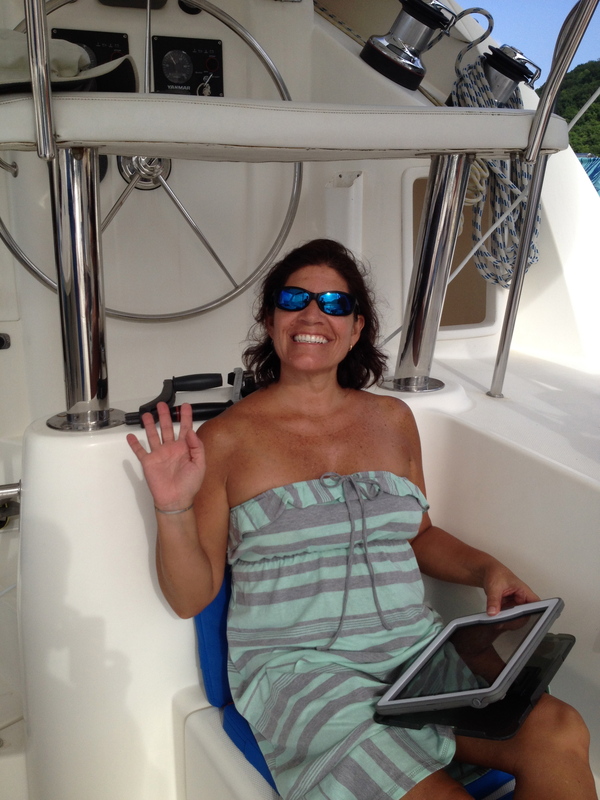 The Lady on the vessel had been thrown down when the boat ran aground and had a laceration on her arm and said she felt like one of her ribs may be broken. 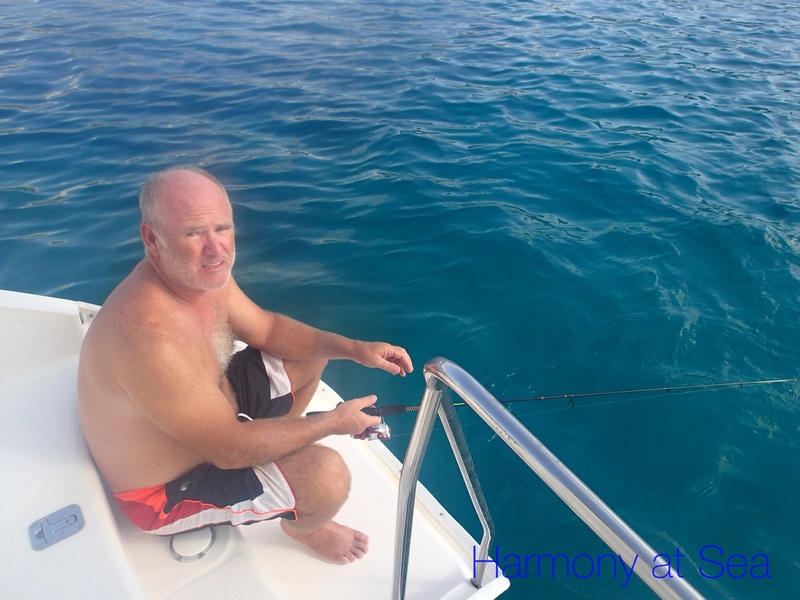 He stayed with them until Sea Tow showed up and advised they could take the wife to meet EMS and pull the boat off the reef. We went to the marina where the boat had been taken and learned from the husband that his wife’s injuries did not require stitches but one of her ribs was broken. 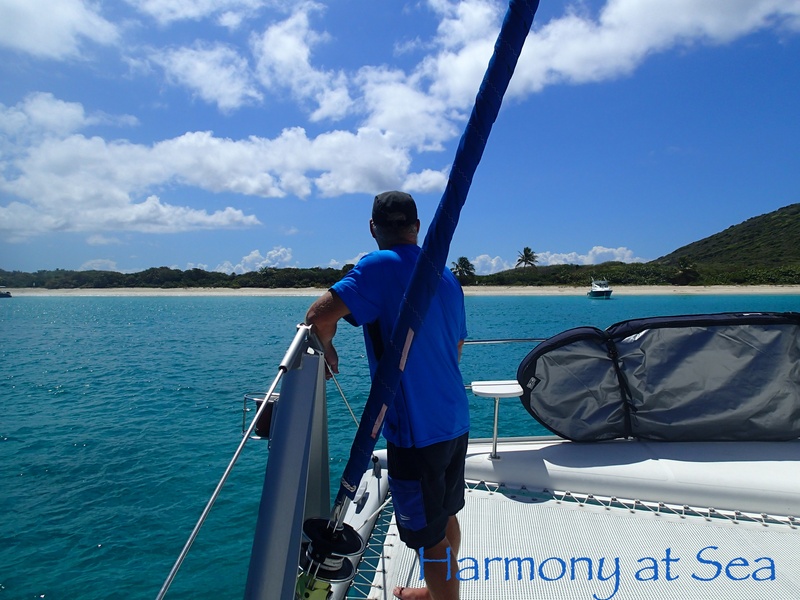 When we first started sailing I would say “I think we are here” and my husband would say we cannot “think” we know where we are we have to be sure of where we are. Their misfortune has helped me realize how true this is and how important it is to know where we are at all times and how a small mistake can result in injures to your crew/loved ones and damage to your vessel. 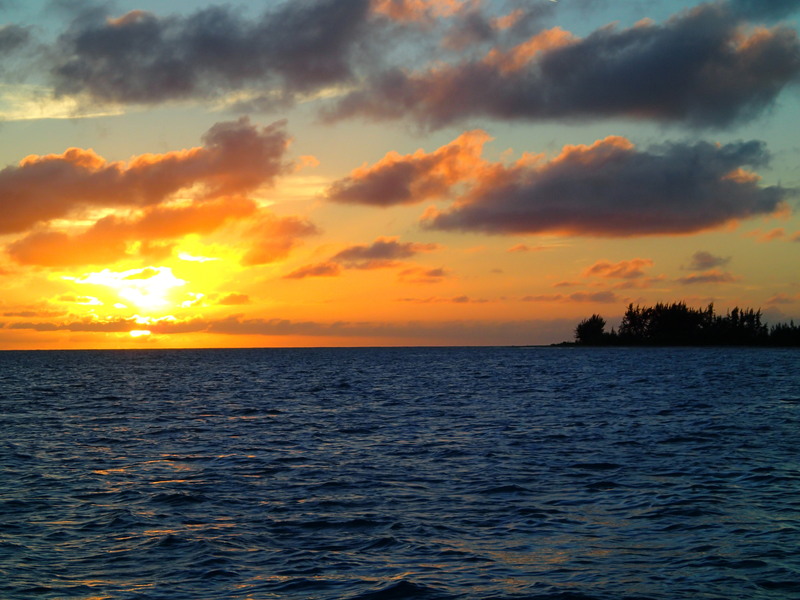 It is very important to have up to date charts for the area you are cruising and to keep a watchful eye for hazards in the water. Lesson Learned. 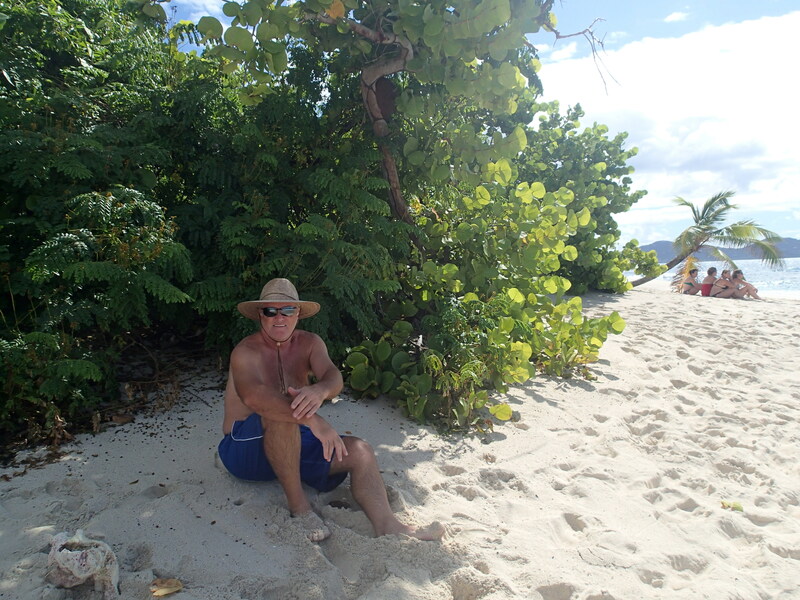 The days at Nanny Cay were stressful. The solar panel installation took longer than expected so we had too extend our stay. The marina wanted us to leave but fortunately Brendon the manager was able to juggle some boats around and allow us to stay and complete the work. Brendon also made us aware of the 3 for 5 rule. If you need boat work done and its supposed to take 3 days you reserve the slip for 5. 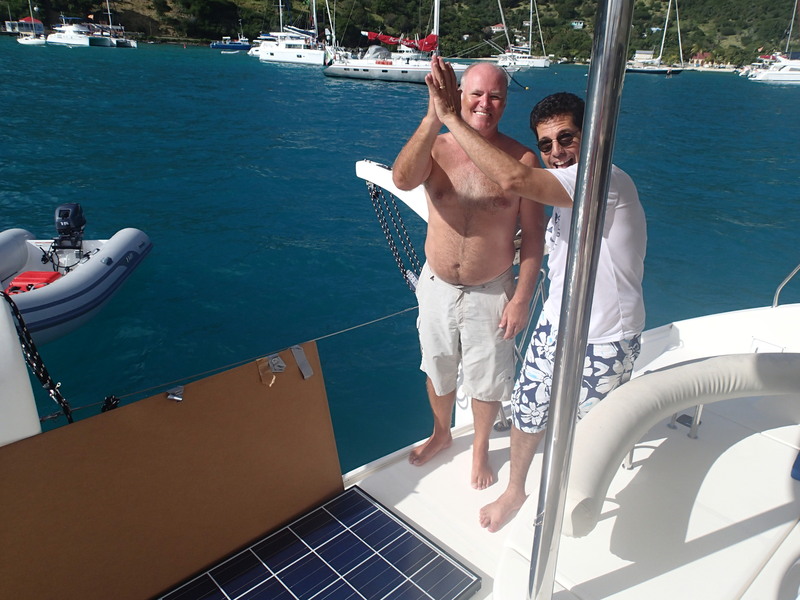 Royce installed the inverter and helped the electrician route the wires. 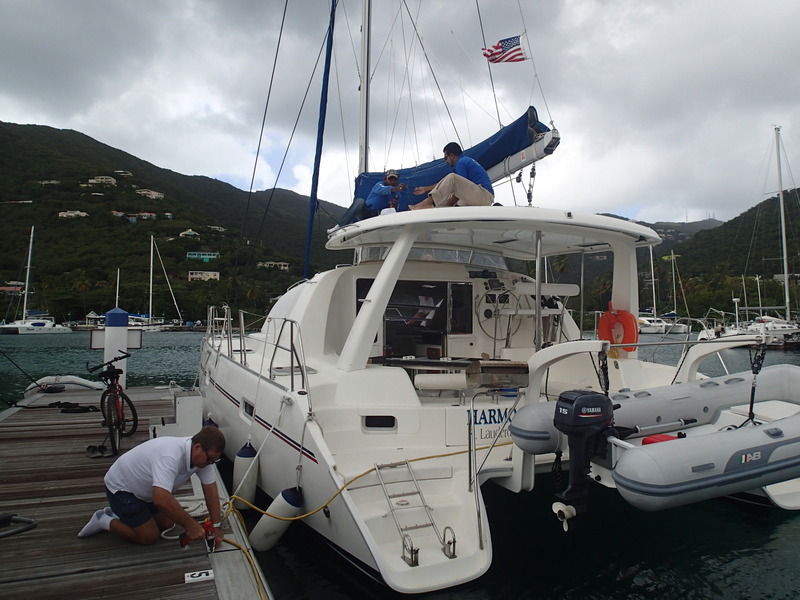 He also helped the employee from BVI marine services install the solar panel between the davits and route the wires inside the boat for all of the solar panels. 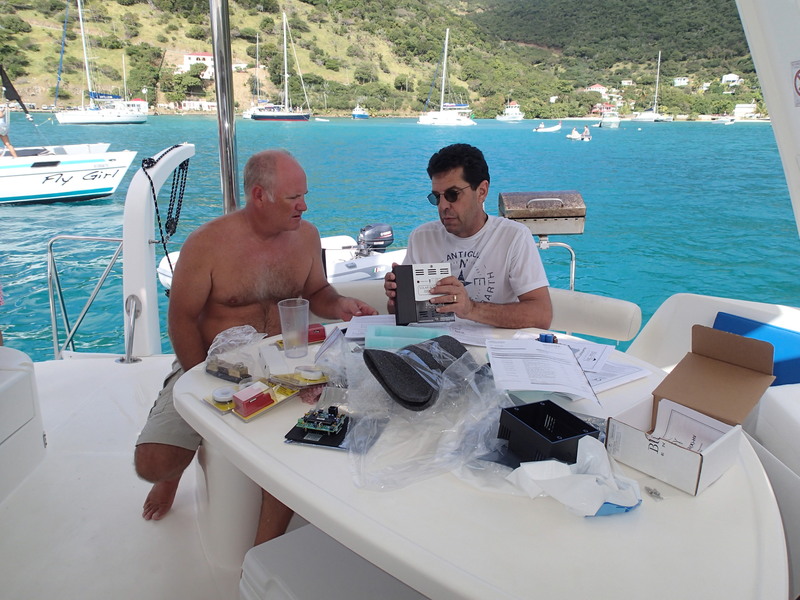 Once everything was in place we motored into the wind to Great Harbor, Peter Island so Royce could connect the solar panel wires to the controller and finish mounting the solar panels on the hard top. 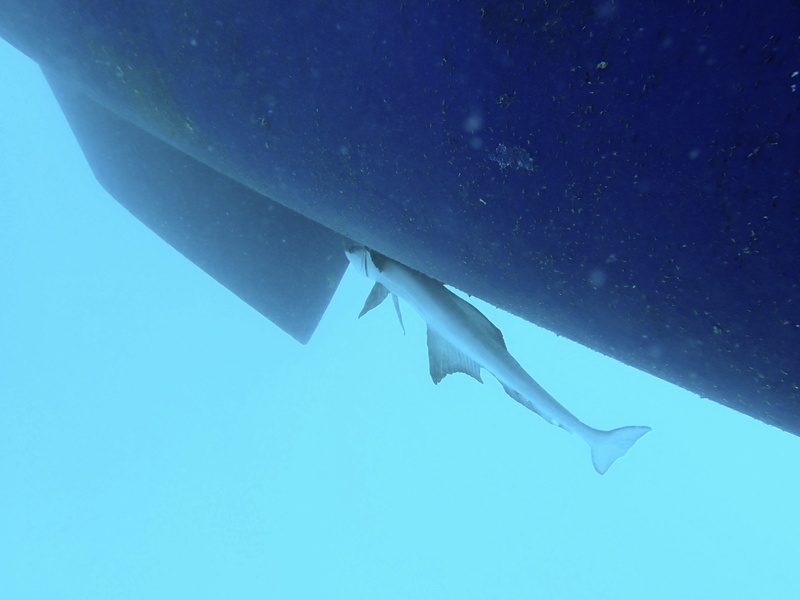 He spent several hours under the galley sink running the wires, a very tight space 🙂 At the end of the day we were making our own electricity, 25 amps an hour with the sun up. It is so good not to have to run the engines to charge the batteries. 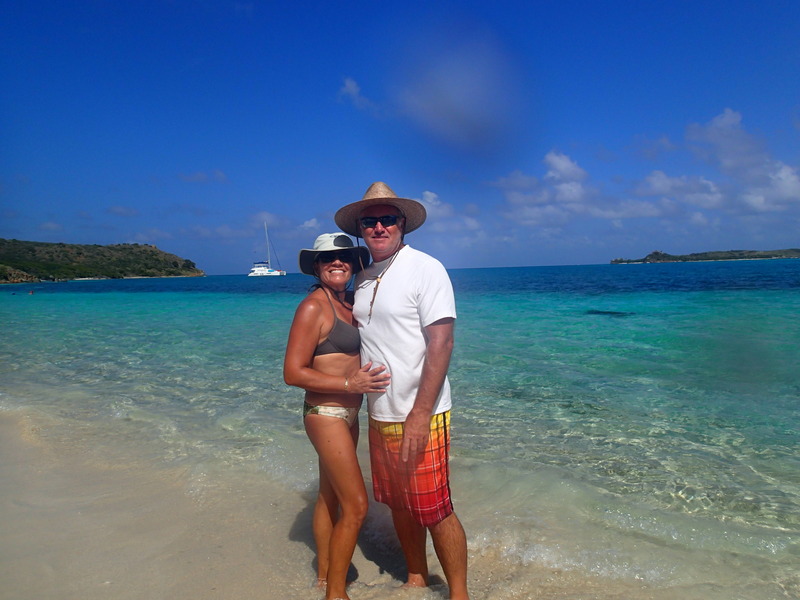 We stayed at Peter Island a couple of nights to relax, clean the boat and enjoy not having to run around doing work. 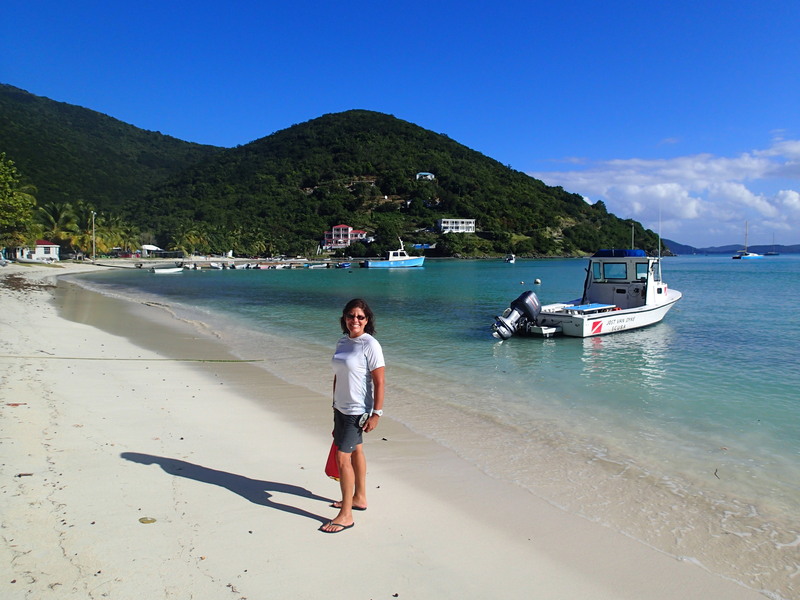 On the 18th we sailed to the islands we hadn’t visited yet Virgin Gorda and Anegada. Time to have some fun! 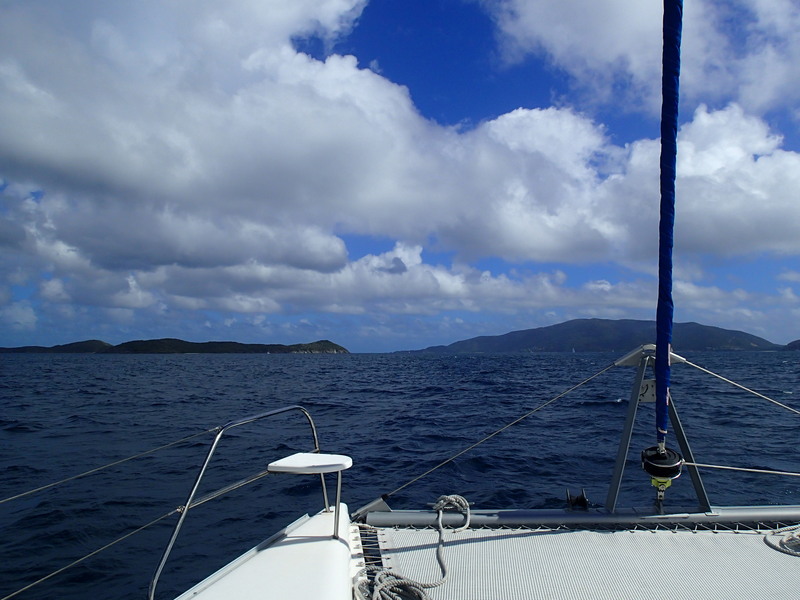 The sail to Gorda Sound (North Sound), Virgin Gorda was great. 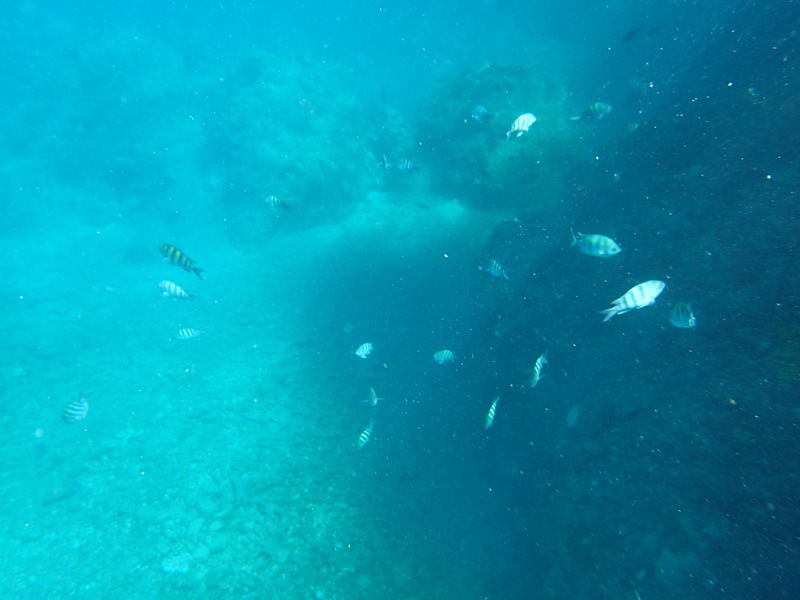 We were able to make good time although we were on a Close Reach. 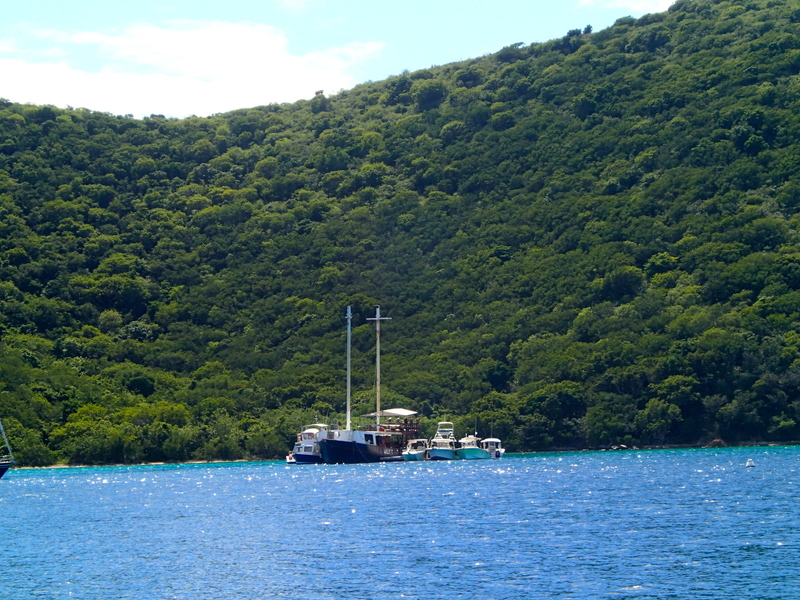 We anchored at Prickly Pear Island, very quite and beautiful. 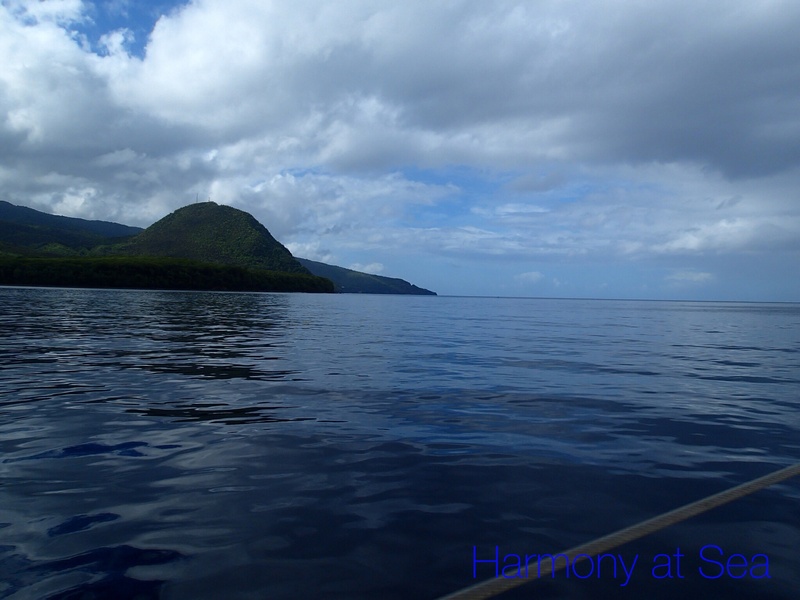 We visited the Marinas in our dinghy, Bitter End, Leverick Bay and Saba Rock. 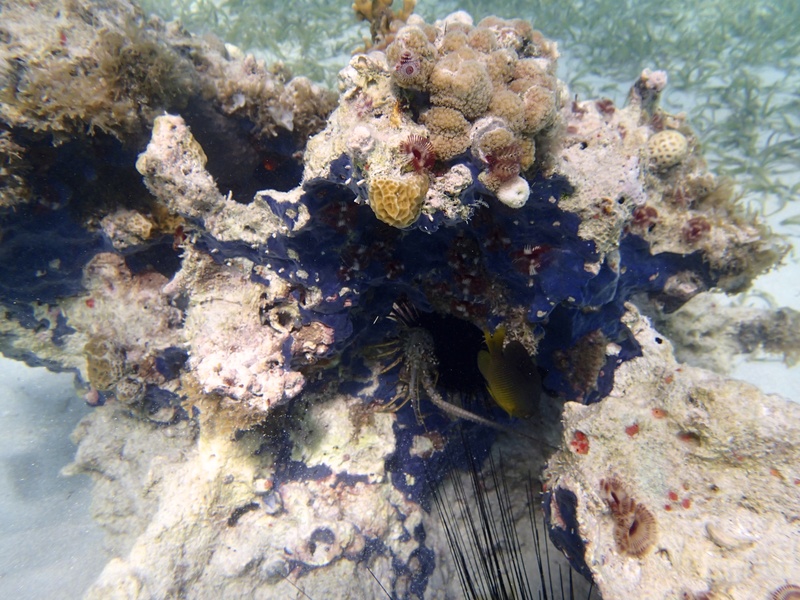 We snorkeled in Eustatia Island and saw a small lobster hiding in the coral. 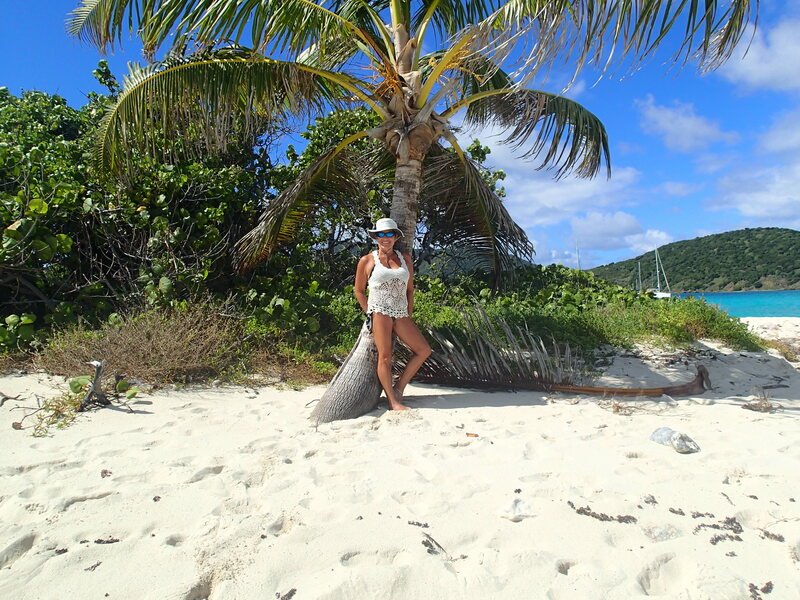 This part of Virgin Gorda is very beautiful, we would stay longer but we didn’t want to loose the great weather to sail to Anegada, the most remote of the British Virgin Islands. 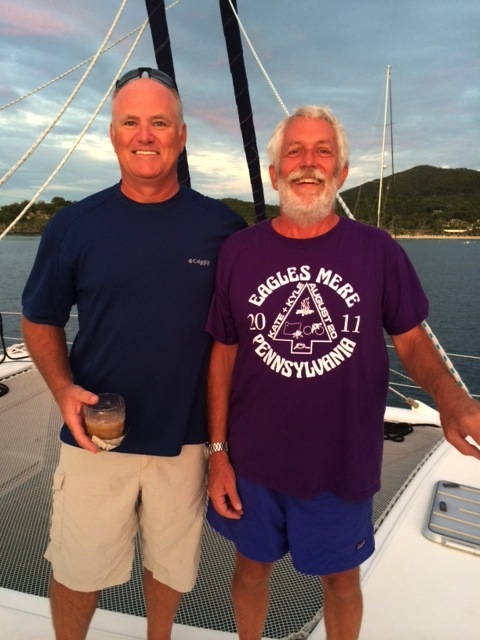 Sailing to Anegada was awesome, we made great speed between 6 and 8 knots, perfect weather, and good visibility to find the channel. 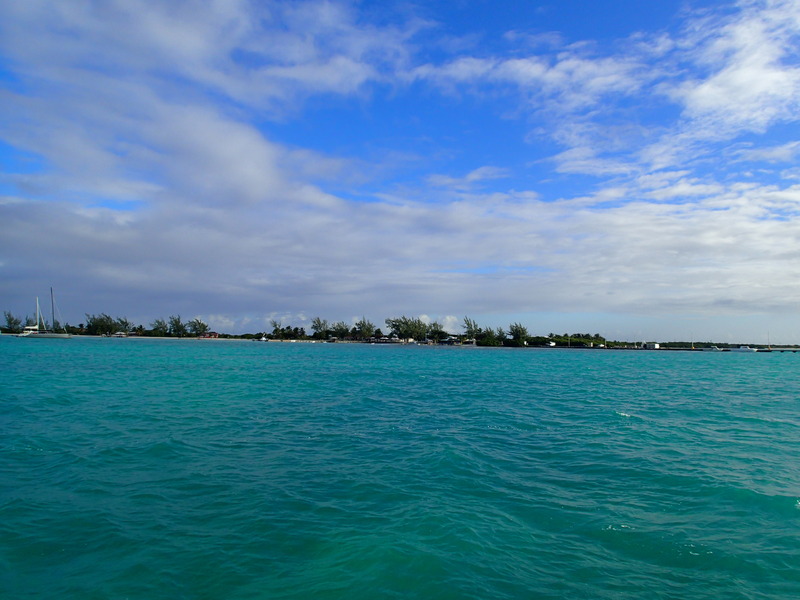 Anegada is surrounded by a large reef and numerous coral heads, that have claimed over 300 known wrecks at the Horseshoe Reef. 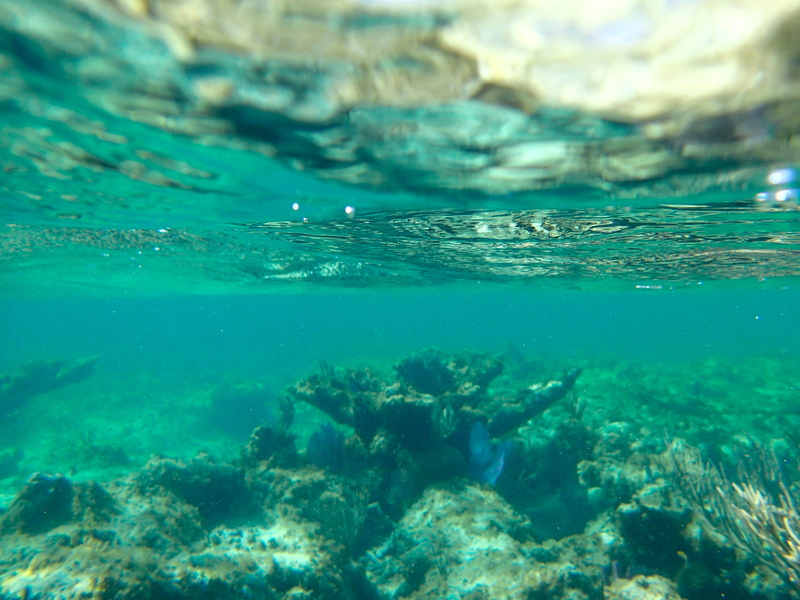 We anchored at Neptune’s Treasure, in very shallow water We only had 1.9 feet under the keel, scary 🙂 but that is one of the advantages of having a catamaran, our draft is only 4 feet 6 inches . 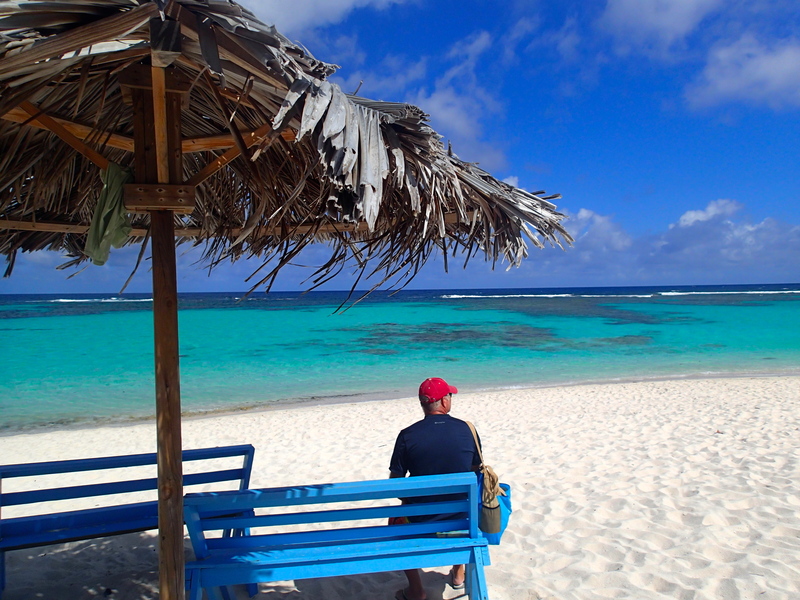 Anegada is such a beautiful island. 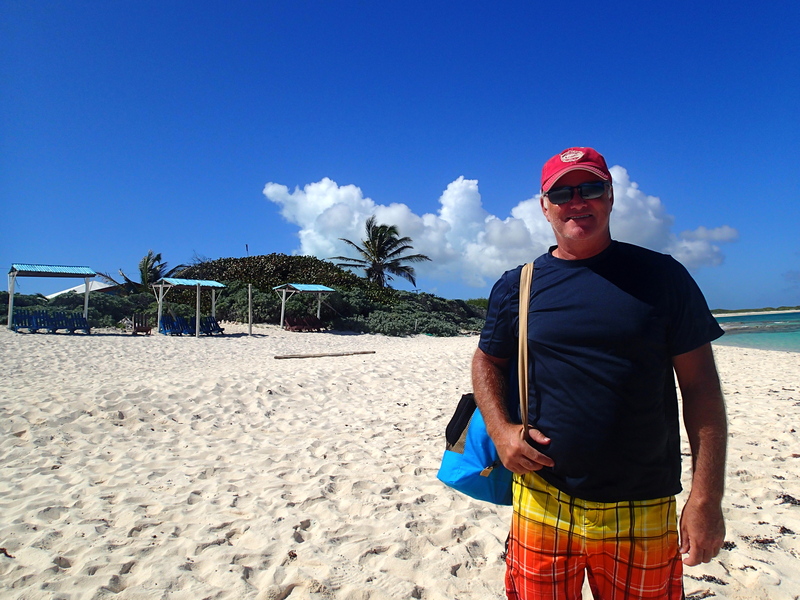 Miles and miles of white sandy beaches. 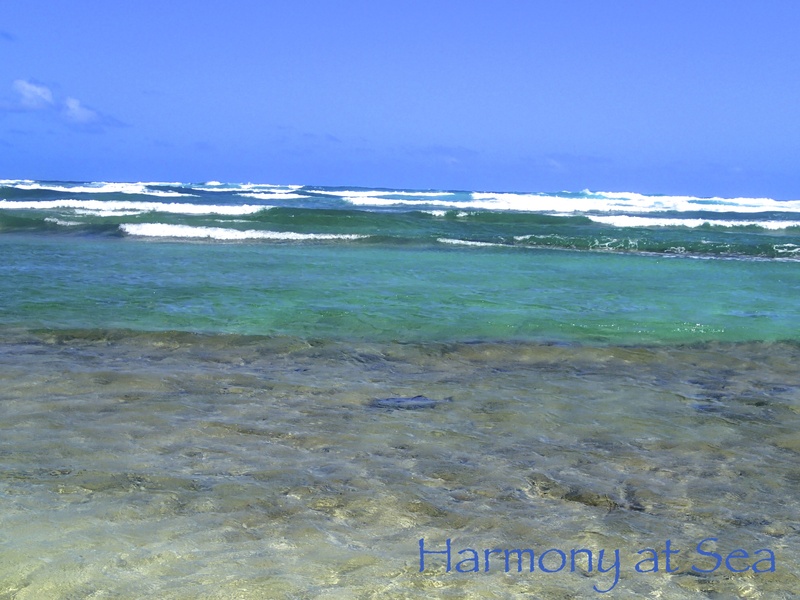 The turquoise color of the water is just beautiful, we loved it. 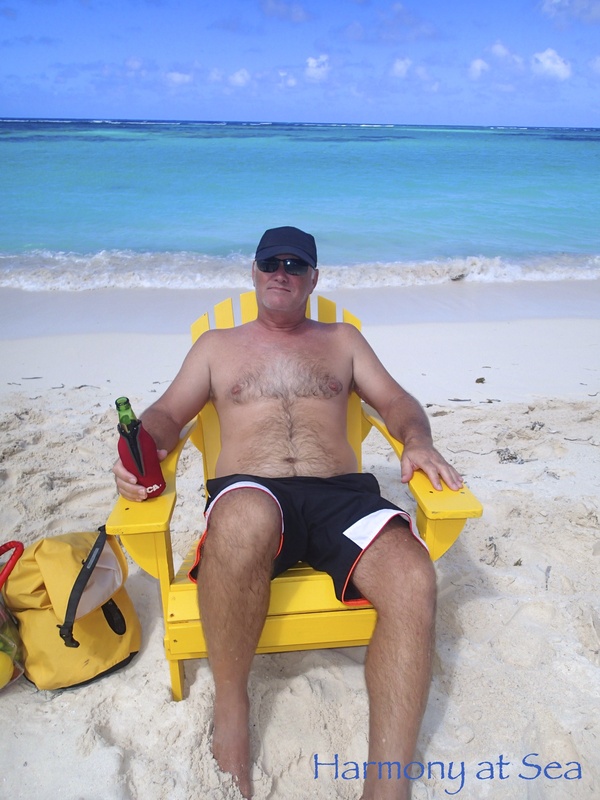 The people of Anegada are so warm and friendly, no pressure, they just treat you very nice. 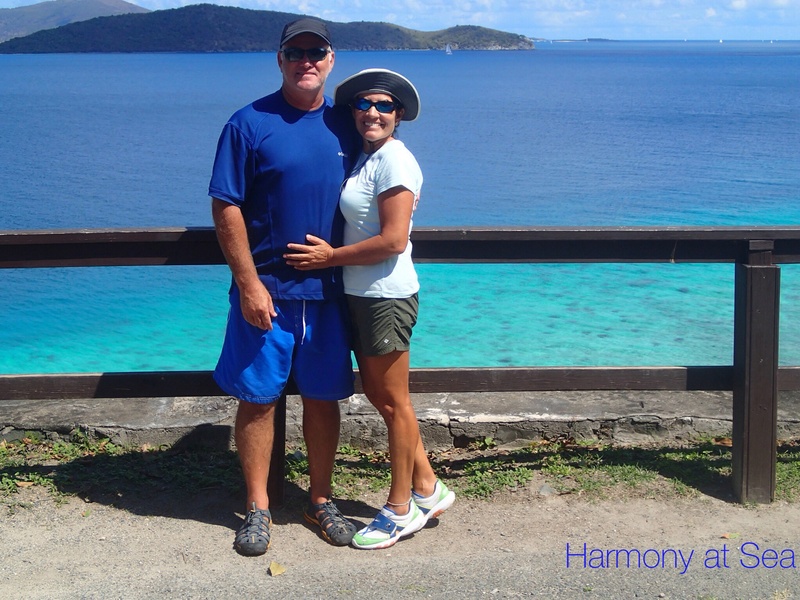 We spent 4 nights there, enjoying the beaches, snorkeling and eating fresh seafood. 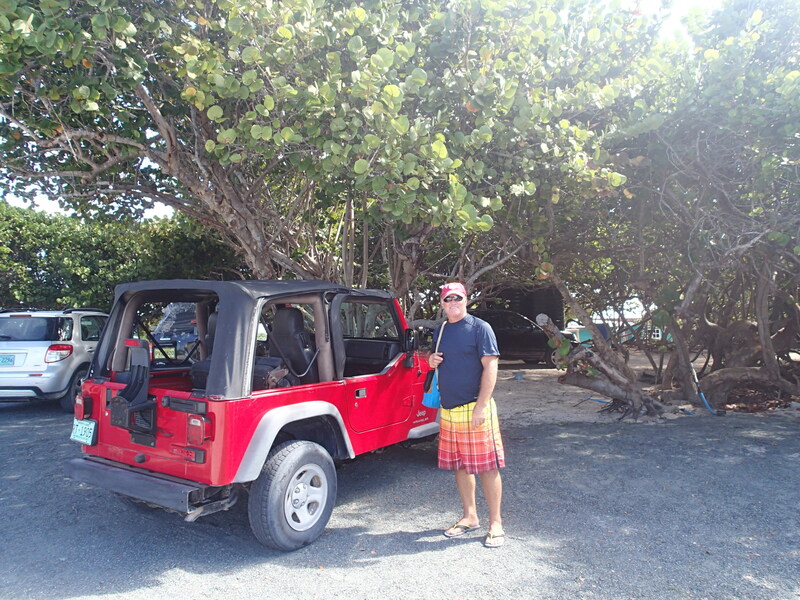 One day we rented a jeep and drove around the island, great way to visit all the great spots like Cow Wreck , Big Bamboo, and Flash of Beauty Beaches. 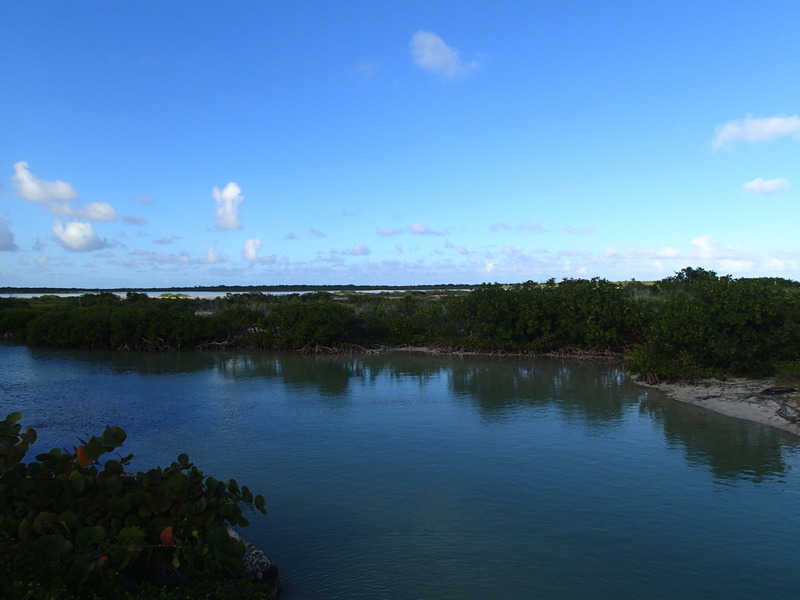 We also drove around the Salt ponds in the center of the island looking for the elusive flamingos, but were only able to see them in the distance. 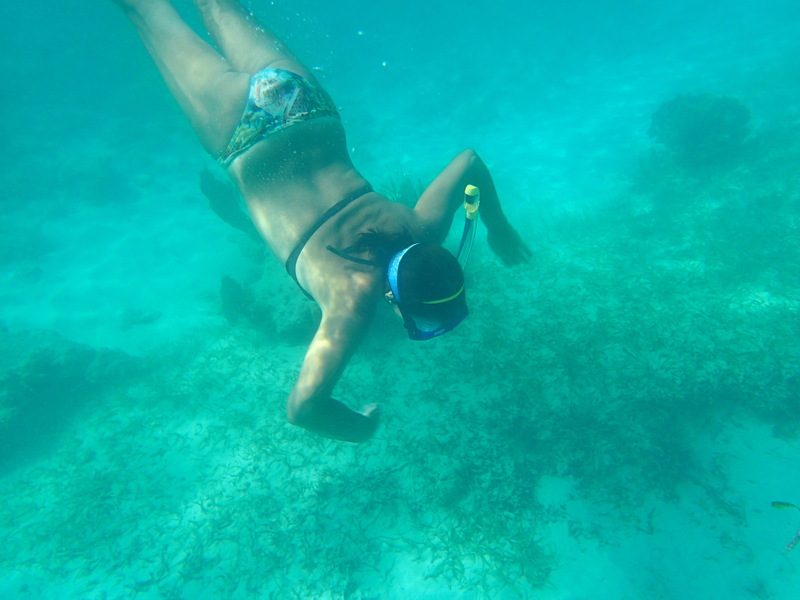 Snorkeling on the reef was amazing, but no luck there either, we didn’t see any big fish or sting rays 😦 We would love to spend more time on Anegada, but unfortunately we had to check out of the BVI on the 26th, our 30 days had run out, so on the 25th we sailed back to Jost Van Dyke. 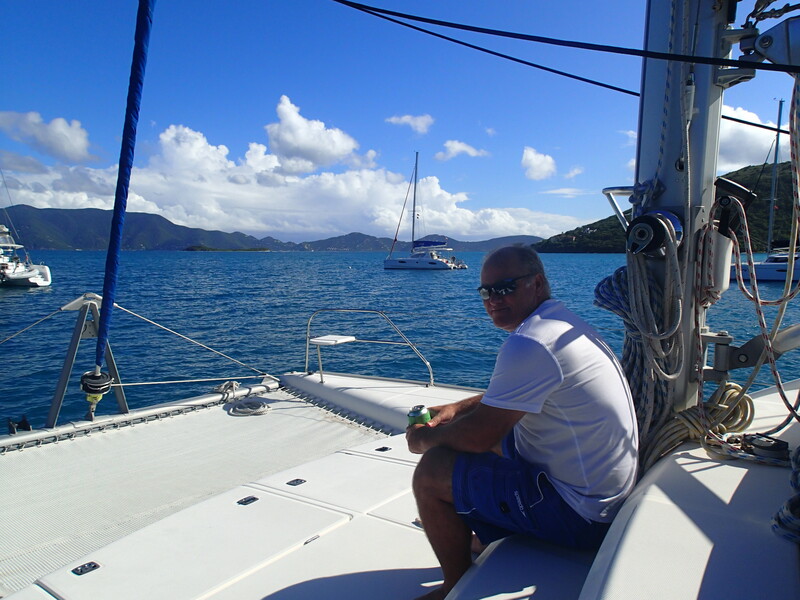 We sailed 31 miles from Anegada to Jost Van Dyke , our longest sail to date. It took us 5 hours to get there. 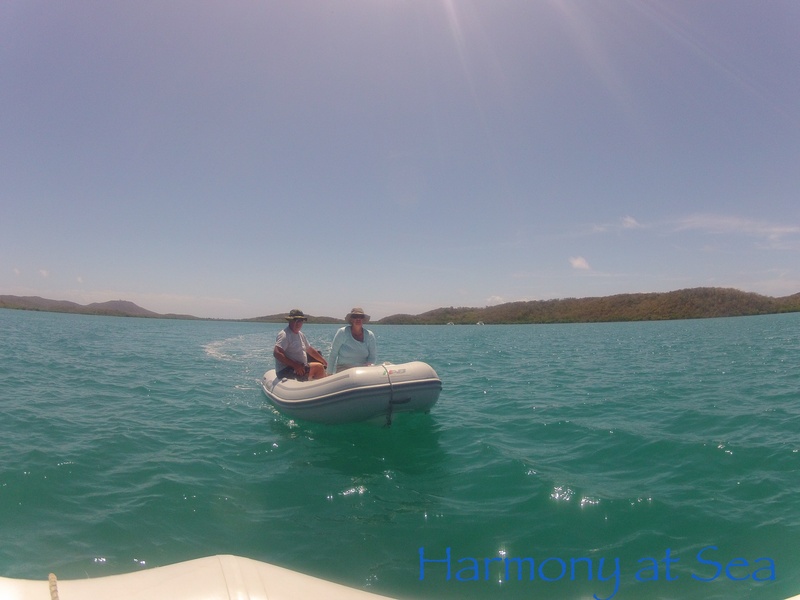 We enjoyed the solitude, no other boats around, we felt so free and happy …. 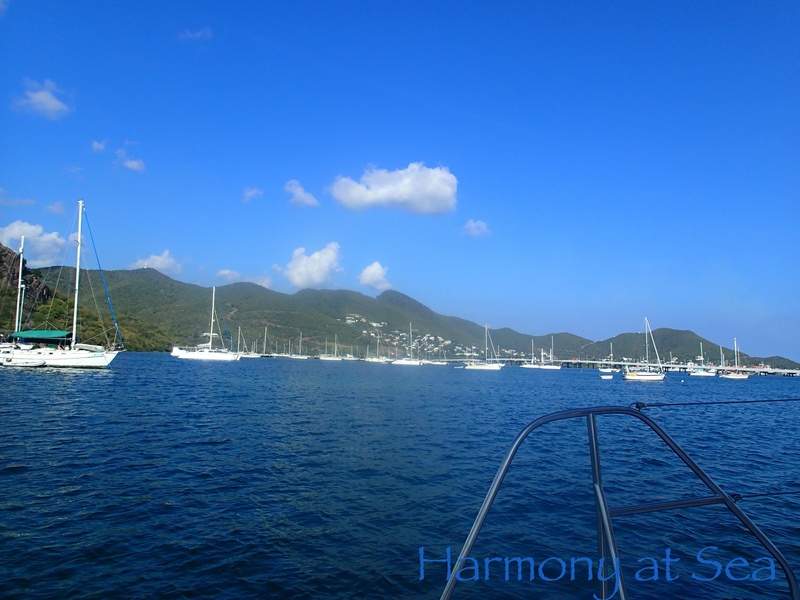 until we arrived at Great Harbor, it was full of boats ha ha. 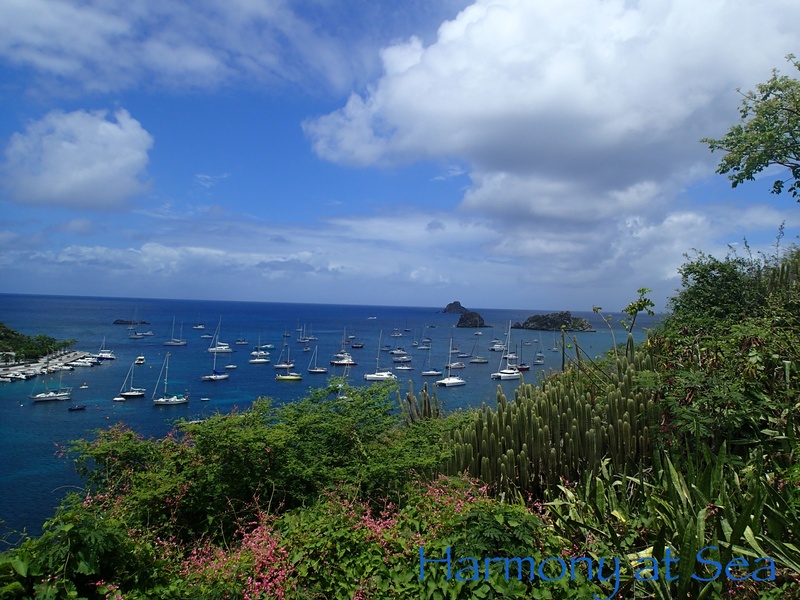 It is high season in the Islands, so most of the harbors are full of boats. 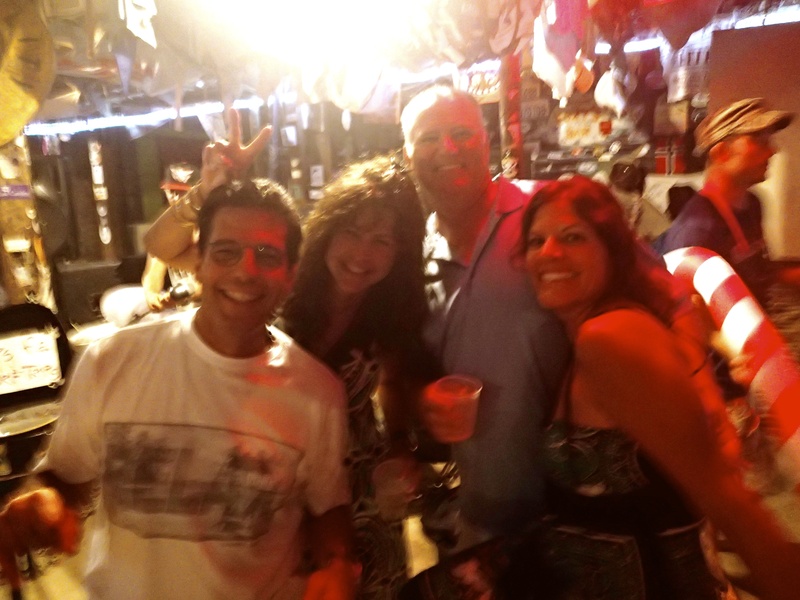 We found our friends Rex & Dixie there, so we had happy hour on their boat, dinner at Corsairs Restaurant and late night dancing at Foxy’s. We had a blast! 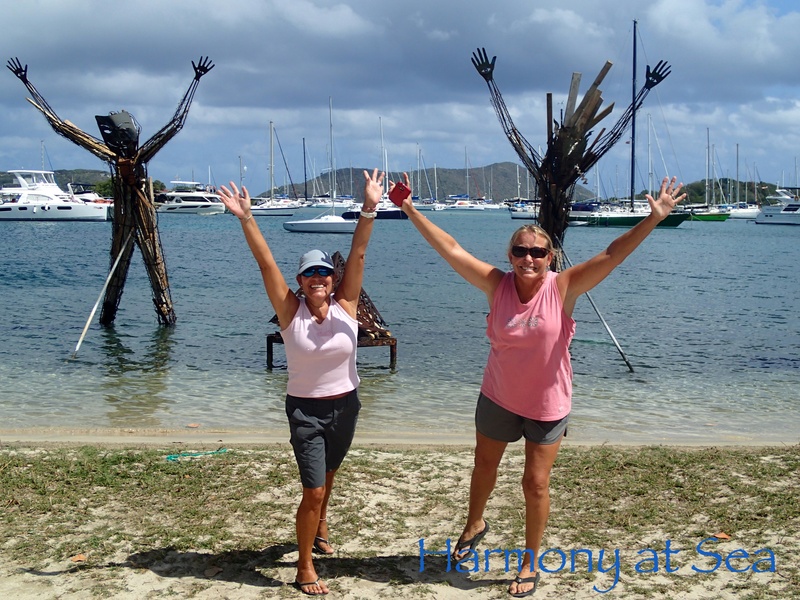 The following day although we were tired from the previous nights dancing we were up early to check out of the BVI and sail to St. John. 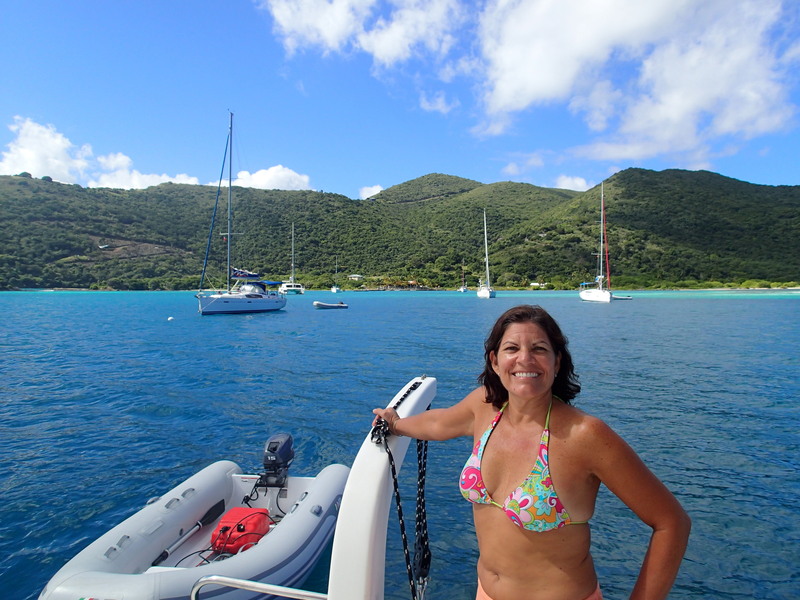 We took a mooring ball at Caneel Bay (also full of boats) and use the dinghy to Cruz Bay to check into the USVI. 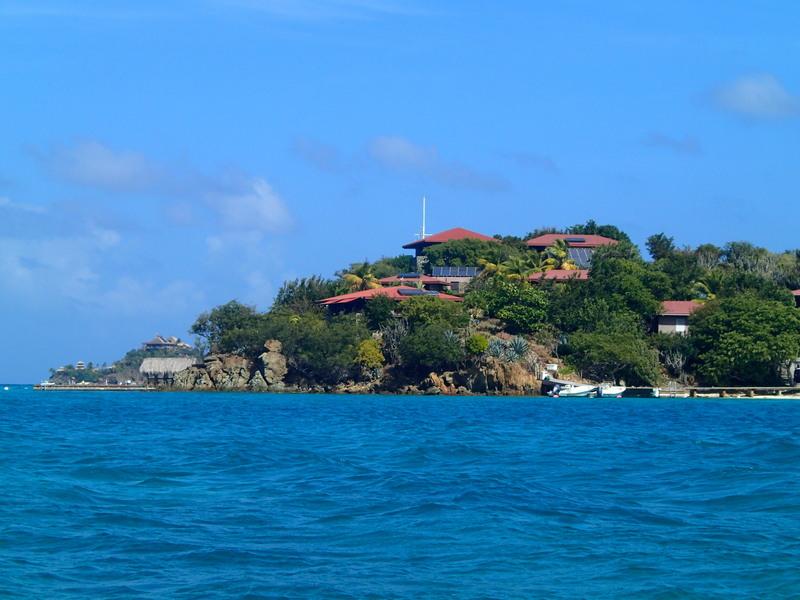 We stayed here one night and we sailed today to Charlie Amalie, St. Thomas to do some shopping. 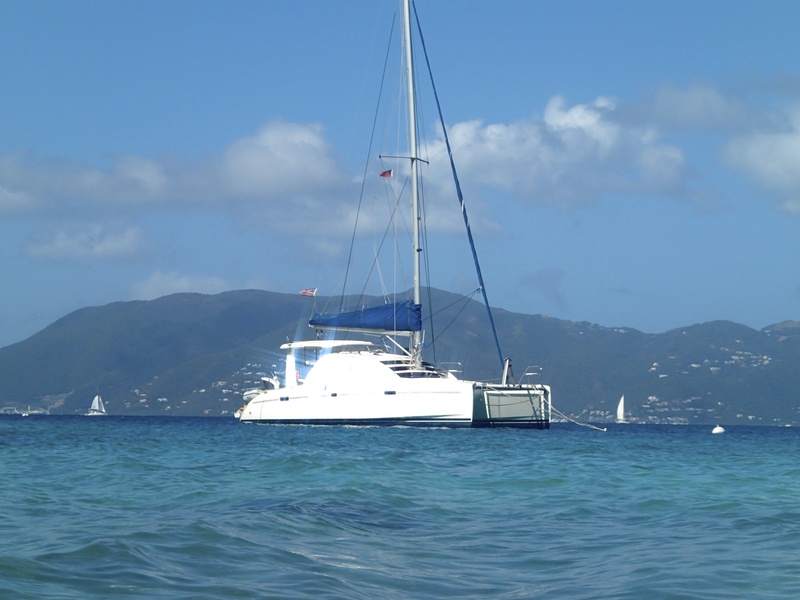 We are planning on staying here at Charlie Amalie for a couples of days and then we will sail around the Island visiting the locations we haven’t seen yet . 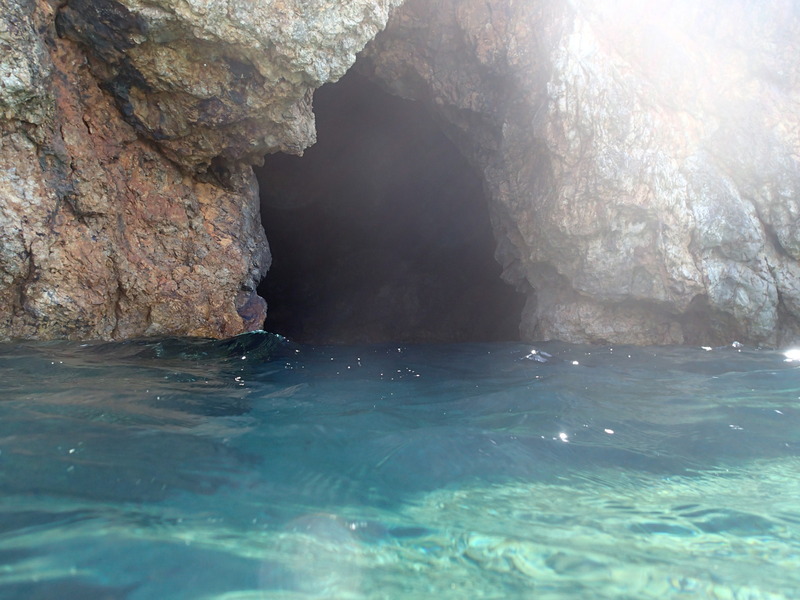 If you click on the photos it will open a much larger version into a new window. Solar Panel installation in progress. 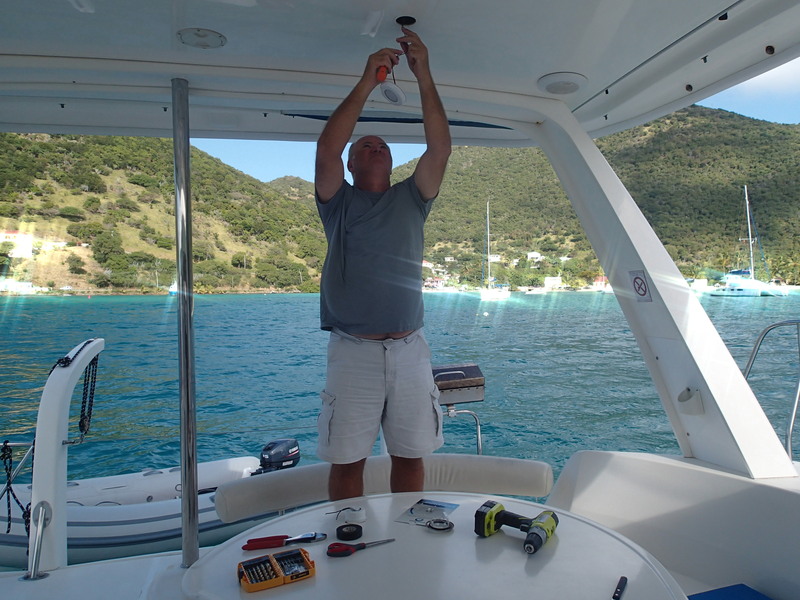 Before leaving Jost Van Dyke, Royce began to install the new LED lights we ordered. 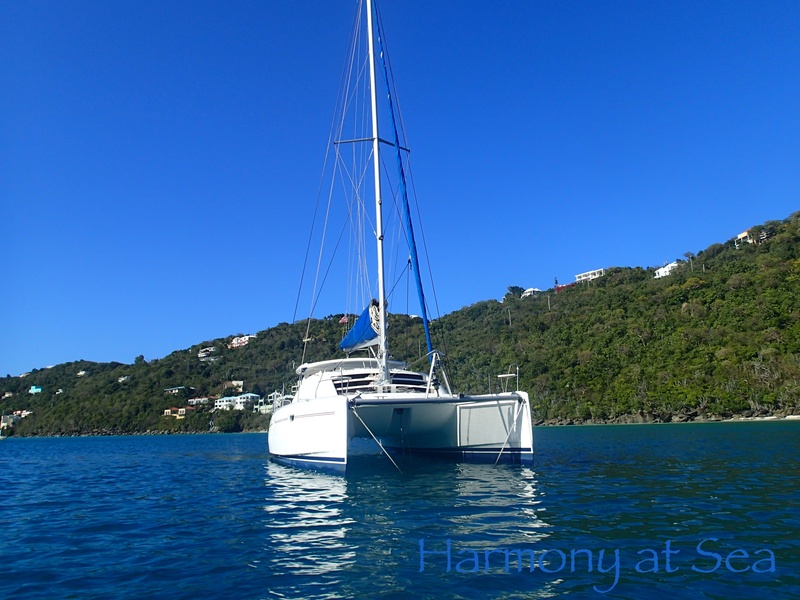 Unfortunately in the middle of the installation he had an issue with one of the wires 😦 We motored to Road Town and anchored outside the breakers to have an electrician onboard to help with the wiring issue. 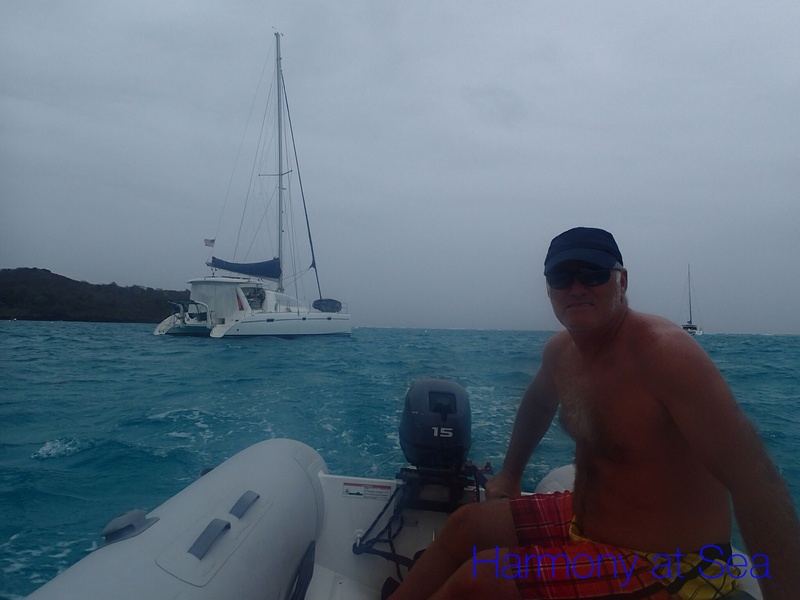 We waited overnight for the electrician, It was really windy and choppy, and not a good night at anchor. 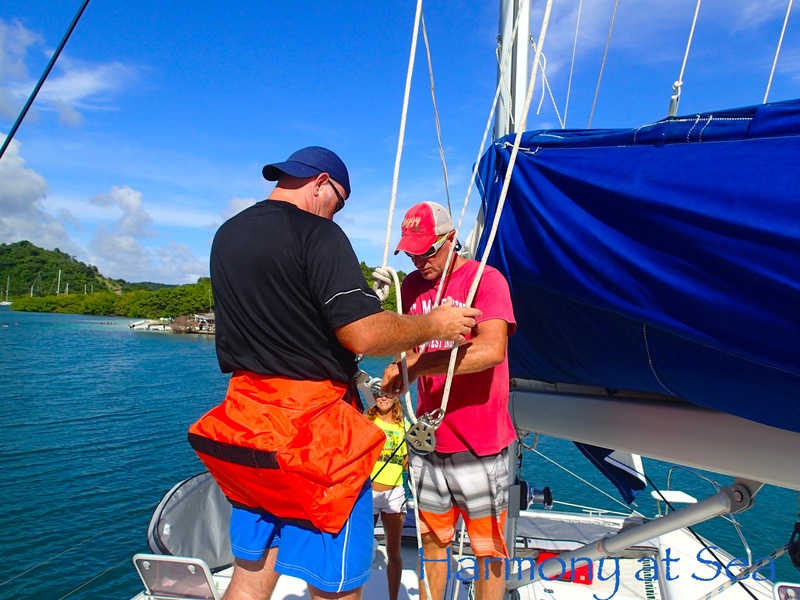 The electrician arrived the next morning and while he and Royce worked on solving the wiring issue I did laundry at Village Cay Marina and counted the minutes to when we could leave that anchorage. The electrician was unable to find the problem so he and Royce ran a new wire. 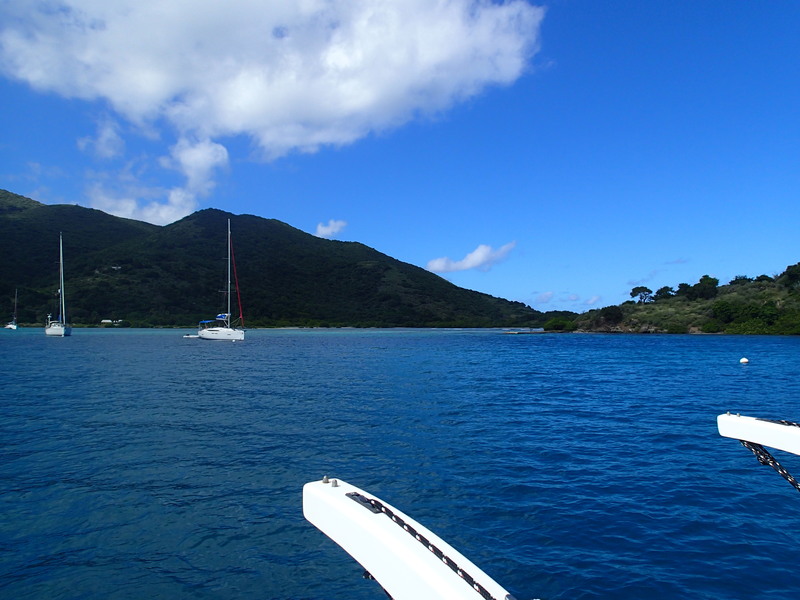 After dropping the electrician at the dock we motored into the wind to Peter Island. 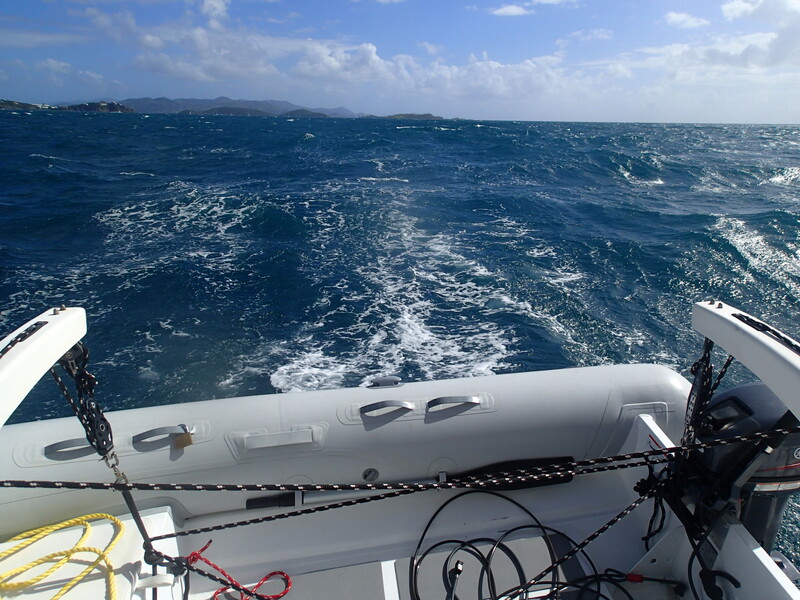 Strong wind gust, 28 knots and very choppy seas, No Bueno.! 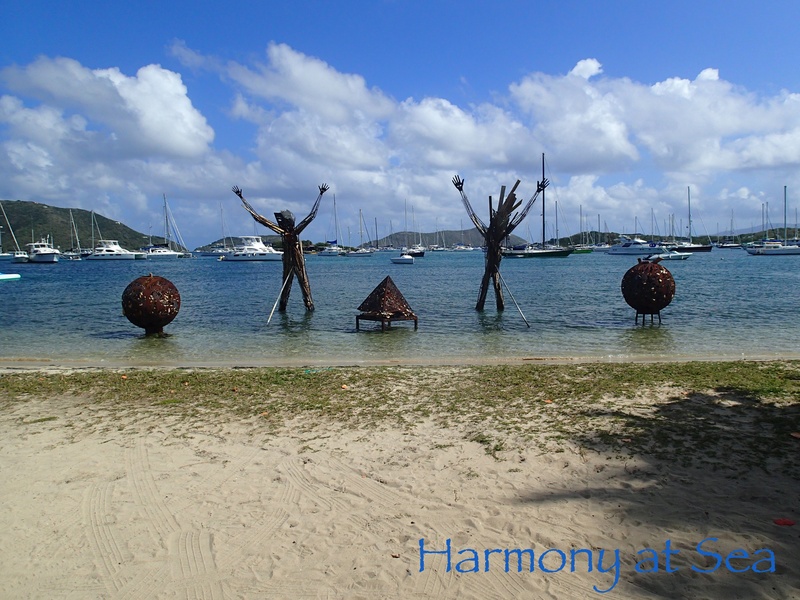 All was forgotten when we arrived at Great Harbor, one of our favorite spots. 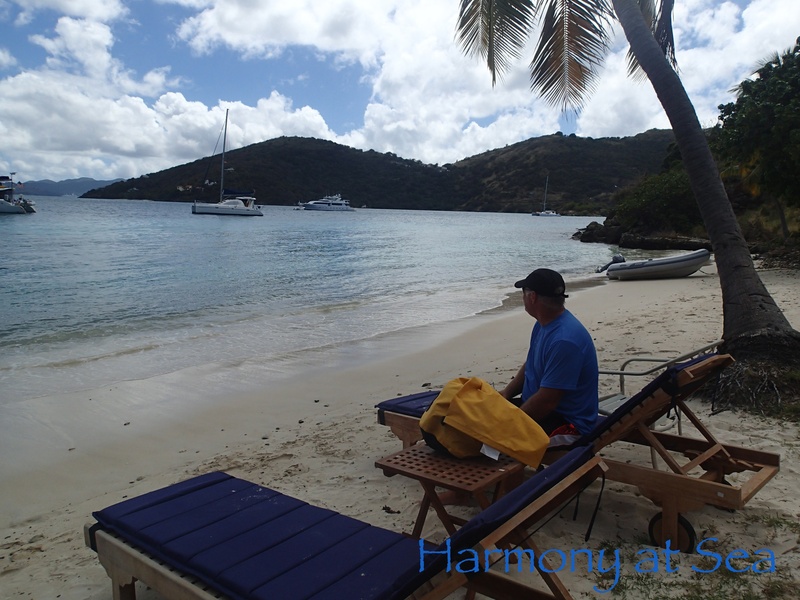 The strong winds and rain remain with us, but the sun works it’s way into the day giving us beautiful moments to enjoy the harbor, swimming & snorkeling. Royce replaced all the interior, and outside salon halogen lights with LED’s. The LED’s are much more energy efficient and look great. 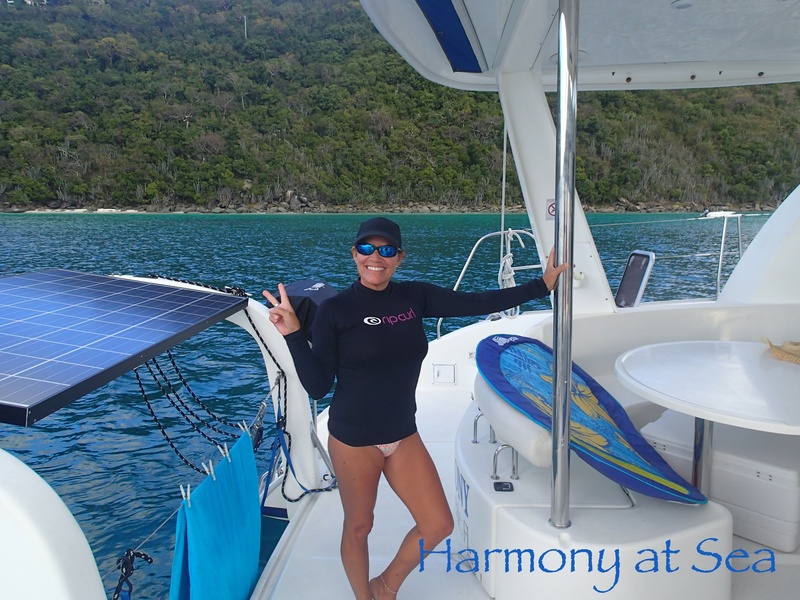 Tomorrow we are heading to Nanny Cay Marina to finish the installation of the solar panels and the inverter charger. All the inside LED lights installed. 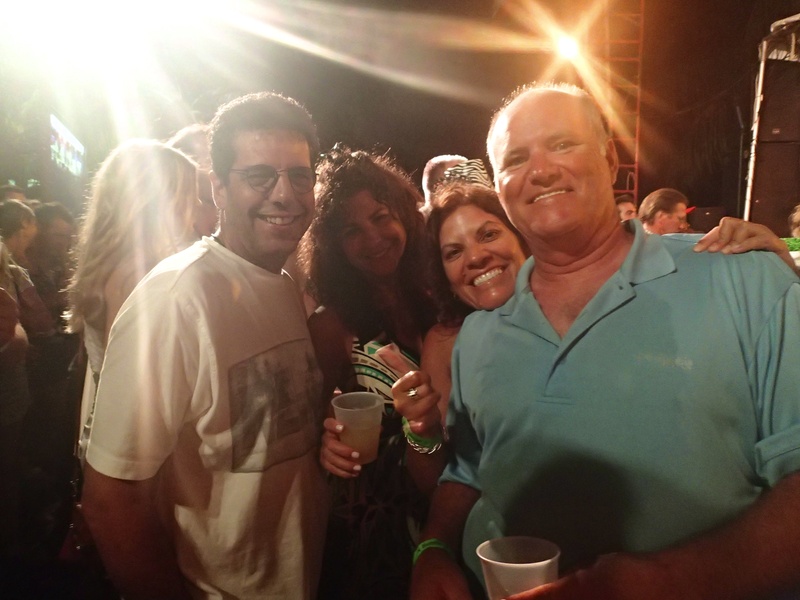 It’s been wonderful welcoming in the New Year with our friends Ceasar & Mary. The weather was great, lots of sunshine and very little rain. 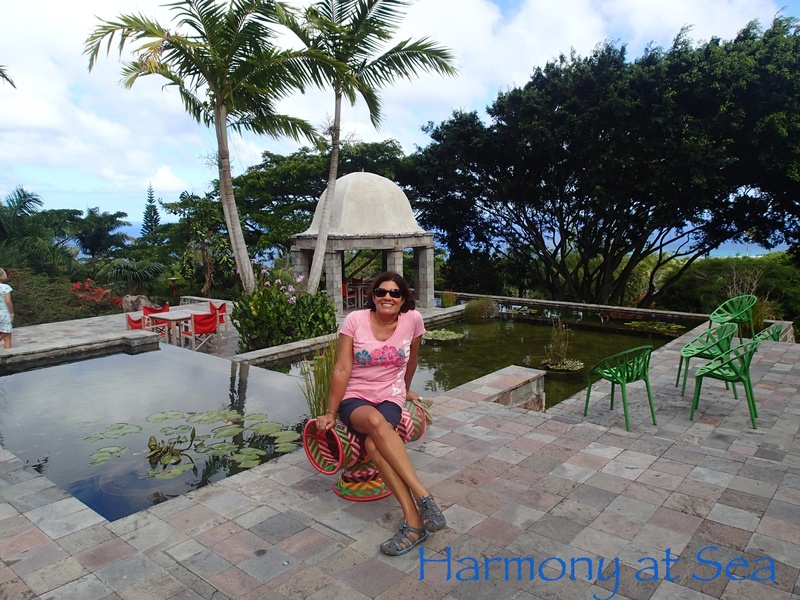 We spent time swimming and enjoying good food and drinks at Foxy’s. New Year’s Eve was awesome! 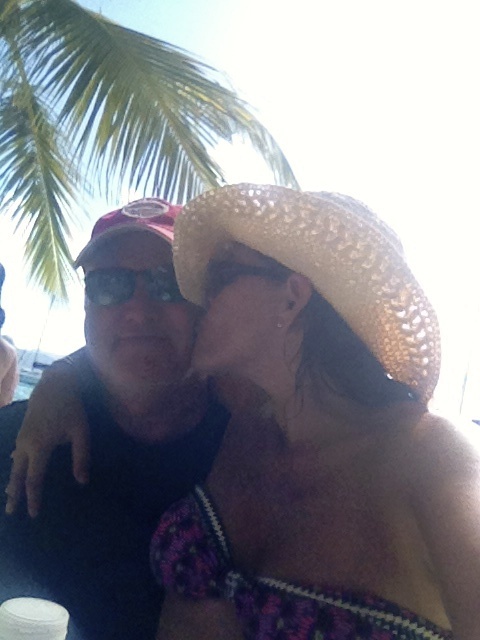 We began with a beach day and Painkillers at the Soggy Dollar bar, White bay, and then BBQ dinner at Foxy’s. We were front row for the Old years concert, and the music was great. 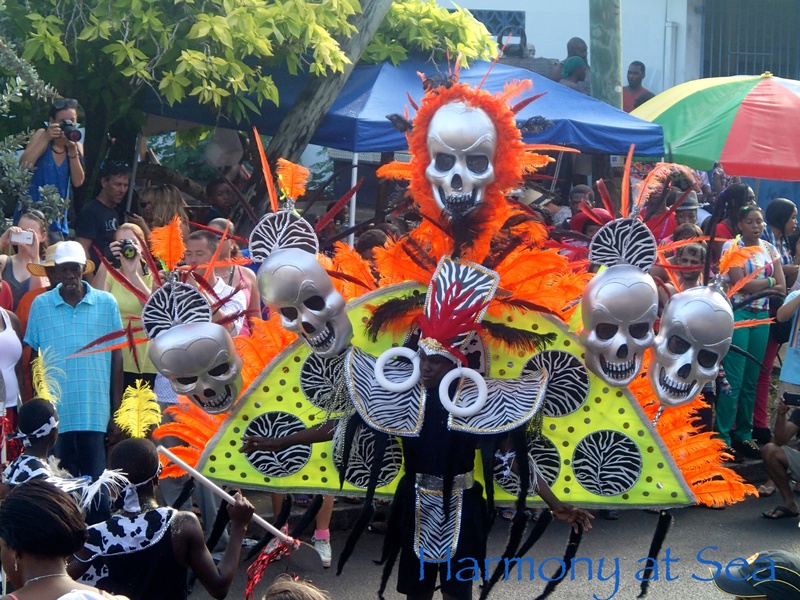 On stage was the Volume International Band, followed by the incredible Bunny Wailer. 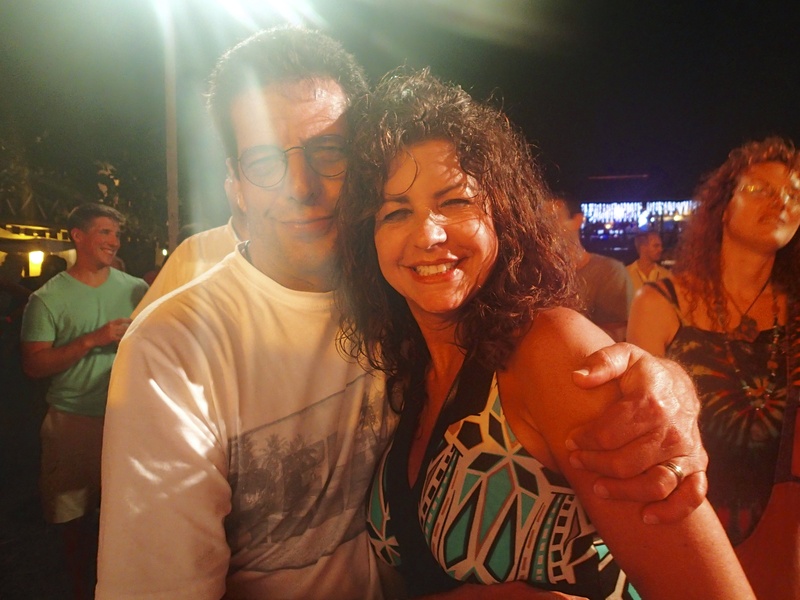 We had a blast and danced our way into 2014. The five day visit with our friends Ceasar & Mary passed too fast. We were sad to see them go 😦 and hope they join us onboard again soon. The guys working in paradise. Success!! One solar panel wired and working. 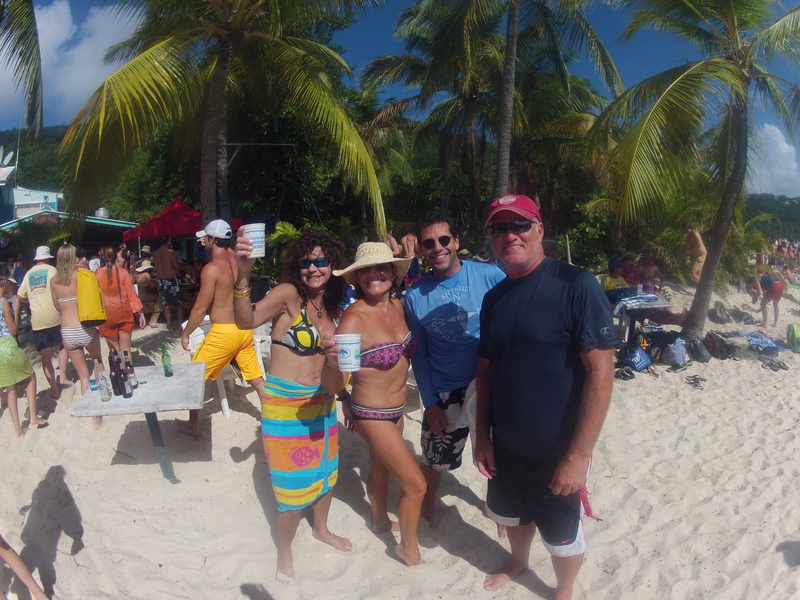 Enjoying a beach day at the Soggy Dollar Bar, White Bay. Lot’s of fun! 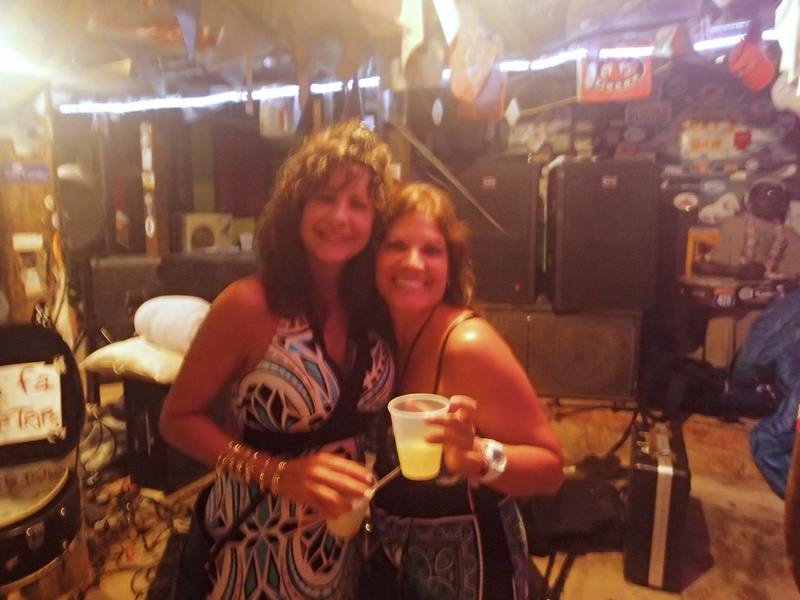 New Year’s Eve at Foxy’s Bar. We had a blast!! 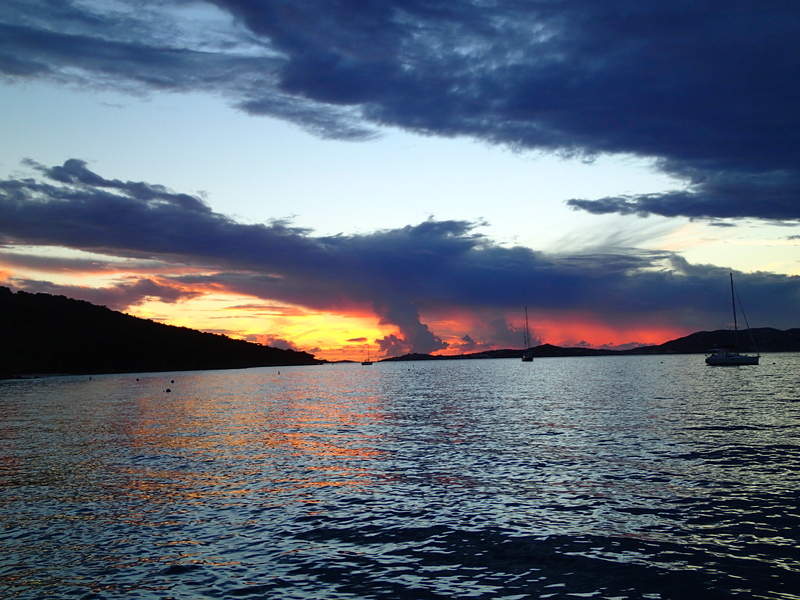 After several rainy days friends on another boat reported seeing a strange orange ball in the sky. 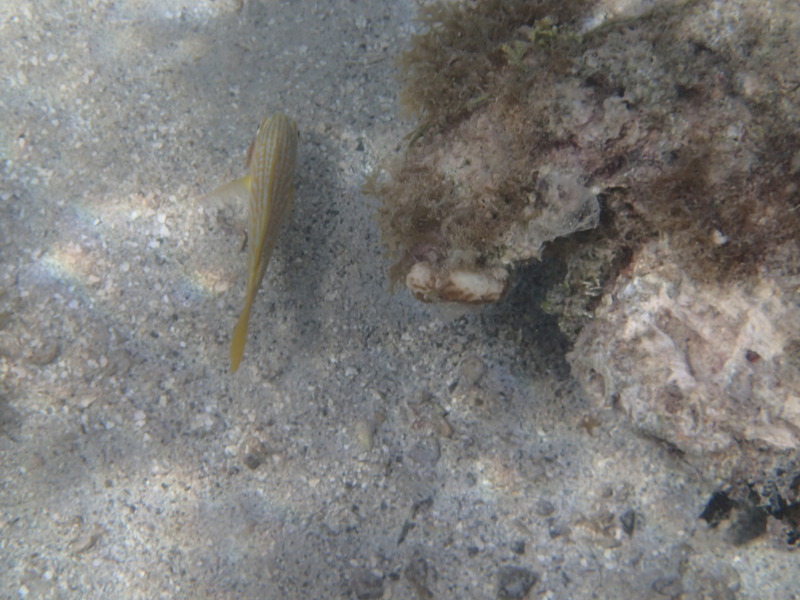 We saw it also and local fisherman confirmed it was the sun. 🙂 Christmas day was beautiful, sunshine and blue skies. 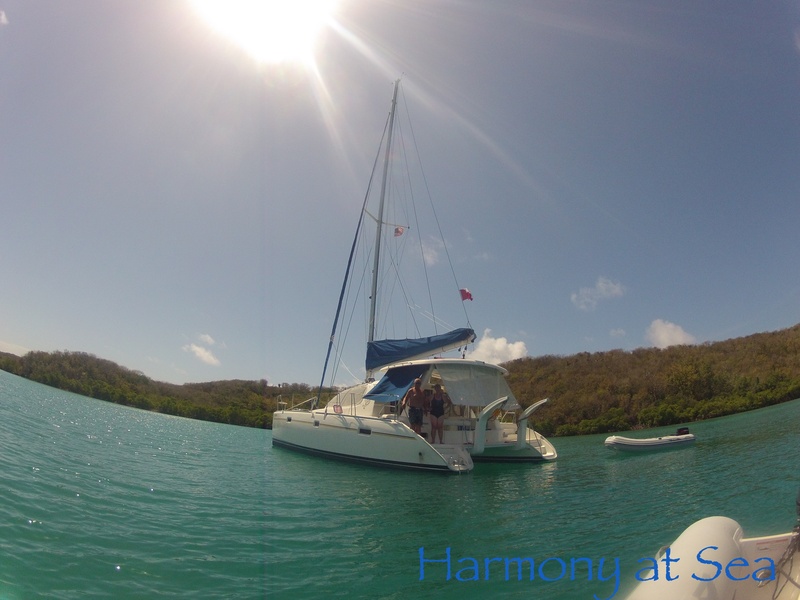 It was a pleasure to find our friends Steve&Candy from s/v Tonic anchored in Caneel Bay. 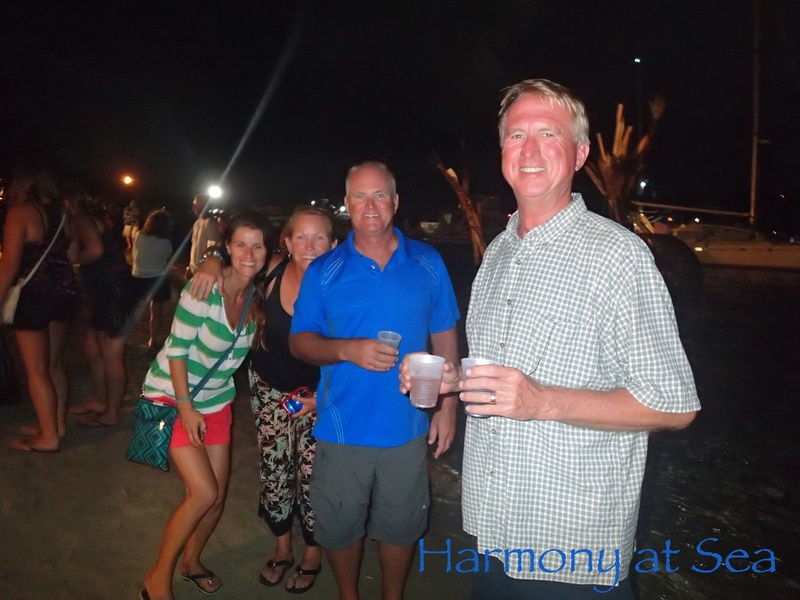 We spent time with them on the beach and happy hour on their boat. It is not easy for us to be away from our families during the Holidays, we miss them a lot. 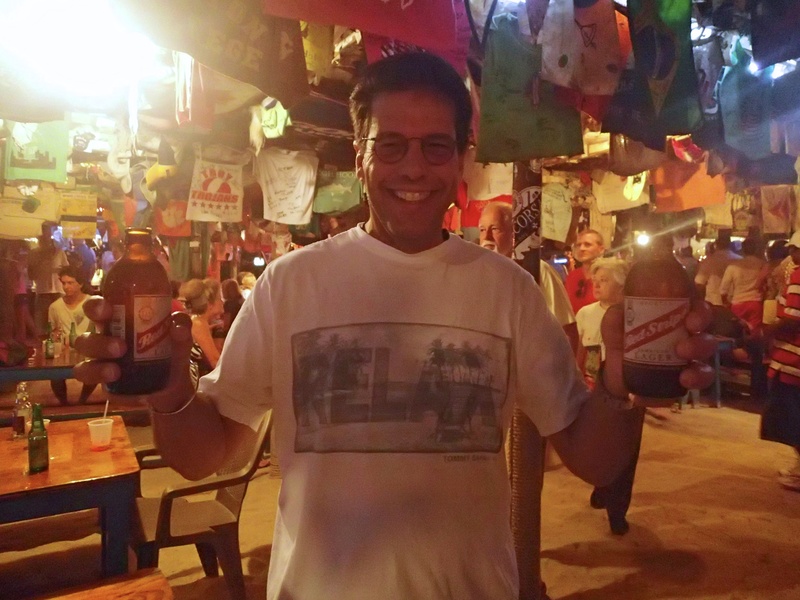 We are fortunate to have phone and wifi service in the islands and were able to speak with them and wish them all a Merry Christmas. 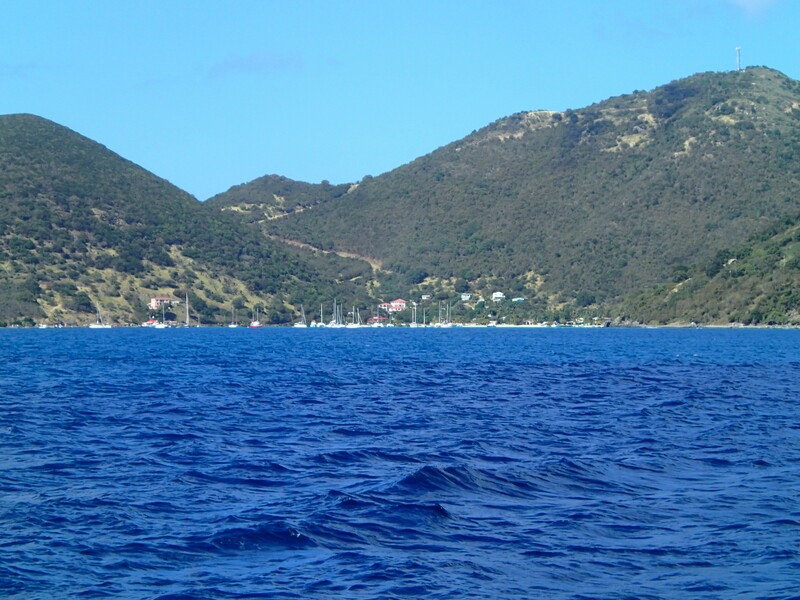 The day after Christmas we motored into the wind to Jost Van Dyke, to secure a mooring ball in Great Harbor. 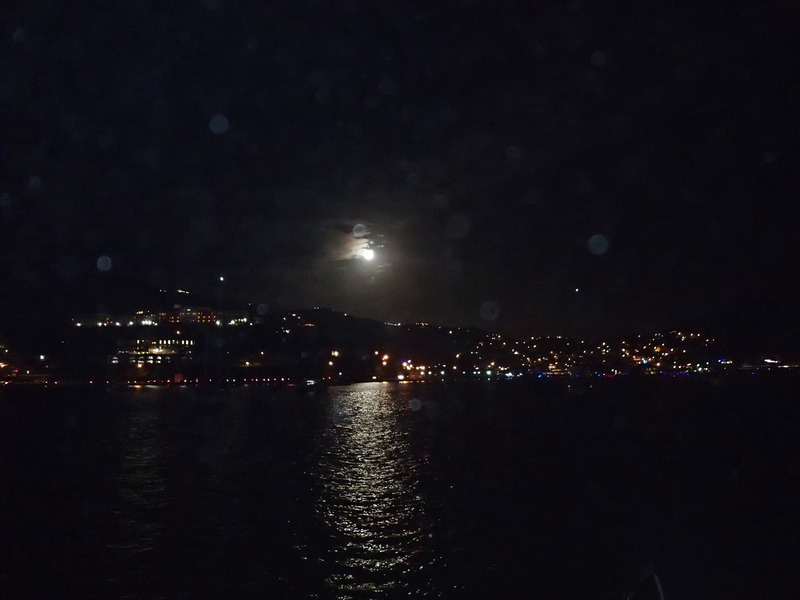 We arrived early as there are approximately 30 mooring balls and past events have seen as many as 500 boats arrive for Old Years Night. Our friends Ceasar and Mary are scheduled to arrive tomorrow. 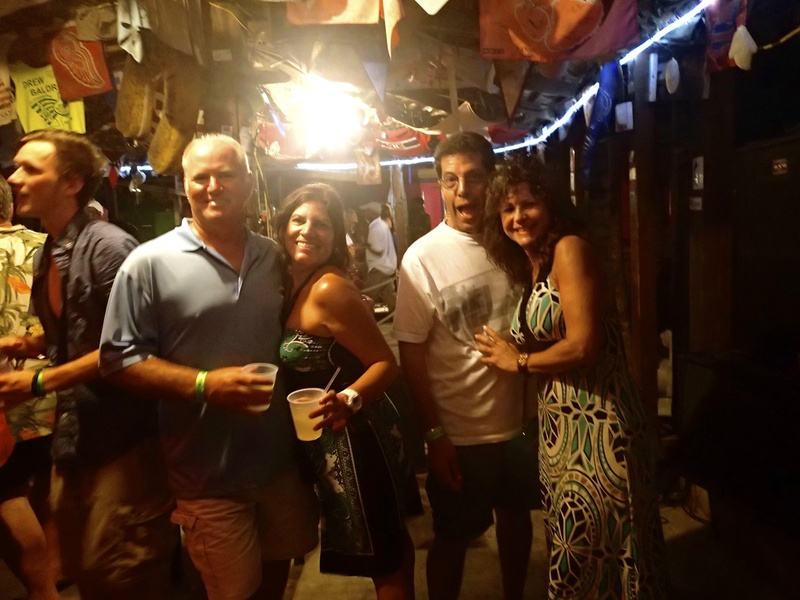 They will be spending New Years with us here at Foxy’s. It will be great having friends on board. Let the party begin!! 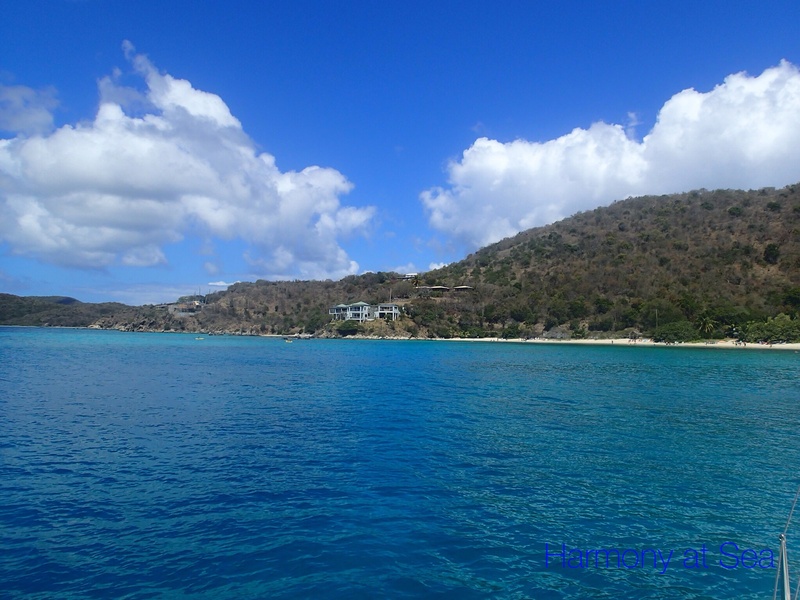 Our stay here in Long Bay, Charlotte Amalie has been longer than expected, but necessary.We are waiting for the Solar Panels that have been delayed until next week. 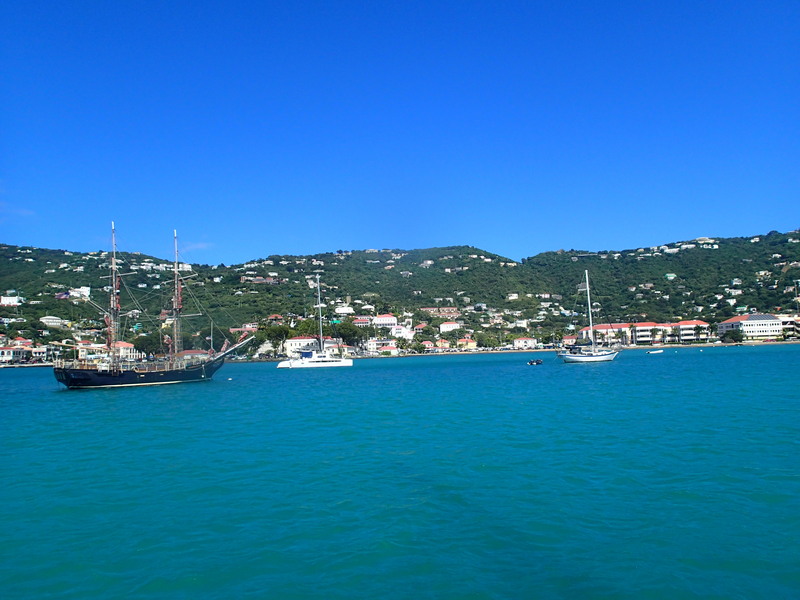 Charlotte Amalie is the big city of St Thomas, lots of traffic and very noisy, making our stay a little uncomfortable. 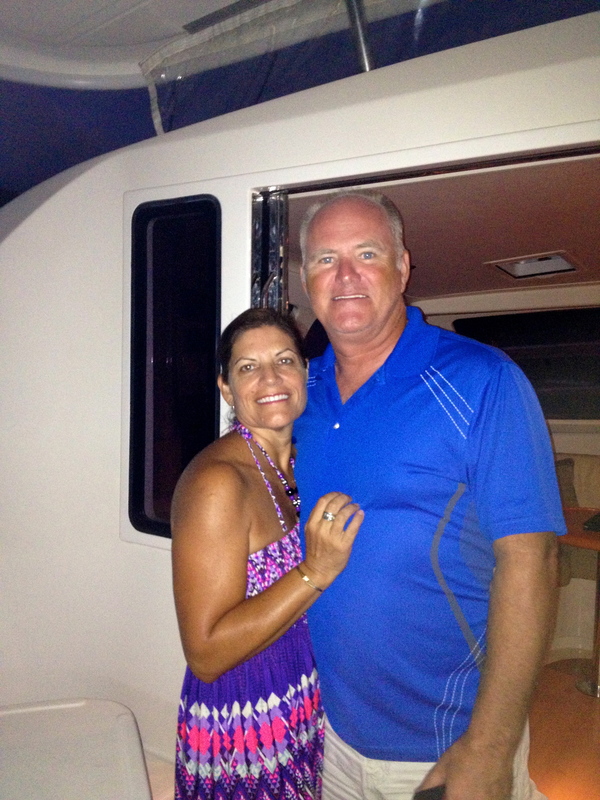 We had dinner onboard Wonderland with our friends Rex and Dixie. 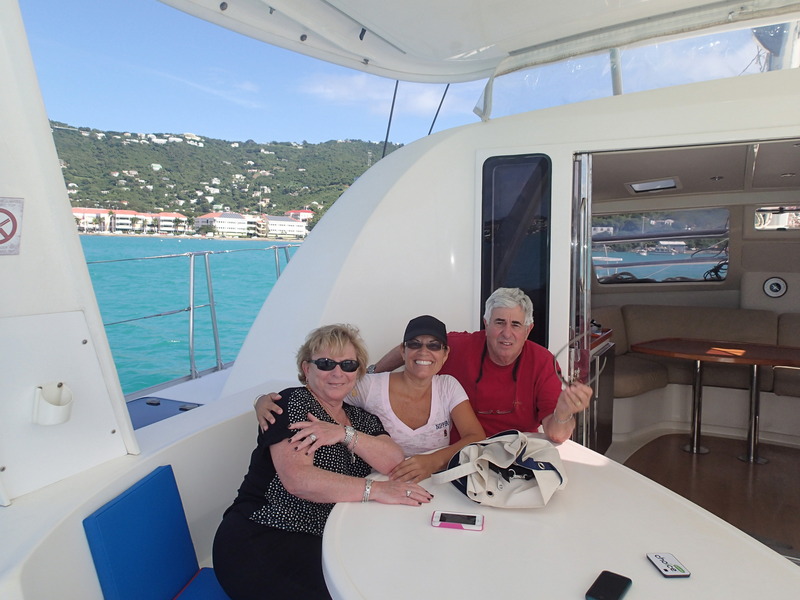 We finally met Mike and Rebecca the couple whose blog “Zero to Cruising” we have been following for over two years. 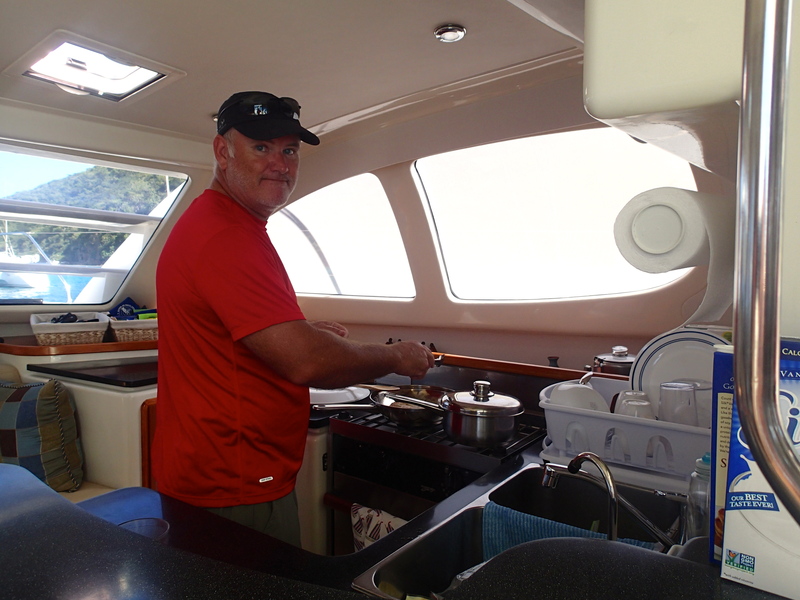 They started with no experience and are now captain and chef on the beautiful Leopard 46 charter cat “One Love”. 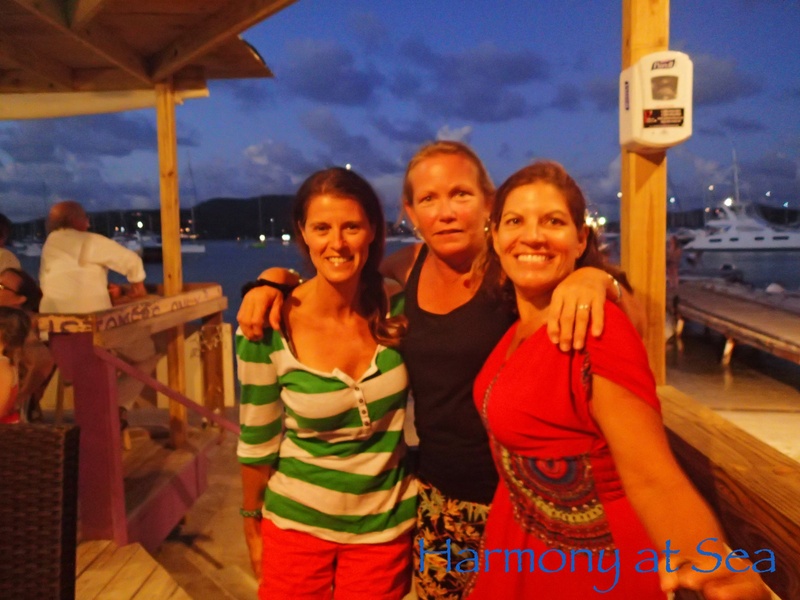 We had dinner aboard “One Love” and recommend the crew and boat to anyone interested in chartering in the USVI or BVI. 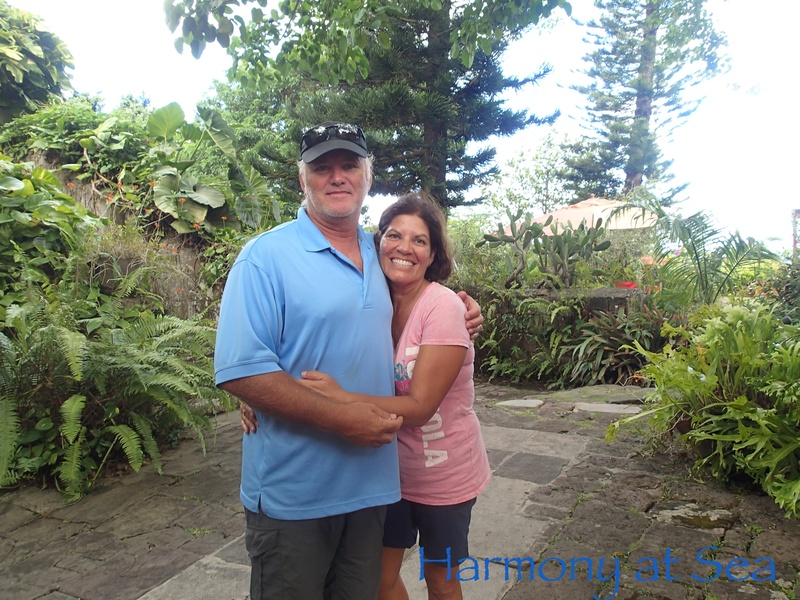 Our friends from Miami, Marcy & Jerry, came to visit us onboard Harmony. They arrived via the NCL cruise ship EPIC. 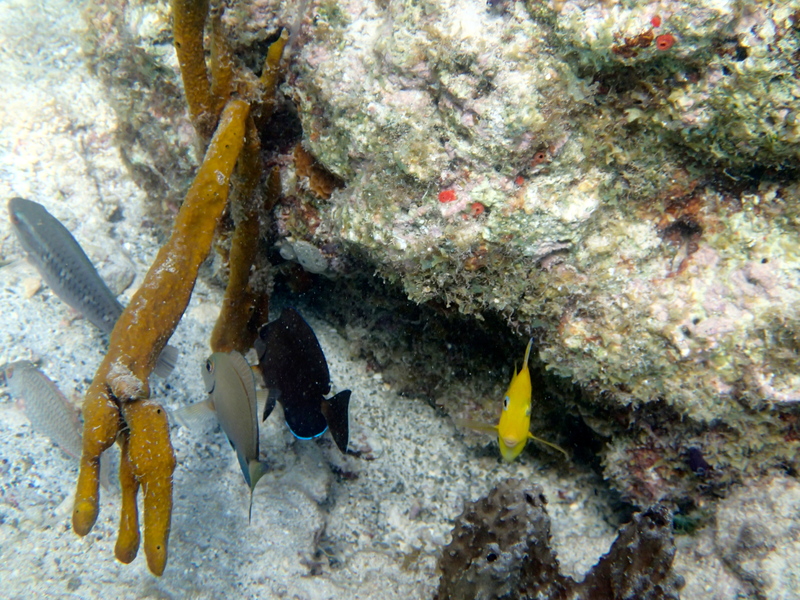 We picked them up from the cruise dock in our dinghy and brought them to the boat. It was a short visit but nice to have friends onboard. Thank you for lunch guys!! We will stay here until the solar panels arrive. It will be much easier getting them to the boat in a Marina than at anchor. With Dixie, having dinner on their Boat Wonderland. The Christmas Parade. We watched it from our boat. 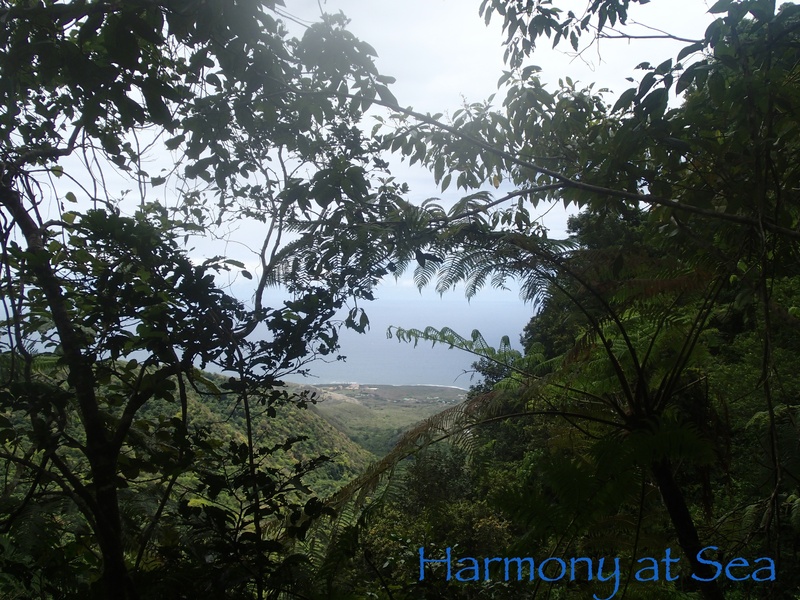 We have been experiencing a lot of bad weather these days, rain and strong winds. The strong “Christmas winds” are normal for this time of year. 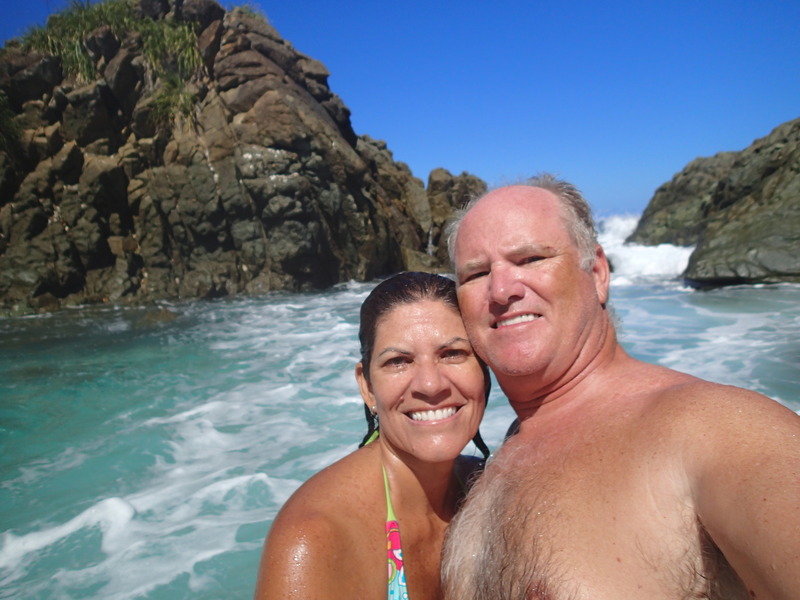 Fortunately the sun comes out between the rain showers and we jump in the water and enjoy most of the day. 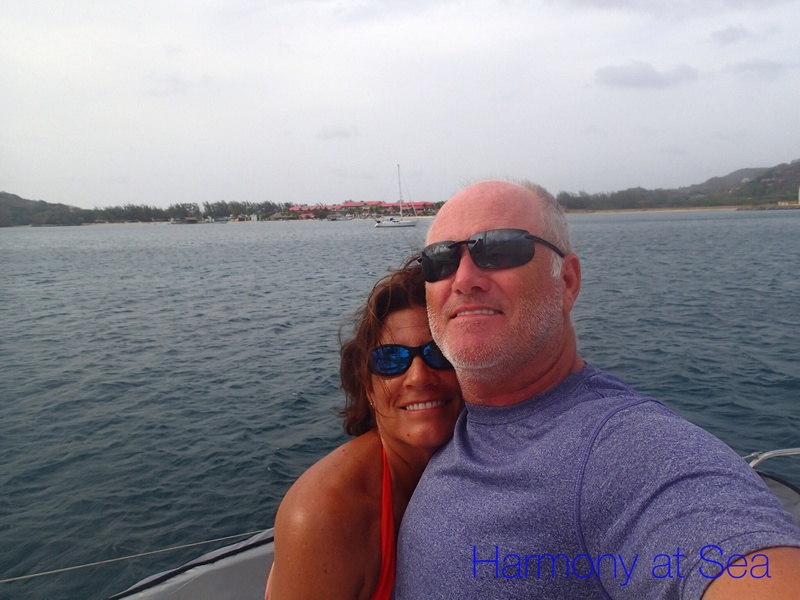 We motored into the wind from Nanny Cay to Great Harbor, Peter Island to relax for a few days. We marked the chain so I know how much chain I am putting down and I am able to give Royce an accurate number for the amount of scope we have out. 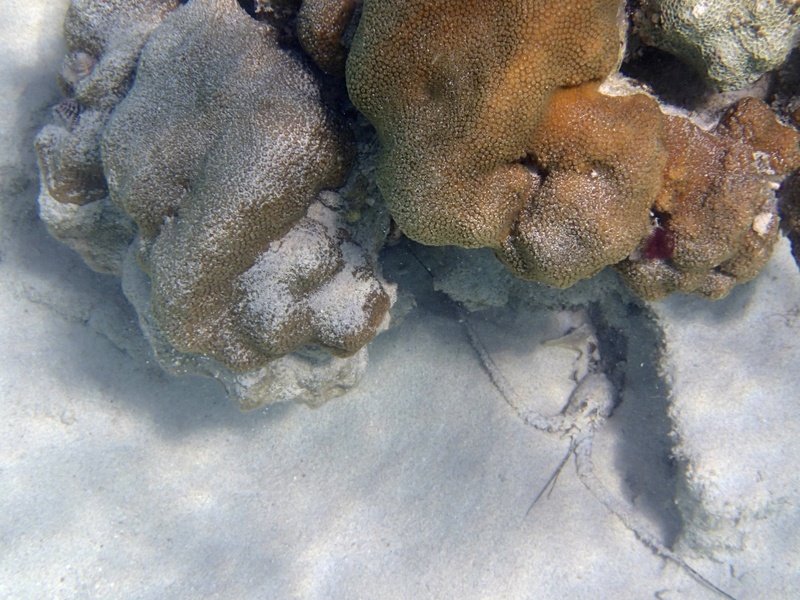 It has made a huge difference in setting the anchor. 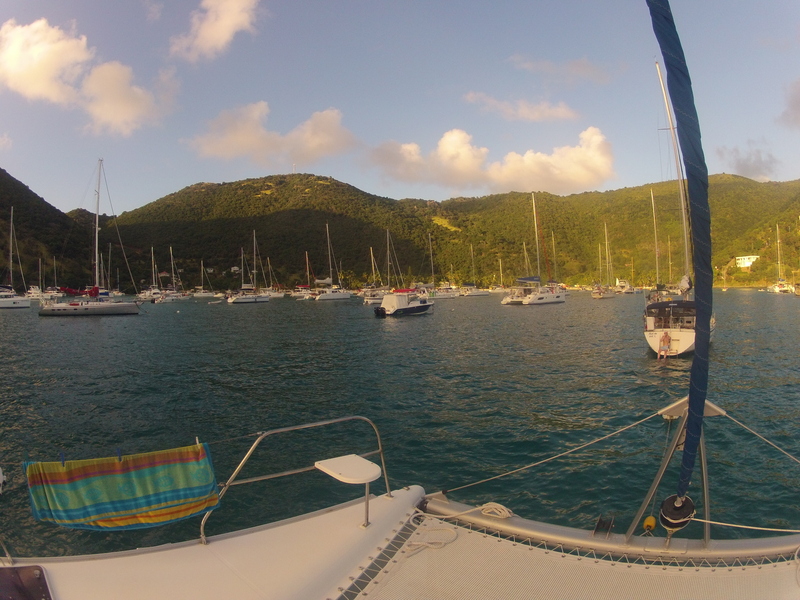 It is so nice to spend days anchored without having to pay for mooring balls. 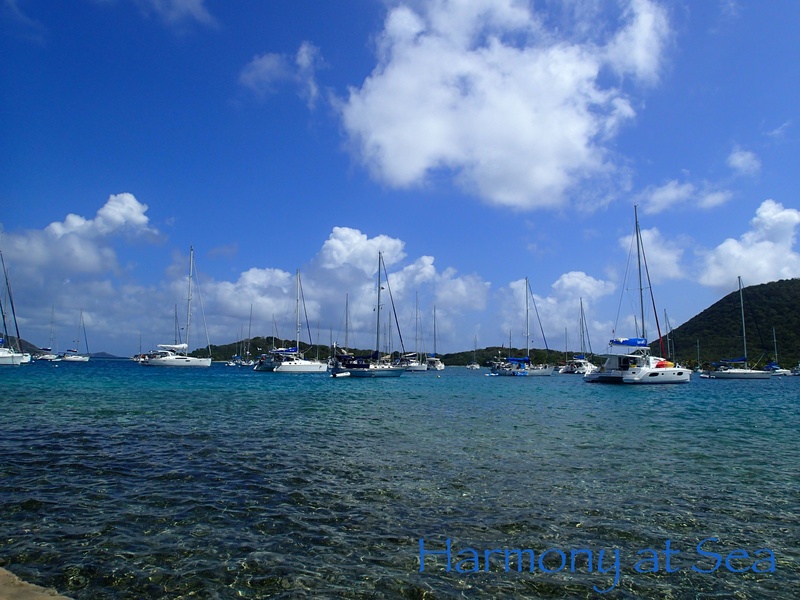 Most of the harbors in the BVI are full of mooring balls, making anchoring a difficult task, little space and lots of boats. 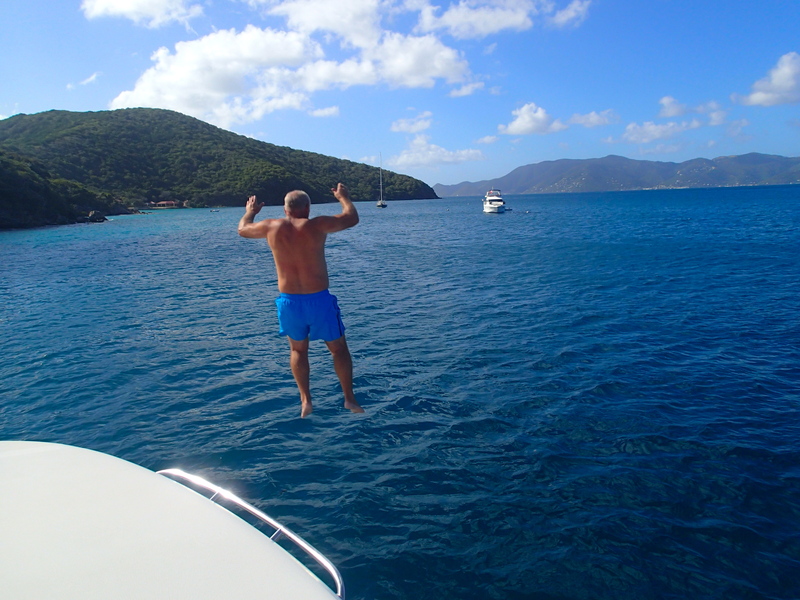 We are only allowed to remain in the BVI for 30 days at a time so we sailed to Soper’s Hole to check out of the BVI and head to the USVI. 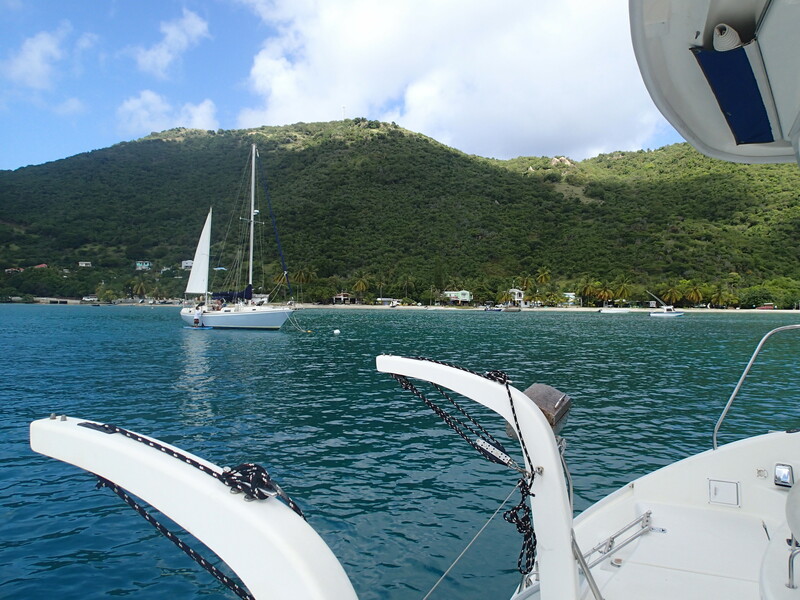 We will be spending our time between the US and BVI for now. 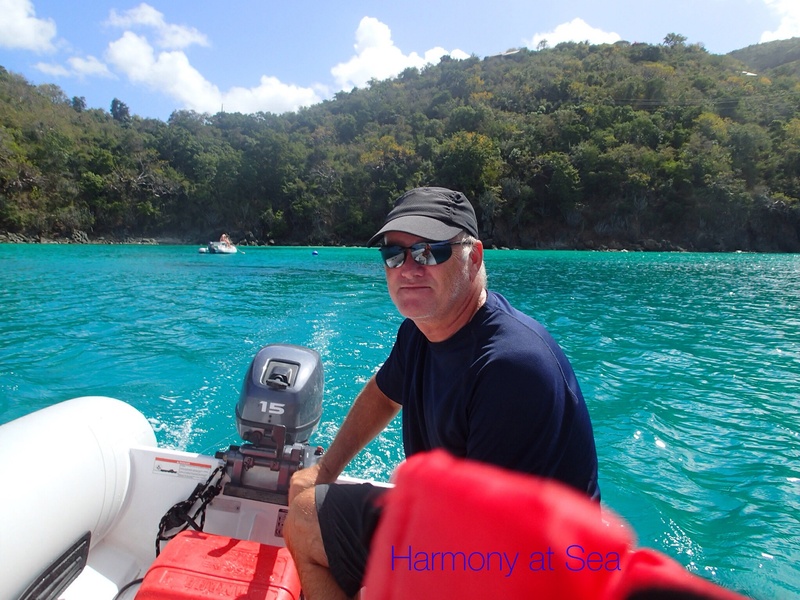 After clearing customs at Soper’s hole we sailed to St. John and took the dinghy to Cruz Bay to clear customs and do some grocery shopping. 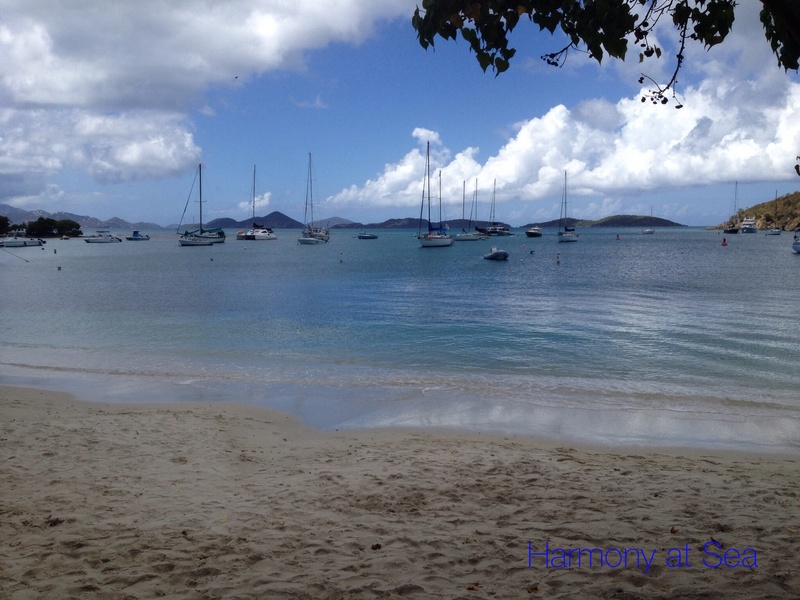 We took a mooring ball in Caneel Bay and the view of the beach is beautiful. 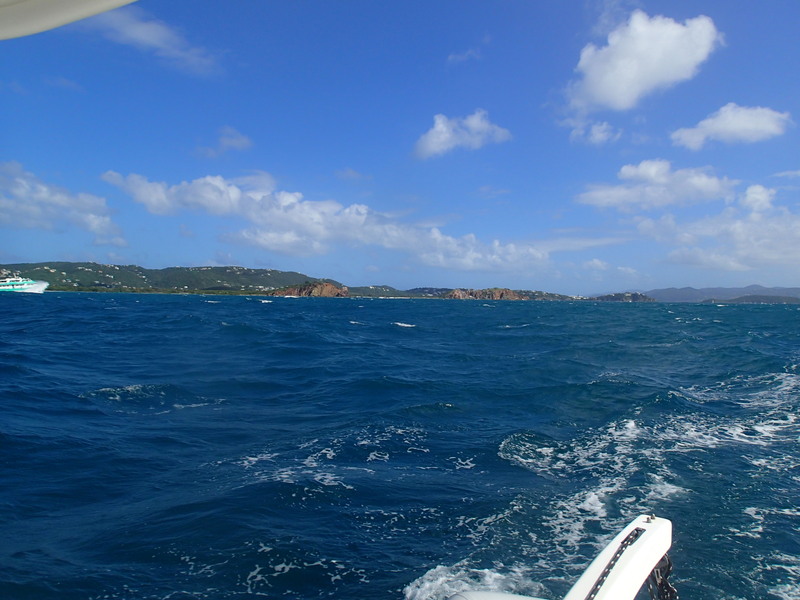 Caneel Bay is very choppy with the wake from the fast ferries. 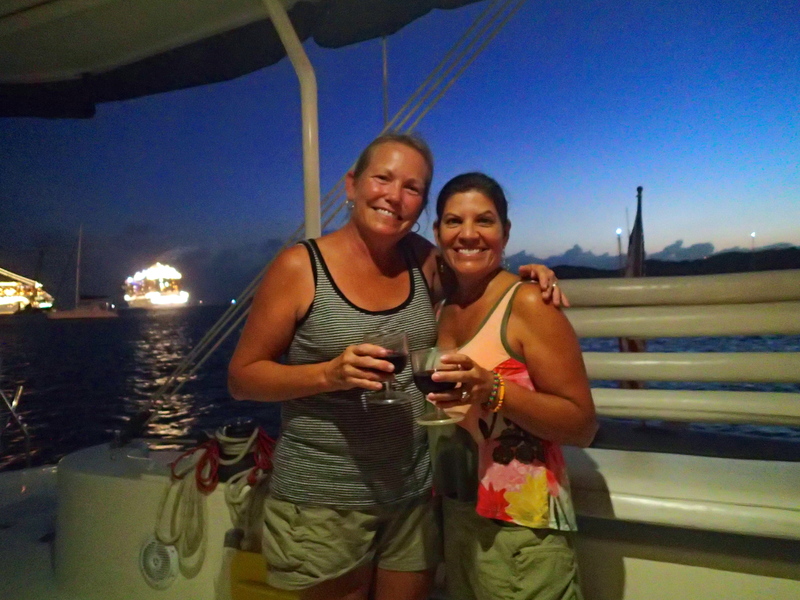 We had our first experience meeting other cruisers and decided to stay for the weekend. 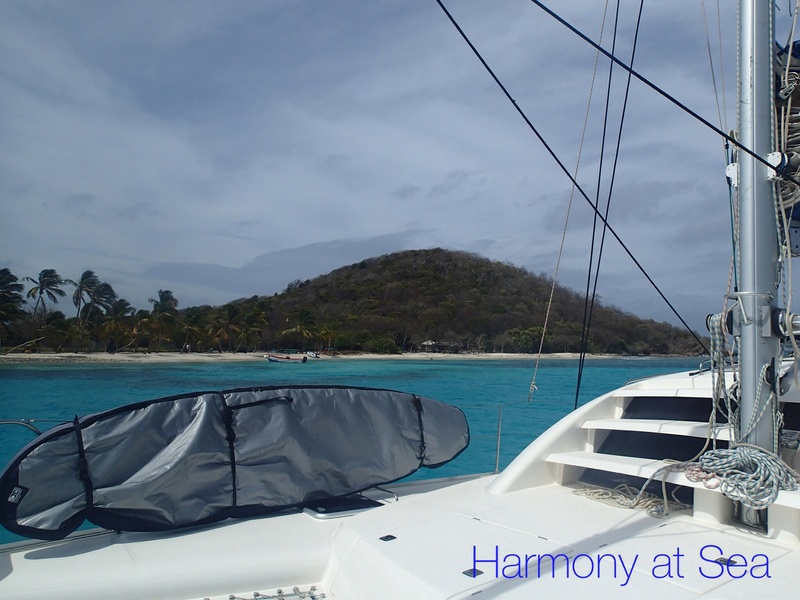 We have all taken turns hosting happy hour on our boats. 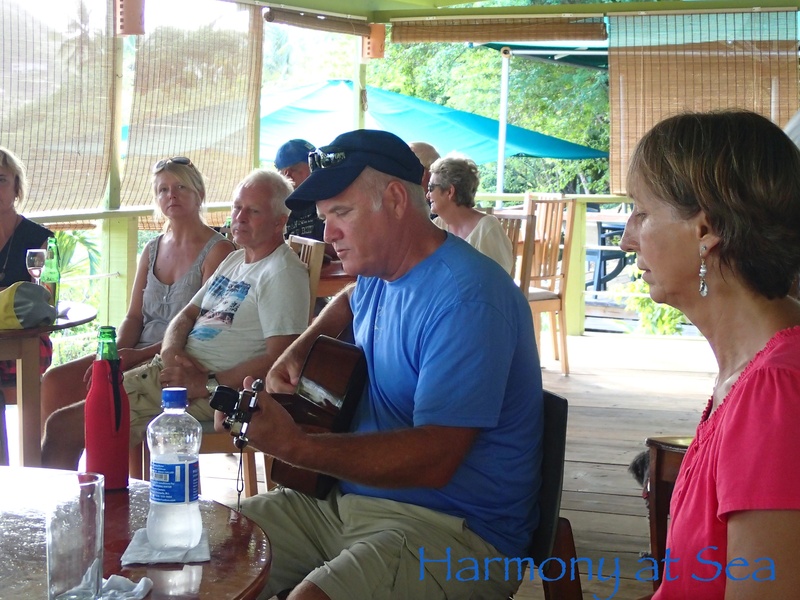 We feel like we have made new friends and have really enjoyed spending time with them. 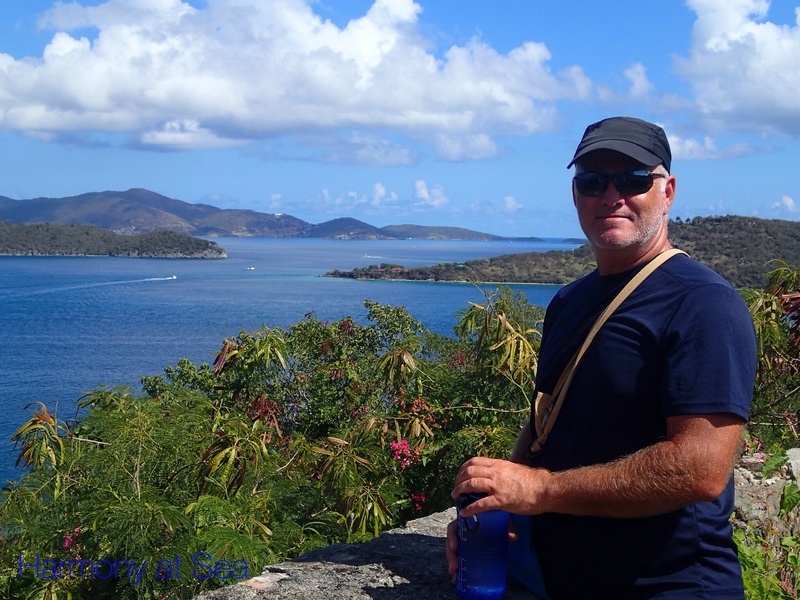 We hiked the Lind Trail on St. John, which offers great views of Cruz Bay and St Thomas. 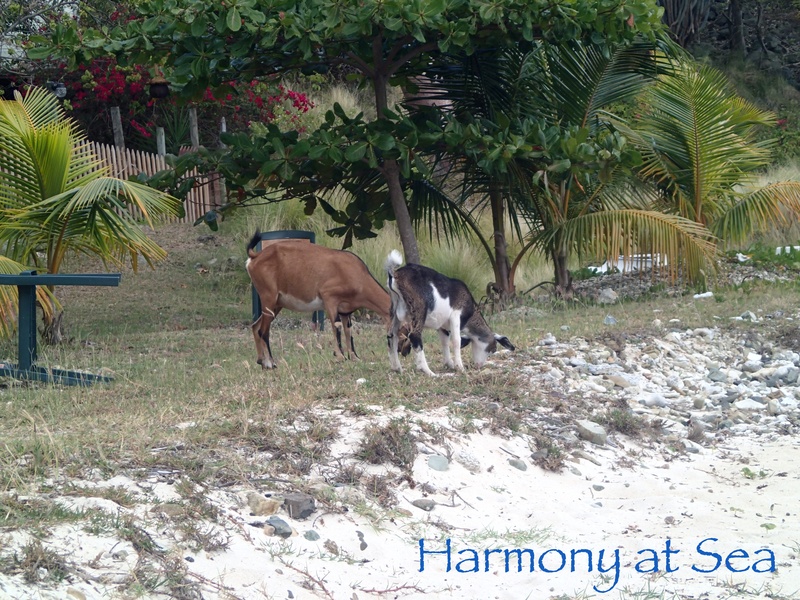 While visiting the Caneel Resort we saw the donkeys that roam St. John wandering through the resort . 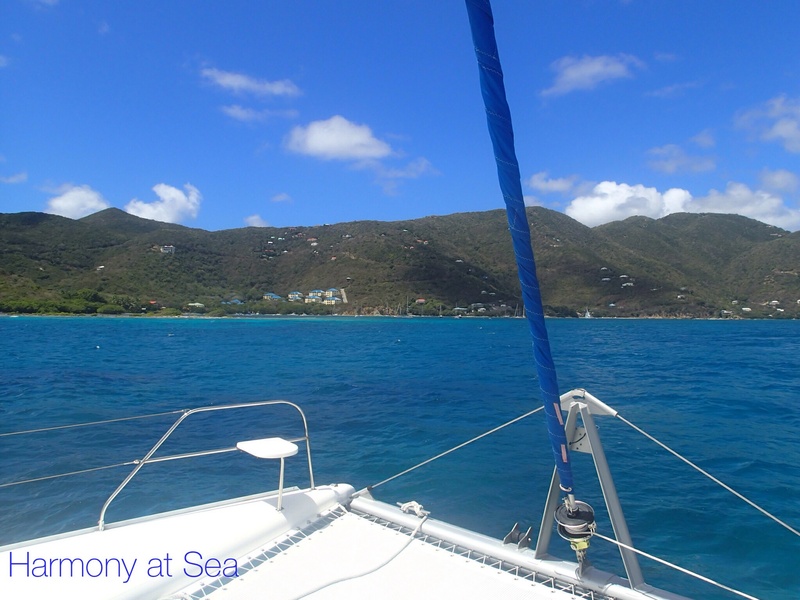 Yesterday we sailed to Charlotte Amalie, St. Thomas to wait for our water maker, order the Solar Panels, and shop for things to make the boat feel more like home. 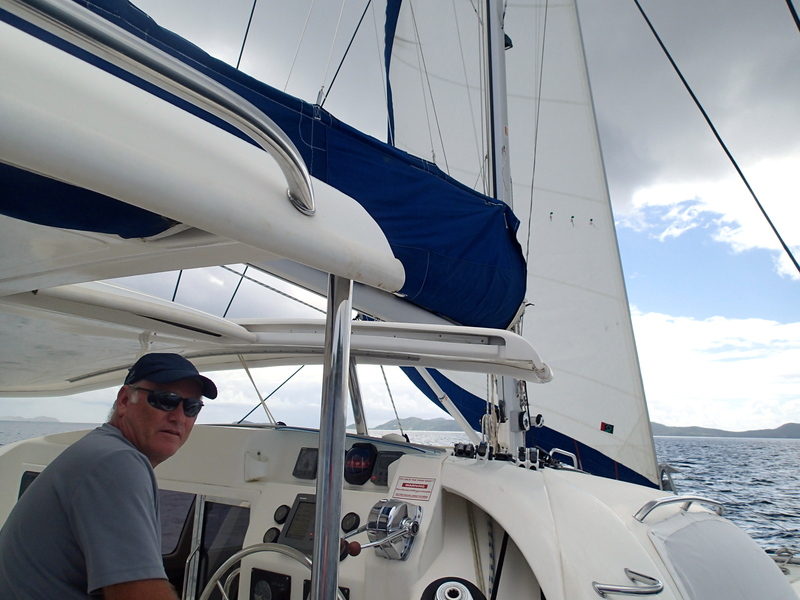 It was a windy crossing with large waves and 20 knot winds. 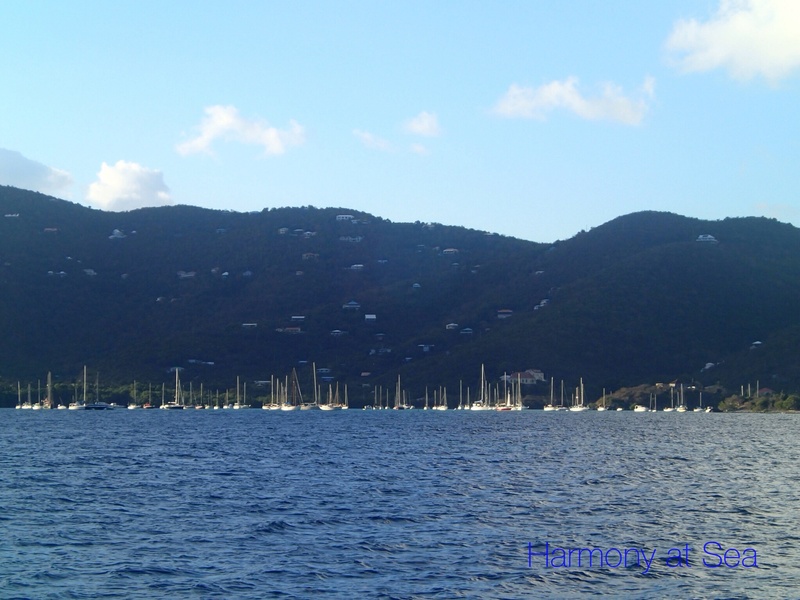 The anchoring at Charlotte Amalie was easy, it’s a large bay with plenty of space to anchor. 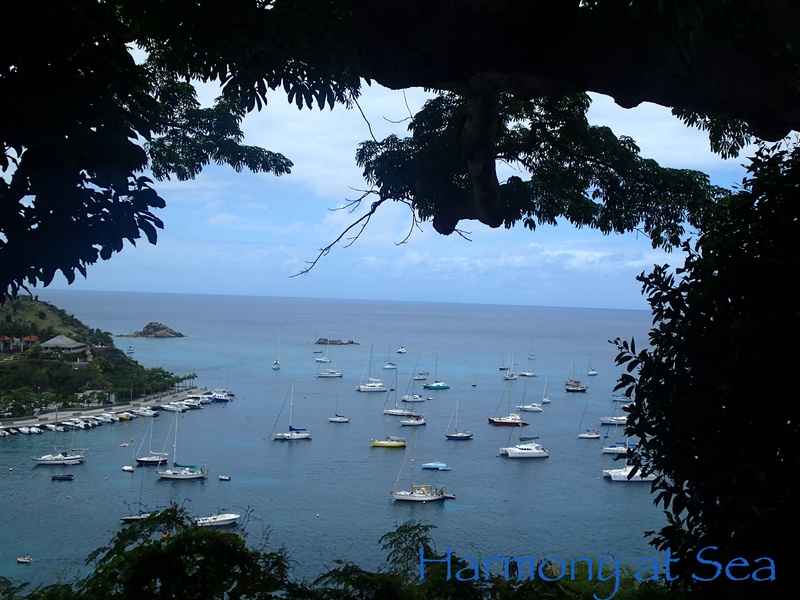 You can see all the Cruise Ships docked at the West Indian Dock and watch the seaplane land and depart. I would like to post more often but finding a good wifi signal to download pictures is not easy. 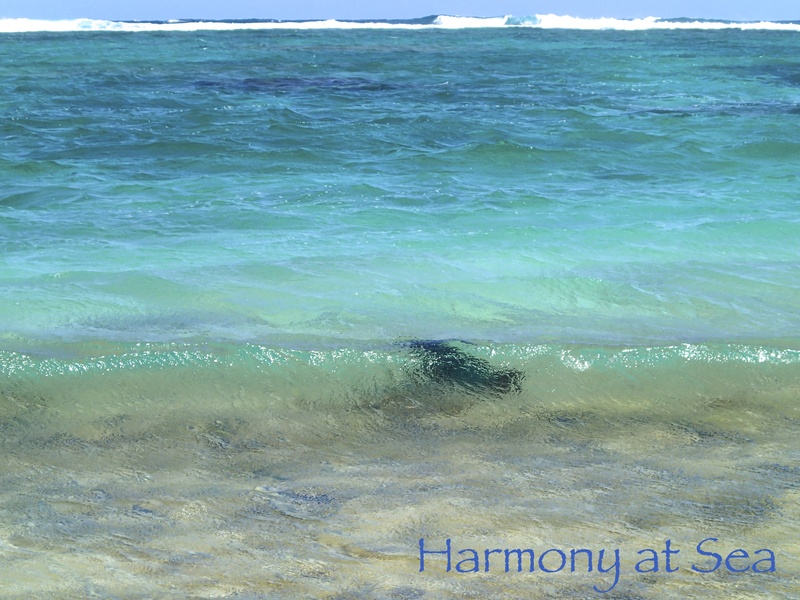 We are going to have to find a better way to stay connected… Working on it! 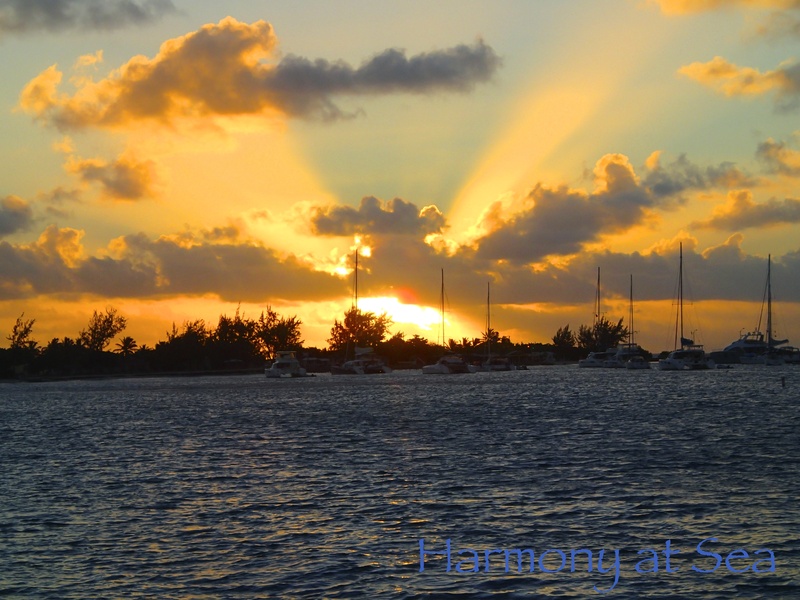 Right now we are at Nanny Cay Marina, the wifi is good, so here is an update to what we have been doing for the last 15 days. 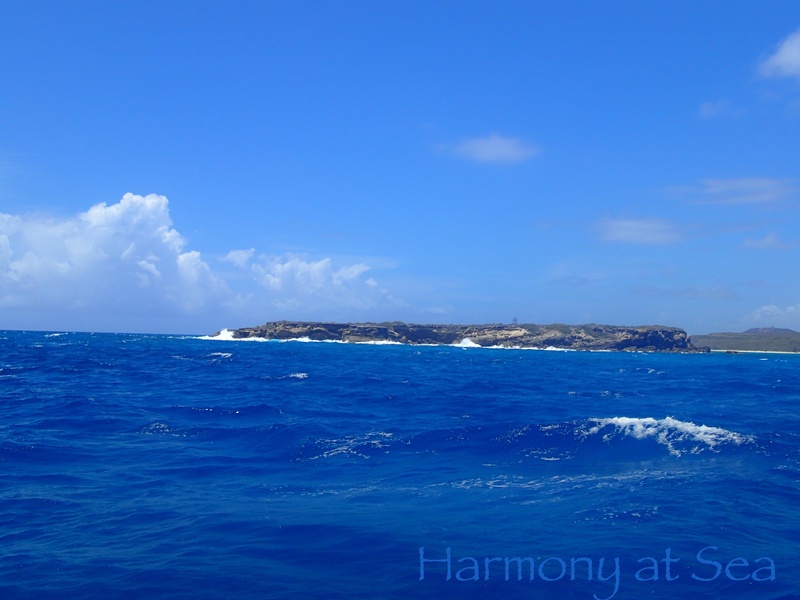 We have been sailing and visiting the islands, some we visited last June, and some for the first time. We had to detour to a Marina t0 make repairs to one of the engines, nothing major (break out another thousand)but it has to be done. 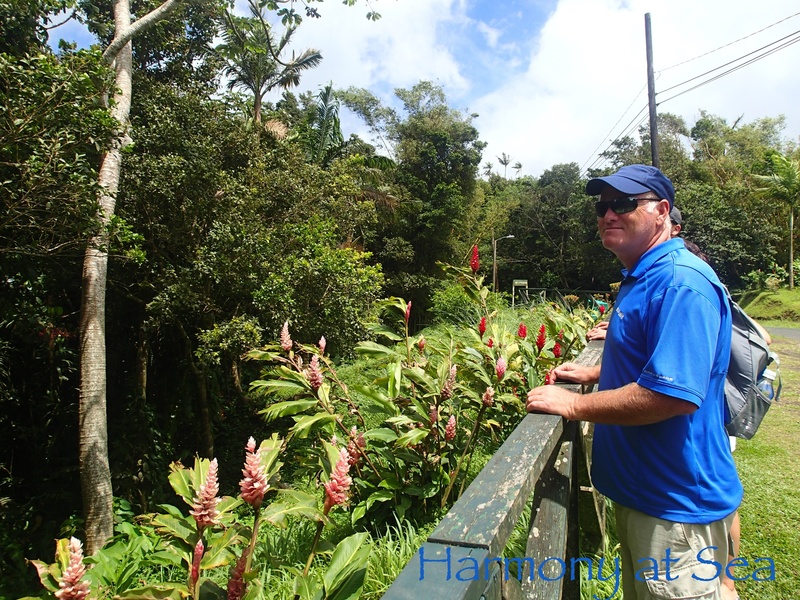 The weather for the most part has been great, sunny, nice breezes, and a little cool at night. We had a couple of cloudy days with rain. We have also experienced the “North Swell”, large seas created by weather systems from the North which cause some of the anchorages to get very choppy. 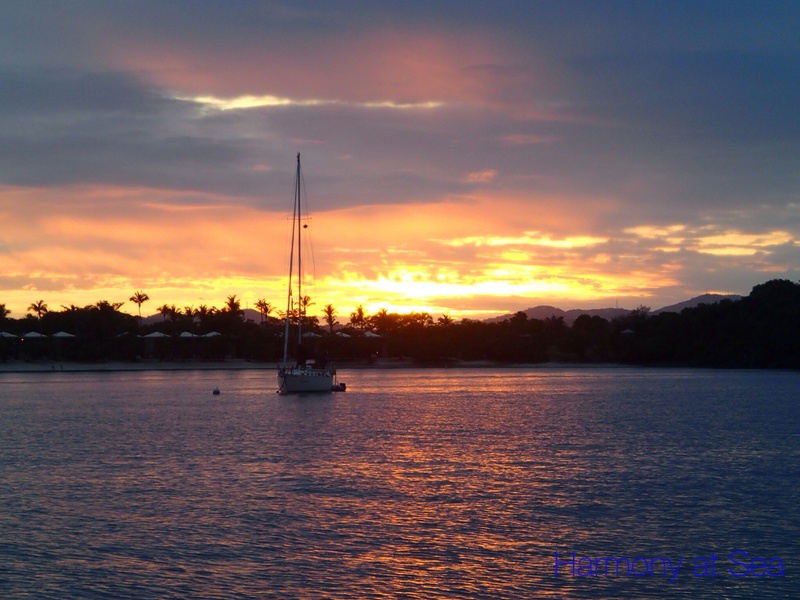 Living on a sailboat is not always beautiful. 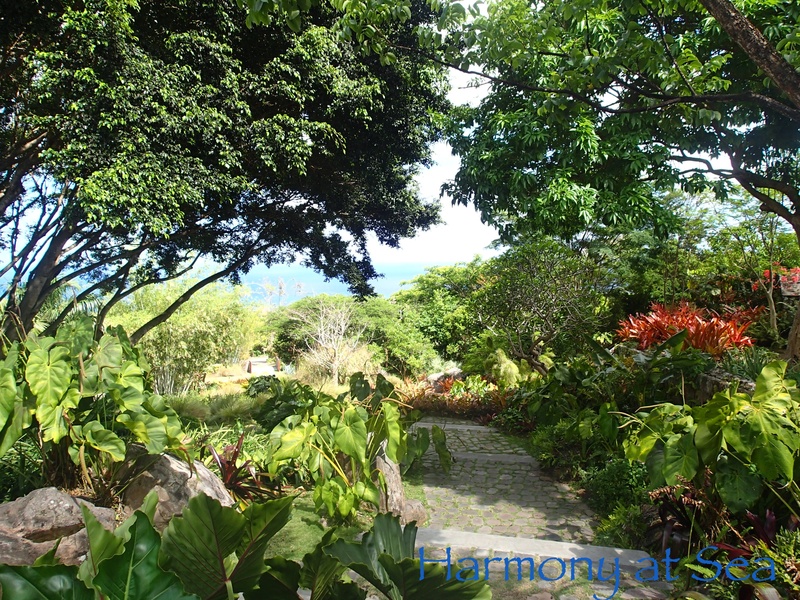 I hate the flies & mosquitos, fortunately they are not an issue most of the time. When it rains and we have to close the boat up it can get very hot. I would love to have an A/C when it rains, and Royce says break out another thousand. 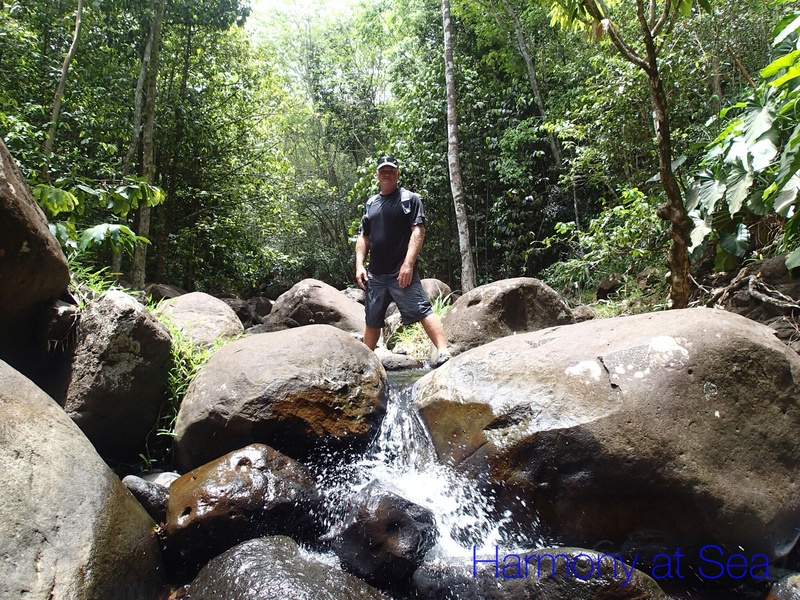 I am still trying to get use to the short & fast showers … but all of the negatives go away when we look at the paradise that surrounds us. It cannot get better than this. 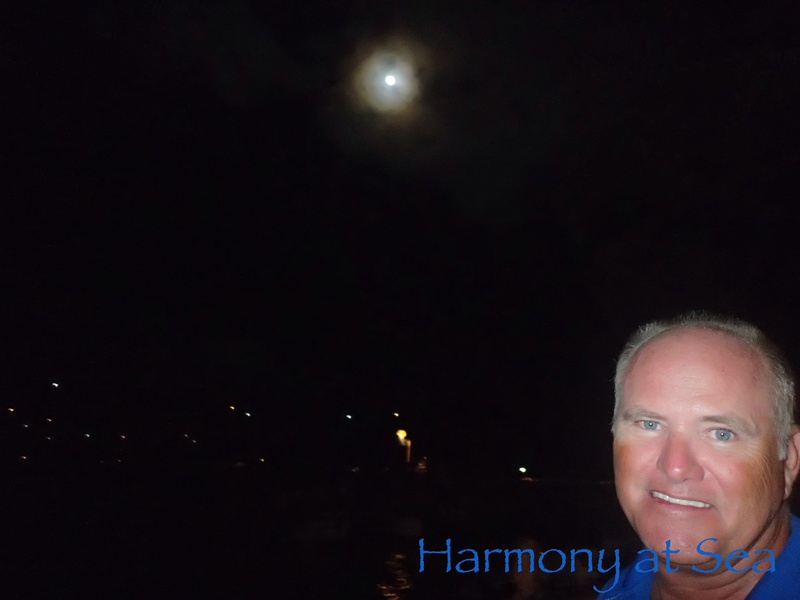 Every night we lay on the front of the boat looking at the stars and we fill so blessed and grateful for this experience! 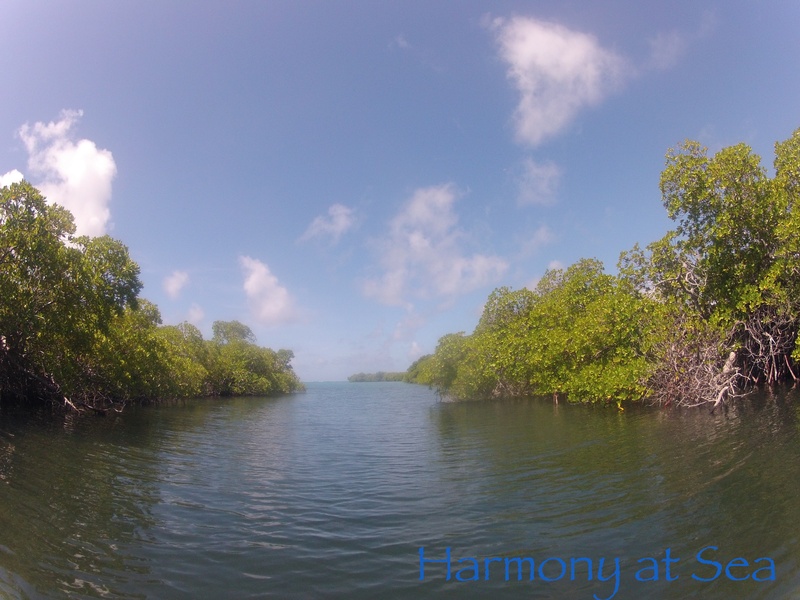 Arriving at Diamond Cay, it is so beautiful. 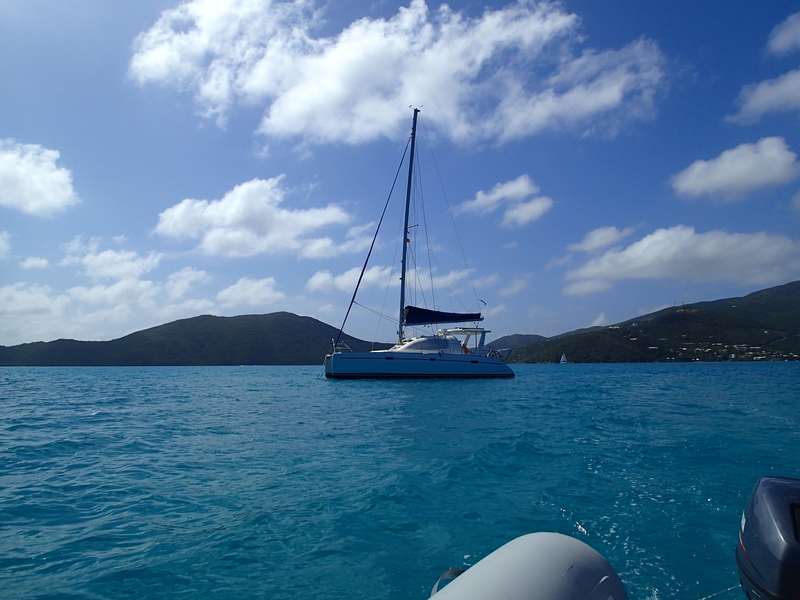 We are sure there will be many other anchorages, but for now this is our favorite one. 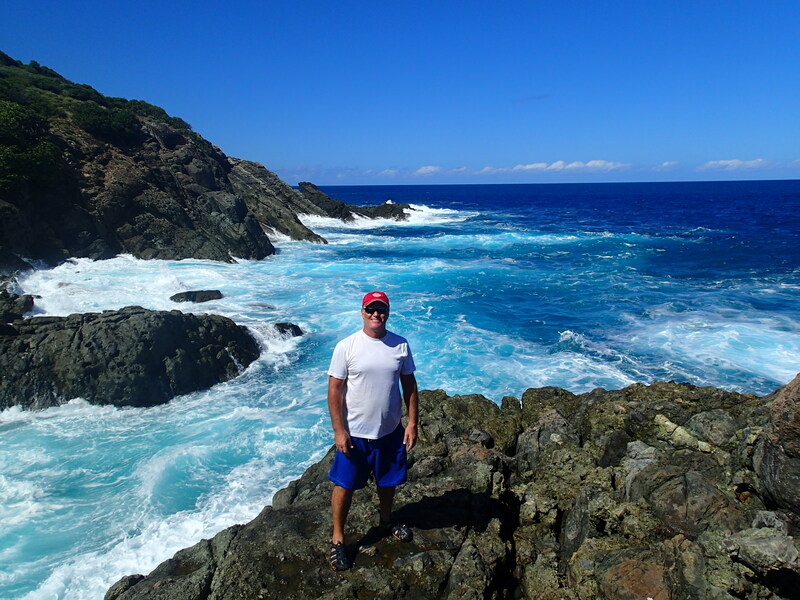 Visit to the Bubbly pool. 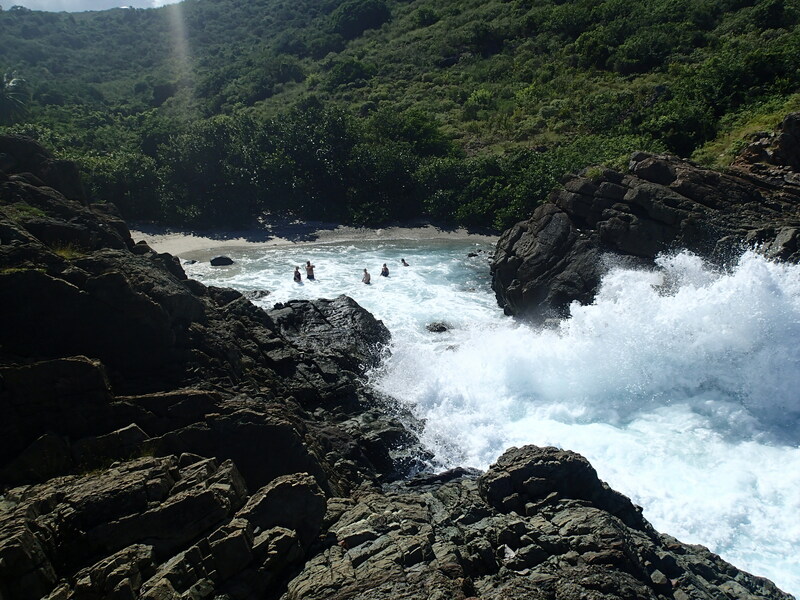 The water surges thru the rocks and creates a whirlpool. 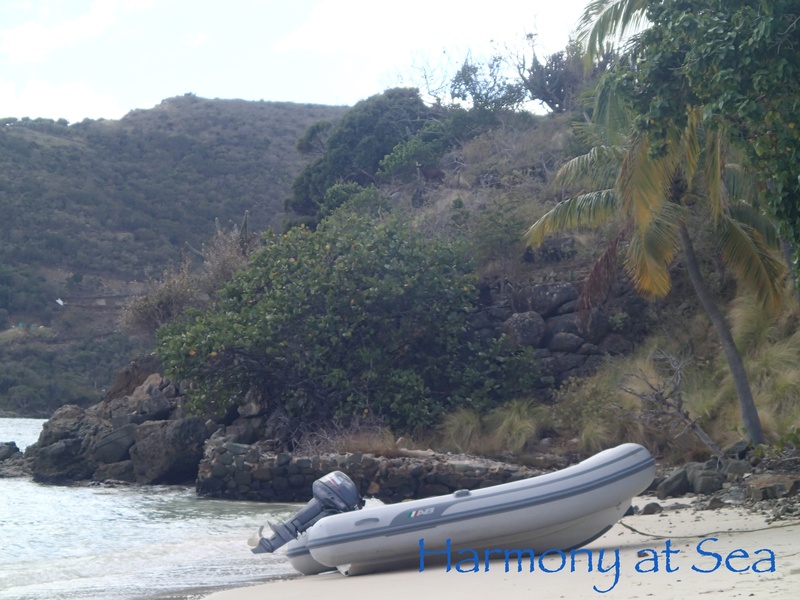 Dinghy visit to Sandy Spit, gorgeous small uninhabited island close to Diamond Cay. Ideal for a picnic day. We enjoyed watching the surfers at Cane Garden Bay. It has been very pleasant to be back at Great Harbor. 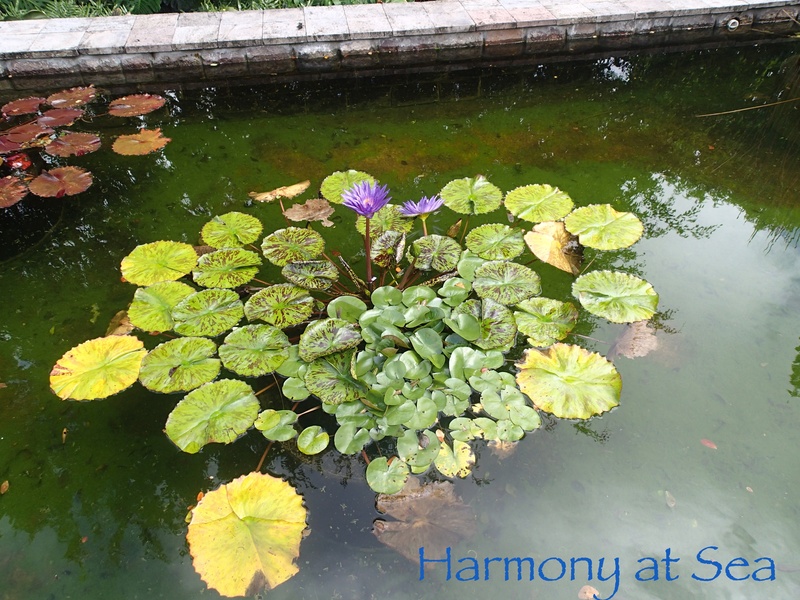 It is beautiful and peaceful. 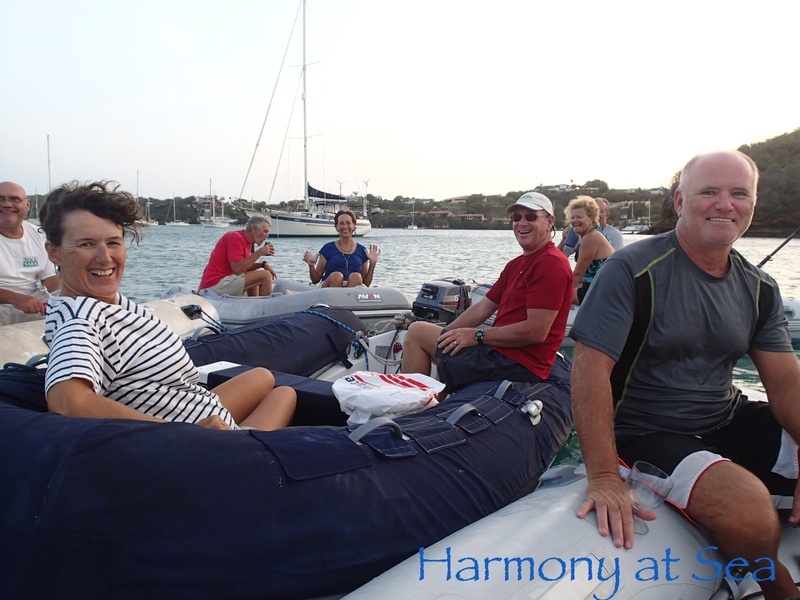 We took a couple of days just to relax and enjoy before finishing with the boat work. 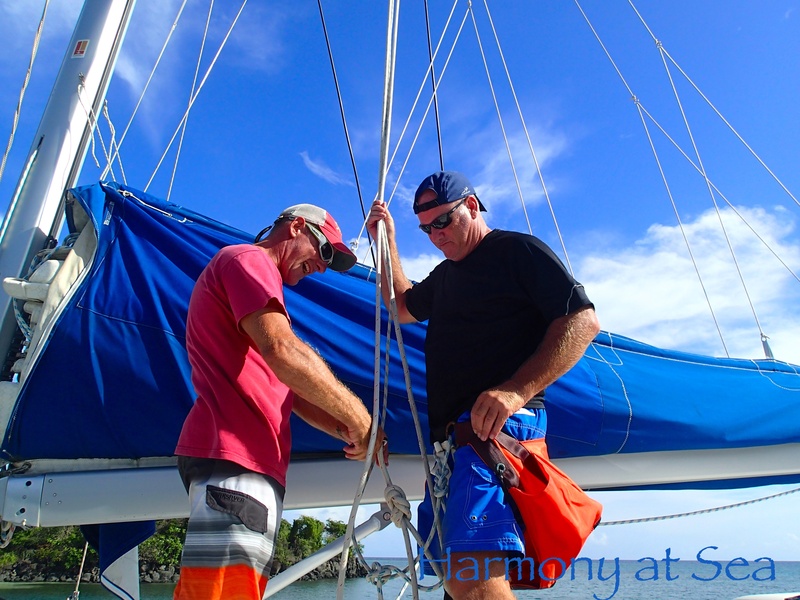 Royce was able to fix the engine starter, we put the headsail back on, and we took time to snorkel. 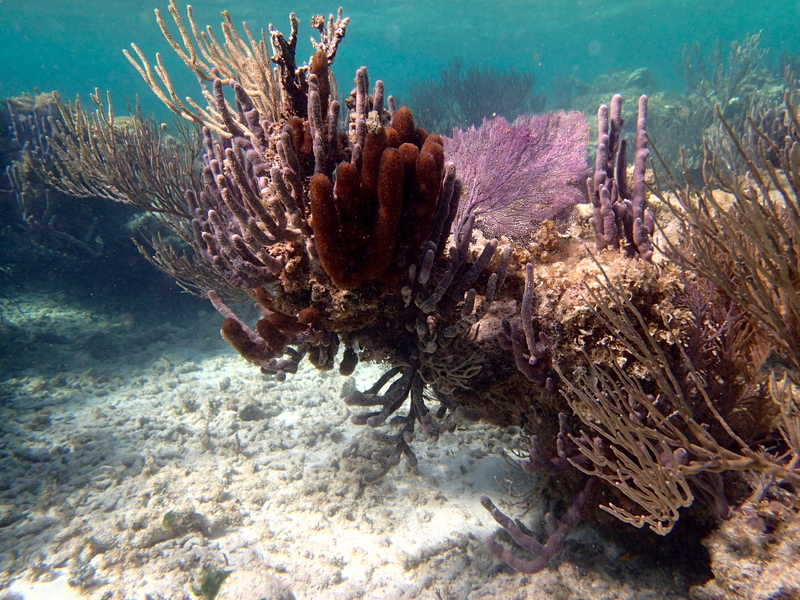 There is a nice coral reef here. 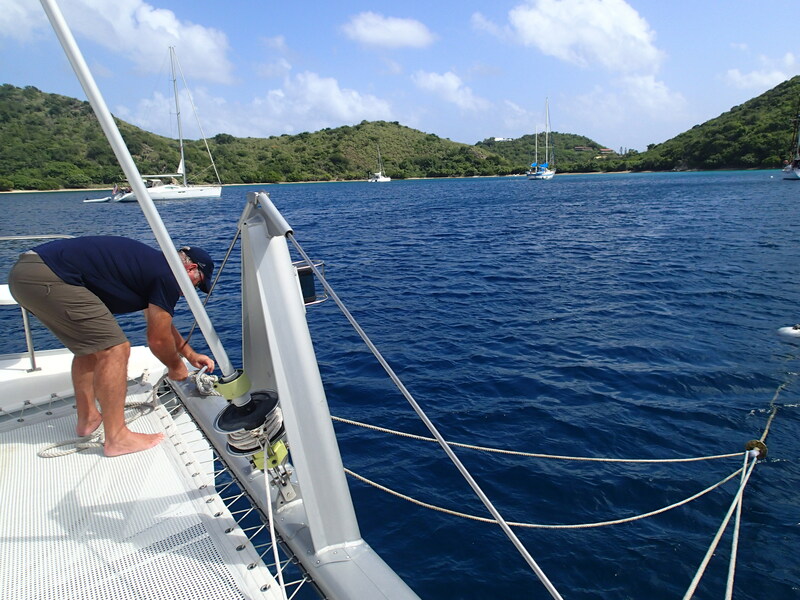 Royce adjusting the lines in the mooring ball. 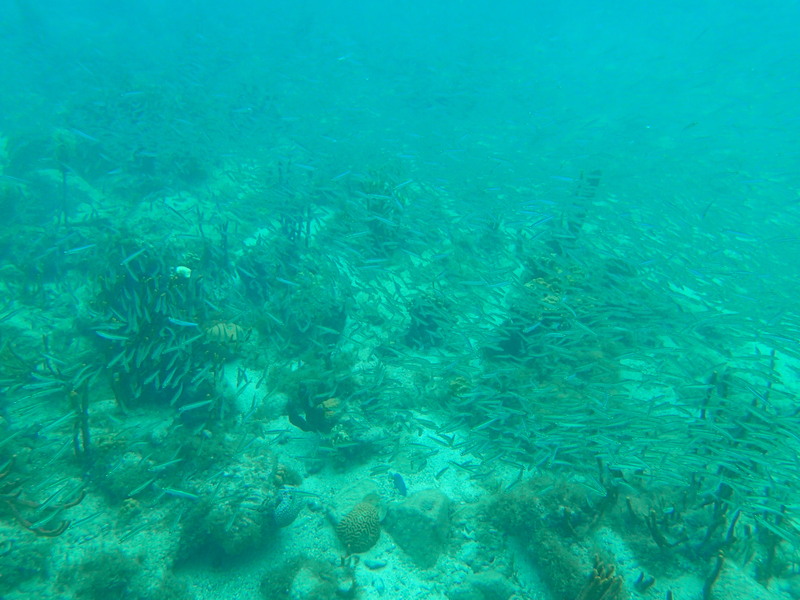 Lots of small fish, very colorful.